Plastic litter has become a mammoth challenge today, threatening the world’s marine life, marine ecosystems and ultimately human health. 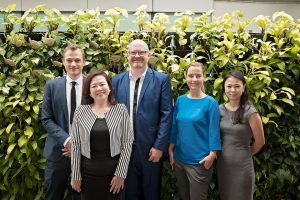 An international group of over 50 attendees came to SSA on 21 March 2019 for a panel dicussion organised by the Norwegian Embassy in Singapore, to hear industry experts share the best practices from their organisations and their views on the new way forward in dealing with the plastic economy. The event speakers included Ms Esther An, Chief Sustainability Officer of CDL, Mr Morten Høglund, Norway's Ambassador to ASEAN, Mr Kim Stengert, Chief Strategic Communication and External Relations of WWF Singapore and was moderated by Ms Kakuko Nagatani- Yoshida from the UN Environment. 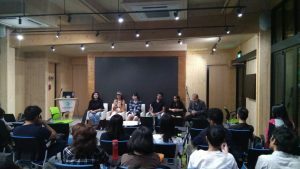 In celebration of International Women’s Day, Women in Energy Asia (WIEA) organised a panel discussion on the topic, “Energy In The Sustainable Age - How Women Lead The Change”. The panel of speakers who spoke to the audience of over 80 business professsionals included: Ms Esther An, Chief Sustainability Officer, City Developments Limited; Ms Yeo Lian Sim, Special Adviser Diversity of Singapore Exchange; Ms Isabel Chatterton, Manager of Asia Pacific Private Public Partnership, International Finance Corporation and Dr Lerwen Liu, Managing Director of NanoGlobe Pte Ltd.
20 participants gathered at the SSA to take part in the first public SDG 2030 Games organised by iGNICA in Singapore. It is a card-based game that simulates taking the “real world” into the year 2030. Designed in Japan in 2016, this experience has become a powerful and impactful social phenomenon in Japan, earning extensive media coverage and reaching over 50,000 participants over the last two years. Participants found the SDG Games session a novel and fun way of making them realise and ponder how the SDGs relate to their lives at a personal and social level. In this training facilitated by Ms Ria Tan, founder of Wildsingapore.com, 30 participants from the environmental community learnt the tips and tricks of being a good nature guide. Their classroom learning at SSA was followed by an outdoor field session the next day, to apply what they learnt into practice. The group joined volunteers from the Naked Hermit Crabs on a tour of the Berlayar Creek mangrove boardwalk, where experienced guides from the green community demonstrated the "how-to" for nature guiding. International Women’s Day on 8 March is a globally recognised day to celebrate the social, economic, cultural and political achievements of women from all generations. In line with the 2019 campaign theme #BalanceforBetter, Cushman & Wakefield’s Women in Networking (WIN) Committee held a panel discussion at the SSA, featuring speakers from CDL, Tembusu Partners, WORD Agency and Cushman & Wakefield who discussed the topic of gender balance in the corporate world. More than 80 industry professionals attended the event. Secondsguru, a social enterprise dedicated to promote eco-awareness, conducted its one-day Zero Waste Bootcamp at the SSA. This workshop was their first in a series of four sessions this year, to train youths aged 18 to 30. Participants worked in groups of four to create action plans for guiding their target audience in the community to embrace sustainability. 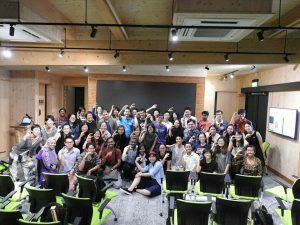 This inaugural bootcamp series was launched in support of Singapore’s Year Towards Zero Waste and as a fringe event in conjunction with Ecobank 2019. Dr Amy Khor, Guest-of-Honour for EcoBank’s opening and Senior Minister of State for the Ministry of the Environment and Water Resources, interacted with the workshop participants while she was at City Square Mall, joined by CDL’s senior management,Group CEO Mr Sherman Kwek, Group GM Mr Chia Ngiang Hong and Chief Sustainability Officer Ms Esther An. Over 60 nature lovers attended a talk organised by Nature Society featuring author, ornithologist and conservationist, Mr Robert Ridgely, as the special speaker. Robert is a leading expert on the birds of South and Central America and a proponent of private reserve systems as a conservation strategy for endangered species. Attendees were enthralled by Ridgely’s discovery of a new species of antpitta (subsequently named as Jocotoco Antpitta) during his trek through the Andes in Southern Ecuador with a fellow birder. The bird is peculiar because of its unique call: it hoots, and it barks. Ridgely also shared stories of how he and his colleagues founded the Jocotoco Foundation, to protect the species from imminent extinction. The Jocotoco Foundation now protects a total of nearly 60,000 acres at 14 reserves, the most recent being Isla San Cristobal in the Galápagos. Climate Conversations, a volunteer-run organisation, conducted a two-day workshop at the SSA to train their new volunteer facilitators on how to conduct small-group, in-depth discussions about the seriousness of climate change and motivate people to take action for a sustainable future. By growing awareness and public support for climate solutions, Climate Conversations empowers people to take meaningful steps towards integrating sustainability into their daily lives. Plastic is one of the biggest environmental issues in the world and demands urgent action from all sectors. 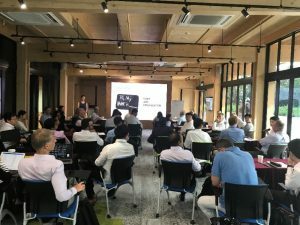 Under the voluntary business-led Plastic ACTion (PACT) initiative by WWF in Singapore, WWF convened a corporate roundtable with around 30 corporate players from the real estate and service platform industries to discuss about concrete actions to reduce plastics usage within their operations. In the roundtable, attendees discussed the impact of corporate contributions and shared on their commitment to reduce plastic usage. CDL CSO, Esther An, was a participant at the roundtable and shared about CDL’s best practices and initiatives in engaging tenants and home owners to be more environmentally-conscious. 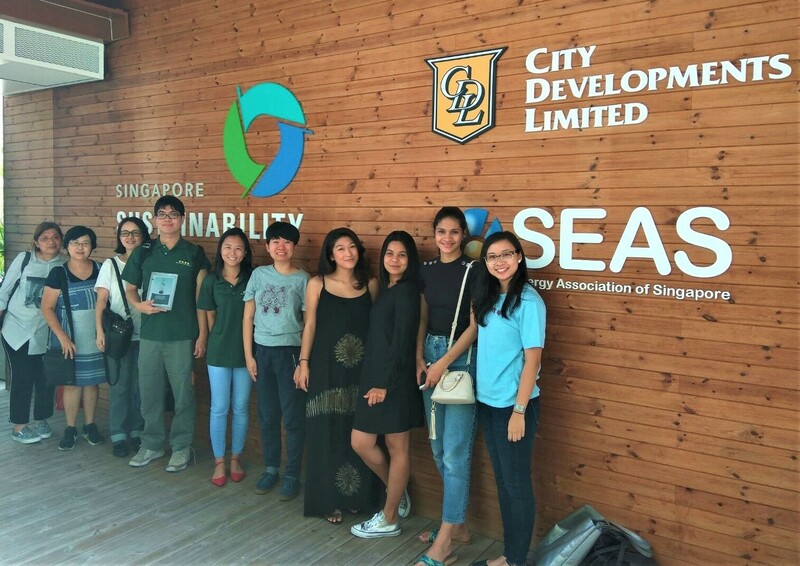 24 Bachelor of Architecture students and 5 faculty members from BMS College of Architecture, Bengaluru, India visited Singapore as part of their curriculum that examines sustainability in urban scale projects. 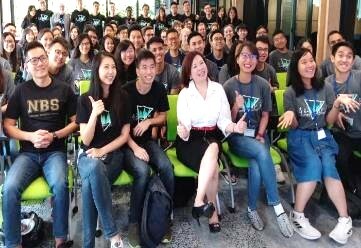 The students heard from CDL CSO, Esther An, on CDL's success story of creating future value and building partnership through sustainability. Following that, CDL Senior Manager, Projects, Alfred Ng, shared about the construction process of the SSA and the sustainable materials that went into its construction. The students and faculty members displayed enthusiasm during the Q&A, and a fruitful discussion about functionality versus sustainability ensued. 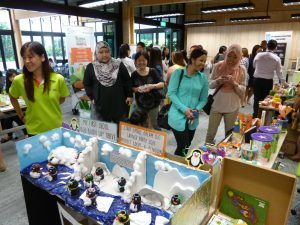 A total of 141 Environmental Education Advisors (EEAs) from 111 pre-schools attended the Pre-School EEA Networking Session organised by the National Environment Agency (NEA) at the SSA. The networking session is a platform for EEAs to network, share best practices on environment education and learn more about NEA’s initiatives that could incorporate values-based environmental education into their centre’s programmes. Following the presentations by NEA and its partners, a dialogue session, EEA Ask!, was held to uncover synergies between the pre-schools and NEA. 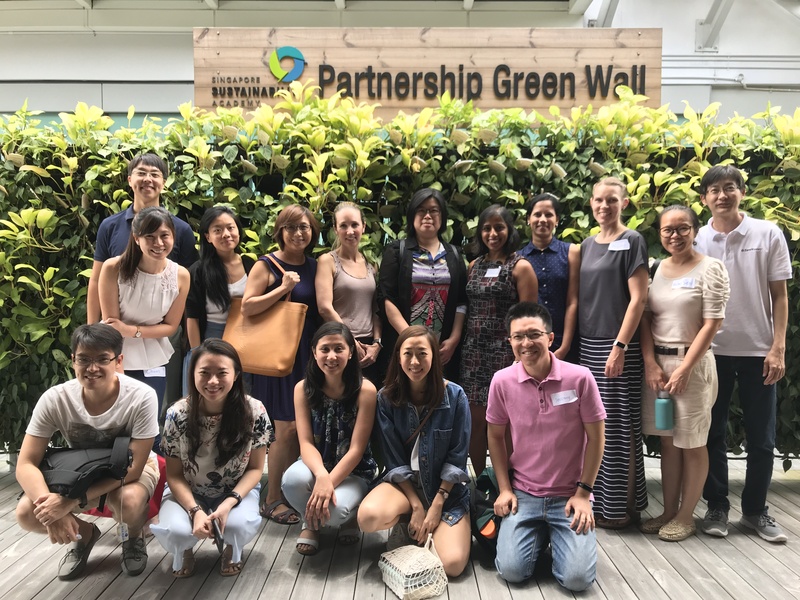 The teachers also had the opportunity to speak to Plastic-Lite Sg, Preschool Market, Public Hygiene Council, Restroom Association Singapore, Tetra Pak, The Food Bank Singapore and World Wide Fund for Nature to learn about the environmental activities available for pre-schools. The WWF Halt Technical Meeting was a private meeting between the world’s largest palm oil traders and WWF, regarding a palm oil traceability project. The 25 participants concluded the meeting with a renewed confidence that work will continue to be collaborative between private industries and WWF. CDL’s 14th EHS 5 Star Awards recognised the outstanding builders and suppliers who have been instrumental in enhancing and maintaining high workplace health, safety and well-being standards. Pioneered by CDL in 2001, the 5-Star assessment system is an independent audit tool to assess, measure and improve builders’ EHS management and performance. CDL was the first private-sector developer to proactively structure a comprehensive, audited and appraised approach towards EHS involving all its builders. The CDL EHS Excellence Awards were presented to contractors who attained the top tier for their EHS scores, while three workers from Kajima, Woh Hup and Ssangyong won the CDL Workers’ Welfare Award, which honours builders who have devoted excellent effort to ensure workers' welfare, including caring for their health, safety, living conditions and well-being. The awards was attended by over 50 guests representing CDL’s builders, architects and other consultants. The Global Platform for Sustainable Natural Rubber was established to lead improvements in the socio-economic and environmental performance of the natural rubber value chain towards a fair, equitable and environmentally sound natural rubber value chain. 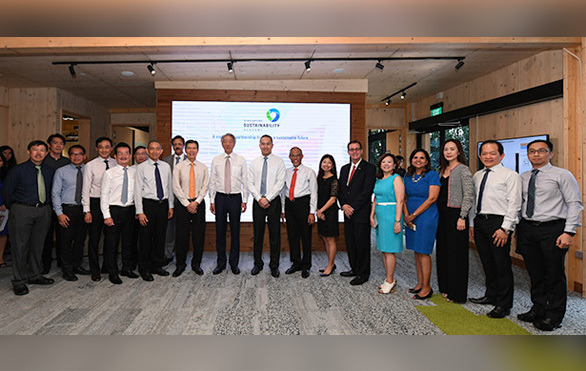 The multi-stakeholder workshop organised by the Business Council for Sustainable Development (BCSD) Singapore aimed at bringing the platform’s 56 founding members and interested stakeholders together to agree on a governance model and action plan for the platform. 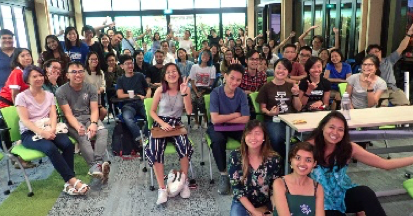 NUS and NEA co-organised the Youth Networking Session which was attended by 35 youths from various tertiary institutions from NUS, NTU, and SUTD. Participants played games to experience the complexities of environmental management decisions, and explored the consequences arising from their decisions. The workshop also aimed to equip participants with tools that can be used to communicate environmental messages in a more engaging manner. Dr Pablo Suarez, Artist-in-Residence at Lloyd’s Register Foundation Institute for the Public Understanding of Risk, facilitated this interactive workshop. Every action begins with a thought. 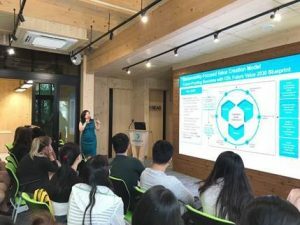 To drive behaviour change, WISE – WASH held an introductory workshop for members of the public interested in making positives changes in society. This full-day workshop consisted of engaging lectures, discussions, and hands-on activities. Participants explored factors that influence behaviour, methods to identify barriers to and motivators of behaviour change, techniques to change behaviour and craft effective behaviour change messages. Shared by one of the participants, "It was truly enjoyable learning about behaviour change from the fun and knowledgeable instructors at WISE. They managed to share a lot, and deliver effectively, in the time we spent." By the end of this workshop, participants are better equipped with skills to design projects that would achieve positive changes in behaviour more effectively. 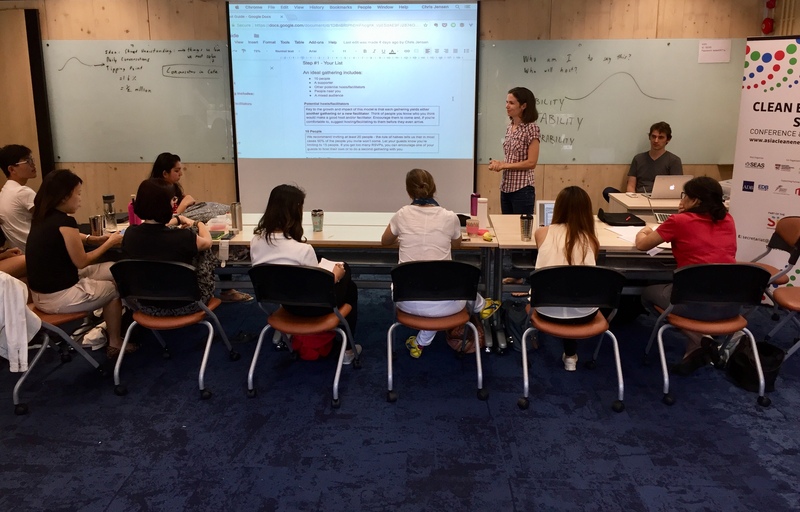 The Designing for Behaviour Change Workshop is part of WISE – WASH’s training and mentoring program to build the capacity of organisations and individuals to create social impact. 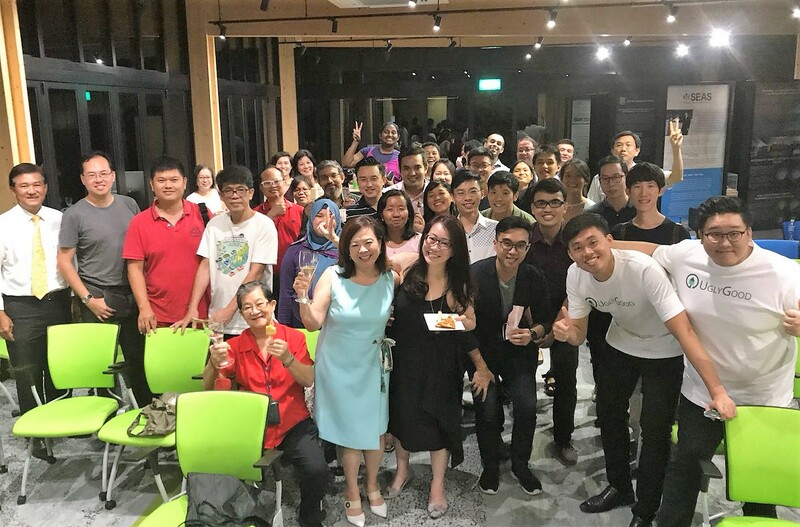 Approximately 50 participants from Movement for the Intellectually Disabled of Singapore (MINDS) MYG, a volunteer wing of MINDS, attended the MYG Learning Day on 12 Jan 2019. The session aimed to connect clients and caregivers to resources that they can tap on, as a reflection of their effort in cross-sector collaboration. Through the facilitation by experienced trainers, the caregivers had heightened awareness of available resources, identification of red flags pertaining to clients' needs, and learnt how to provide care without diminishing their clients’ autonomy. Trash or treasure: What does a zero waste business look like? 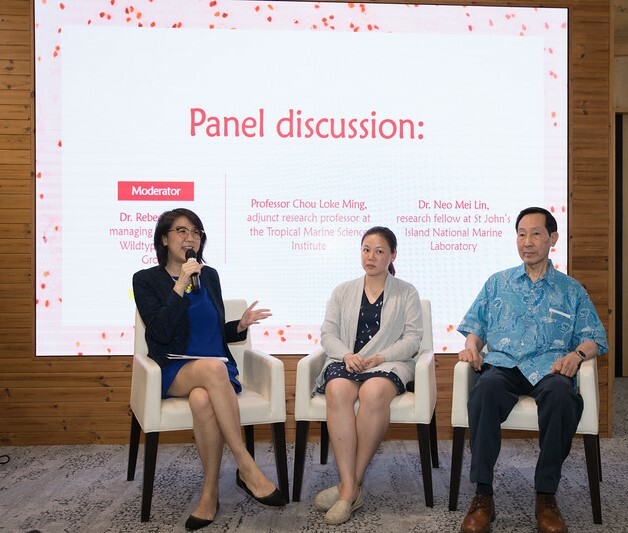 In support of Singapore’s declaration of 2019 as the Year Towards Zero Waste, CDL and Eco-Business jointly held a panel discussion that attracted an audience from the 3P sectors. 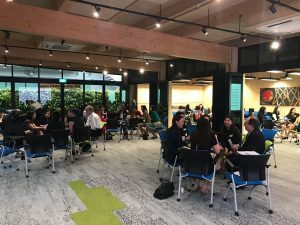 Approximately 120 people listened to industry experts from Eco-Business, Greenpac Singapore, Fuji Xerox Singapore, Unilever Singapore and Food Bank Singapore on how they integrate sound environmental practices into everyday operations and transform waste streams into value for businesses, the community and the planet. Eco-Business also shared a sneak preview of its upcoming special feature on Southeast Asia's love-hate relationship with e-waste. 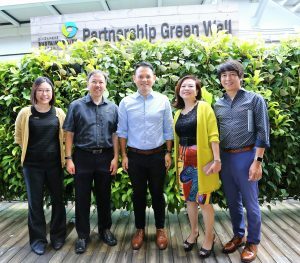 Supported by CDL, Project Eco-Office is a programme by Singapore Enviroment Council (SEC) since 2002 that aims to encourage office workers to adopt low-carbon practices – the ‘heartware’ that complements the ‘hardware’ of green infrastructure and office buildings. This Eco-Office Share & Learn Session held at SSA brought together 30 participants from the people, private and public sectors. Besides having an enriching talk by SEC, participants had the opportunity to exchange success stories, thoughts and ideas on overcoming challenges faced when greening their workplaces. WISE is an organisation that enables communities in Indonesia, Cambodia and Singapore to improve their water, sanitation and hygiene practices through community development, capacity building and behaviour change. Their December workshop, supported by National Youth Council, received active participation from attendees in the private and non-profit sector. The full-day course equipped these 30 attendees with the skills and knowledge for designing interventions and promoting positive behavioural changes in people. 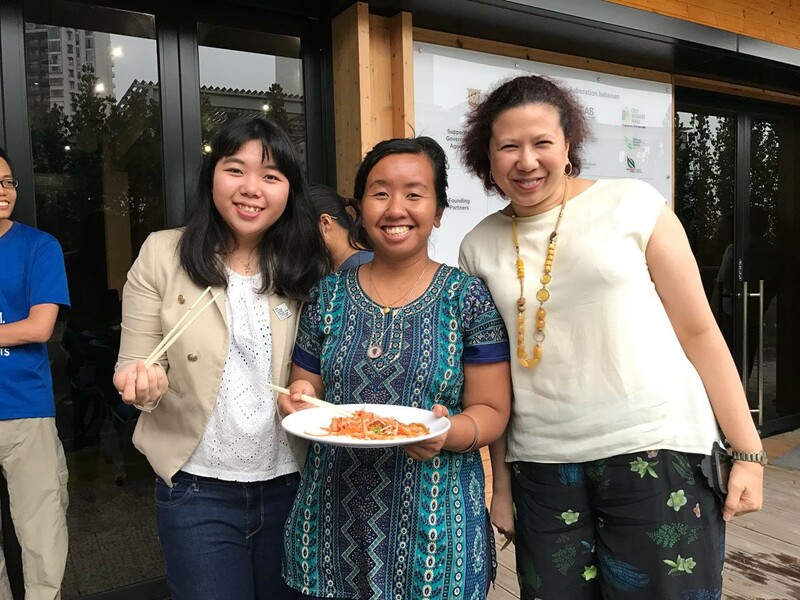 Young Sustainable Impact SEA is a youth-led community in Southeast Asia that aims to nurture youths into social innovators, and helps them to form regional alliances and solutions aligned to the SDGs. 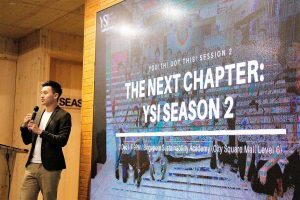 A sharing session was held by the YSI SEA about their Singapore Innovation Programme (SIP) at our SSA. The audience were also treated to a screening of the documentary named “A SEA of Change”, directed and filmed by Ong Kah Jing. Ong Kah Jing is a recipient of the 2017 National Youth Film Awards and was nominated as the ASEAN Filmmaker of the Year at the 10th International Kuala Lumpur Eco Film Festival. The session wrapped up with an update and call for applications for SIP 2019 by YSI SEA’s co-founder, Irsyad Ramthan. 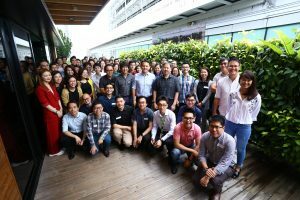 Over 90 young leaders of the built industry attended the BCA Built Environment Young Leaders Retreat on 6 Dec 2018. 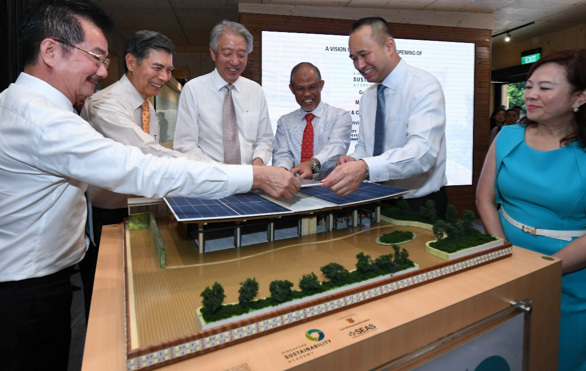 The event was graced by Mr Zaqy Mohamad, Minister of State of Ministry of National Development and Mr Hugh Lim, CEO of Building & Construction Authority. They shared their knowledge and insights of the future of the built environment over an engaging dialogue session. The young leaders also shared their views on ways that innovation can be supported and how data can be harnessed in the built environment, over a table discussion. The Singapore Blue Plan was drawn up in October 2018 to preserve Singapore’s marine habitat. It was an extensive effort by more than 100 contributors, including biologists, environmental lawyers and NGOs. About a month after its launch, over 50 people gathered on a Sunday afternoon in this workshop at SSA to examine ways to act on the Blue Plan’s recommendations. Dr Zeehan Jaafar, Lead Editor of Singapore Blue Plan 2018, led the discussion in groups. 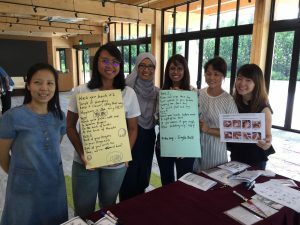 Together, they bounced off ideas on how to bridge the gaps in science communication at schools and how to generate more interest among youths about marine life in Singapore. 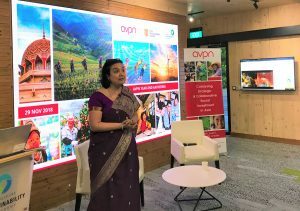 On 29 November, AVPN organised a year-end gathering for its members at the SSA to recap the association’s engagements in 2018 to catalyse social investments in Asia and chart out their next steps ahead. 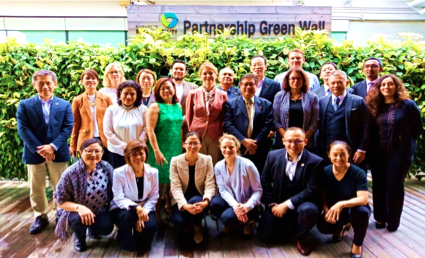 Attendees were representatives of funders and resource providers who are committed to sustainable investing and maximising impact in the Asian region. 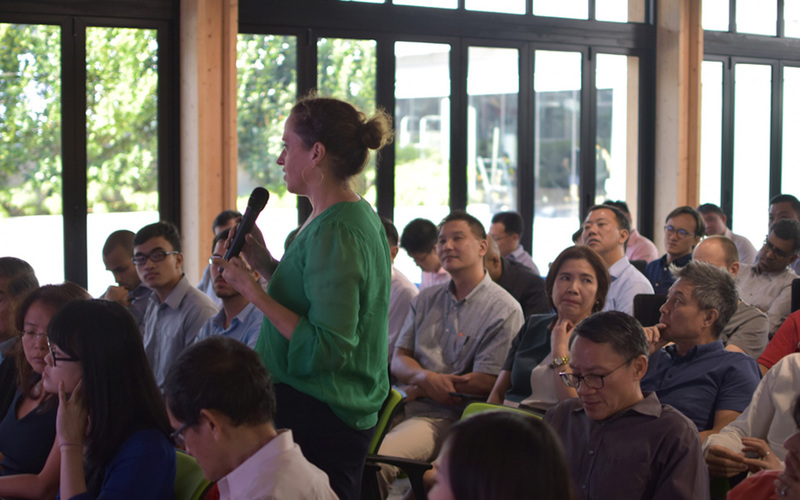 Over 70 professionals participated in an interactive session aimed at bringing together forestry stakeholders, leading technology providers, innovators and sustainability experts to exchange views on what is needed, what is working and where are the opportunities for scaling up innovative applications of technology for forest management. The sessions engaged participants in the ideation for a collaborative approach to address real situations in Myanmar and Laos pertaining to Sustainable Forest Management. The solutions from the ideation process is expected to be shaped into a partnership project to be implemented in the respective regions. Subject matter experts who presented include Trimble Forestry and Double Helix Tracking Technologies, which certified the wood used in the construction of the SSA. This talk organised by the Nature Society attracted a strong turnout of 100 attendees. The event highlight was the presentation by Dr Jim Frazier, rated by the BBC as one of the world’s top wildlife cinematographers. He has won over 40 national and international awards for his work including an Academy award and an Emmy Award. Dr Frazier is well known for his nature documentaries with Sir David Attenborough, setting the standard for wildlife television with award-winning series like “Life on Earth” and “The Living Planet”. At the talk, Dr Frazier shared about his film project titled, “Symphony of the Earth”, a wildlife feature film aimed at making a statement about the condition of our planet and its inhabitants. Dr Frazier also imparted his global perspective of the impact that humans have inflicted on Planet Earth, such as the extinction of some animal species. He also covered issues such as climate change, deforestation, ocean pollution and their devastating effects on birds and other animal populations worldwide. CDL’s staff volunteering group, City Sunshine Club (CSC), held a character building outing for 20 children from the Limbang community at the SSA. This initiative which started in 2017 strives to educate primary school children aged 7 to 12 on understanding, appreciating and applying ethical values through fun and interactive ways. Some of the core values taught to the children through games included truthfullness, responsibility and orderliness. Overall, the children had a fun day, bringing smiles to the CSC volunteers as well. 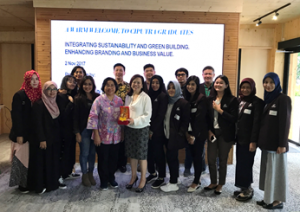 At this half-day sharing event organised by ASEAN CSR Network (ACN), a group of 20 participants from Thailand’s business sector had the opportunity to learn about Singapore’s sustainability practices. The speakers were Ms Sarah Kerrigan, Manager (Sustainability Services) of Deloitte Singapore and Mr Chia Boon Chong, Director (Group Sustainability) of Singtel. As a regional organisation, ACN provides a platform for networking and cooperation at the ASEAN level, supports capacity-building and training activities, helps to rally collective action on key issues, and provides a link with regional and international bodies interested in supporting the advancement of CSR in the region. 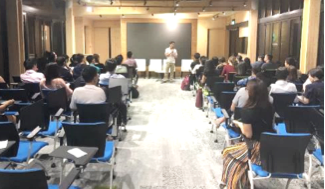 Our Singapore Reefs organised its first marine chit-chat session to provide a platform for like-minded Singaporeans to exchange ideas and encourage marine stewardship among youths in Singapore. 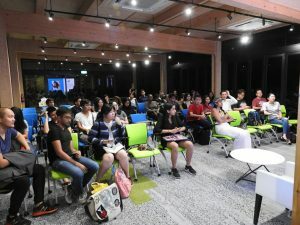 The talk led jointly by Mr Nathaniel Soon, founder of documentary collective “Our Seas, Our Legacy” and local marine researchers, Ms Joy Sim and Ms Sam Shu Qin attracted 105 attendees, with a number of them from the diving community. 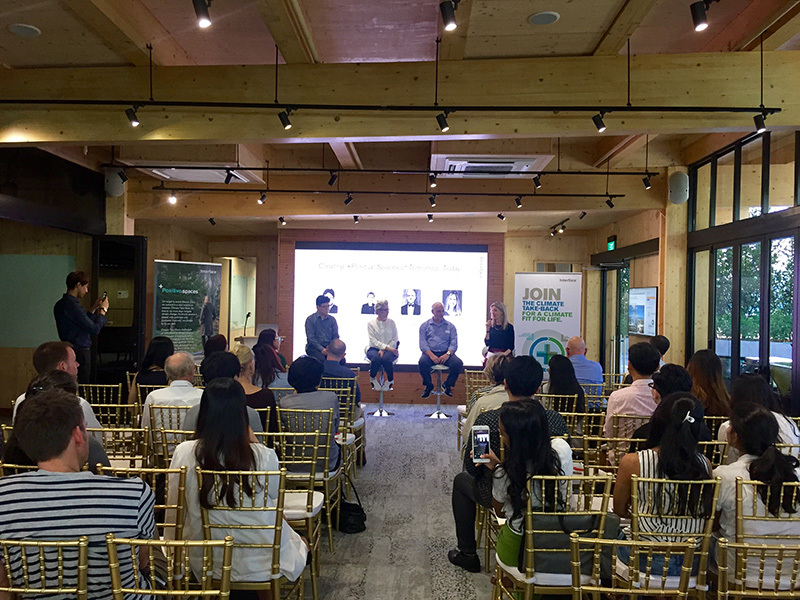 The event ended with a Q&A session and networking which promoted collaboration for the conservation of Singapore’s marine environment and biodiversity. Organised by the Swedish Embassy of Singapore, over 80 attendees came to hear from His Excellency Mr Bjorn Lyrvall, Swedish Ambassador for Arctic Affairs, Ministry for Foreign Affairs Sweden on his experience as a diplomat and participatant in the Arctic Council, which is made up of eight member countries, namely: Canada, Denmark, Finland, Iceland, Norway, Russia, Sweden, and the United States. As an expert in the Polar region, Ms Katarina Gardfelt, Director General (Swedish Polar Research Secretariat) shared her knowledge about the changes of climate change in the Arctic region as well as several scientific expeditions that the research centre is embarking on. 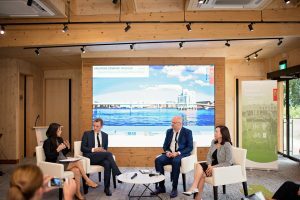 CDL and its partner, the Global Green Economic Forum (GGEF), also announced the launch of CDL E-Generation Challenge 2019 that same evening. The two winners of the 2019 Challenge will embark on a trip to the Arctic, together with Sir Robert Swan’s expedition in June 2019. The competition will open in January 2019. Over 30 overseas delegates including ambassadors from the region, guests from United Nations Local Networks, and business leaders from around the region came together at the SSA to discuss the latest in sustainability trends across Asia and Oceania and gain insights into what sustainability initiatives are implemented in different countries. Ms Lise Kingo, CEO and Executive Director of the United Nations Global Compact (UNGC) also graced the event to meet the delegates and tour the SSA. About 30 participants of UNGC’s Learning Journey Tour also joined the lunch networking session. All attendees were given a short presentation on the SSA by CSO Esther An. 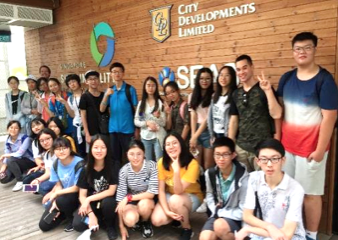 Skillseed Singapore facilitated 22 students from Dalton Academy in Beijing for an experiential learning journey in Singapore about urban sustainability. City Square Mall, Singapore’s first eco-mall and the SSA, as a zero-energy structure, became natural choices for the learning programme. The students tried their hands on making eco-bricks, which are building blocks made from plastic bottles filled with compacted clean, dry and used plastic waste. 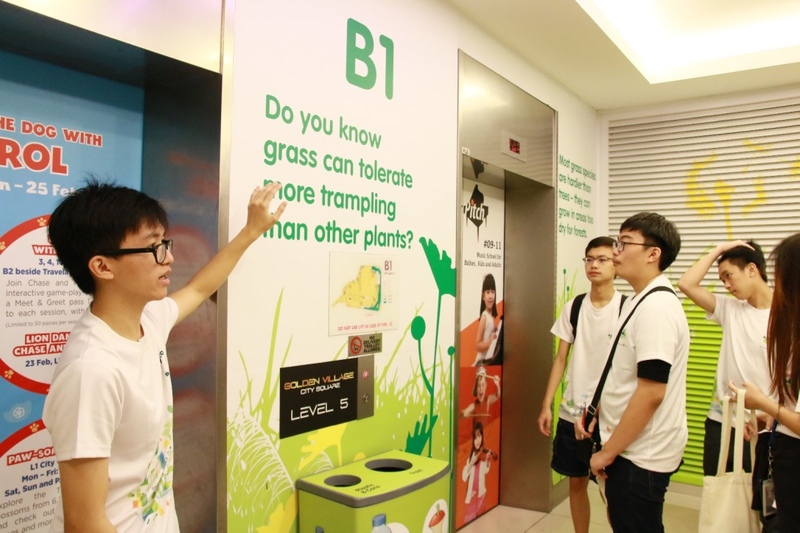 Following that, they explored the surrounding areas of City Square Mall to appreciate the native flora and gained an understanding of the waste management process in the facility. The ASEAN+Social Good Forum is an event organised by Impact Hub KL at the SSA to inspire conversations and showcase innovations that promote achievement of the United Nations (UN) Sustainable Development Goals (SDGs). 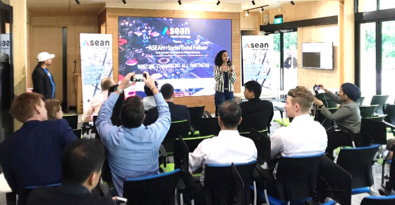 Four top teams from the 2018 ASEAN Impact Challenge pitched their ventures to the audience comprising of over 50 investors and members of the public, as well as the panel of judges consisting of Mr Chris Yeo, Regional Head of Grab Ventures, Ms Leza Parker, CEO of SC Beauty Network and Mr Eugene Ho, Head of Corporate Affairs of SAP. 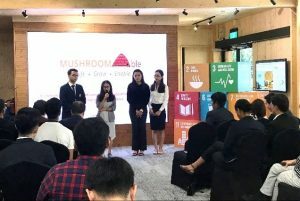 In addition, the judges and Dr Shariha, co-founder and board member of Impact Hub KL, shared their knoweldge and experiences over two panel discussions on how to build businesses aligned with the UN SDG goals and create an impact for social good. The issue of plastic bag usage has been gaining attention in the media. One of the more notable call-for-action was the motion to impose a charge for plastic carriers by Member of Parliament, Mr Louis Ng in October 2018. Mr Louis Ng is also the co-founder of Animal Concerns Research and Education Society (ACRES). 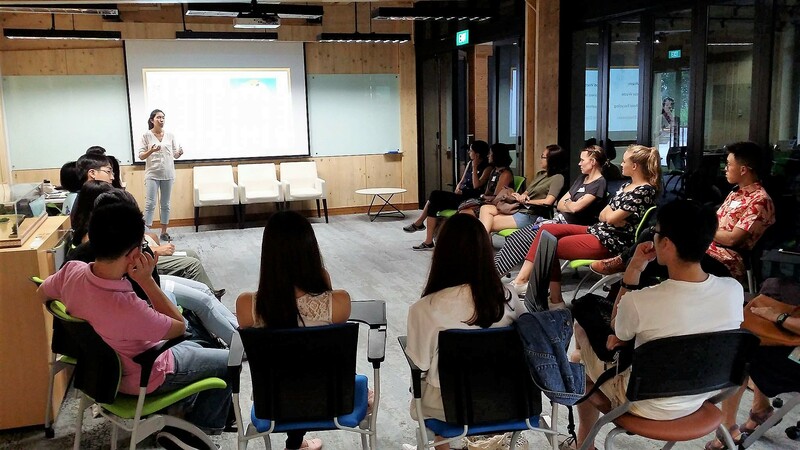 To gather more feedback and encourage dialogue about the over-consumption of plastic bags in Singapore, ACRES held a public forum at the SSA. Issues that were discussed during the session included various environmental concerns in Singapore as well as policies that could be improved to protect the environment. About 30 members of the public attended the event, contributing to the lively discussion that evening. 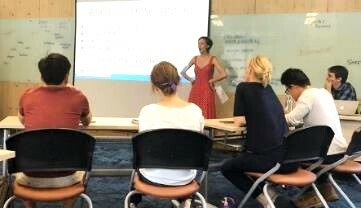 As part of the Singapore Eco Film Festival programme, about 20 audience heard from Raye Padit, founder of the Fashion Pulpit, regarding the journey of discarded clothing and the detrimental environmental impact caused by unethical businesses in the fashion industry. Participants also had the chance to create an art installation by weaving T-shirt yarns together, taught by Ms Agy, a textile artist. The art piece was crafted in the style of Peranakan tiles, and depicted the flora of Singapore. 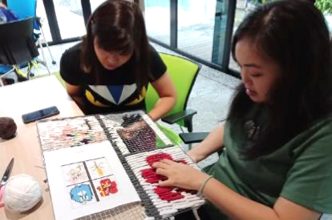 The mission behind this handmade artwork was to break the Singapore Book of Records for Singapore’s Largest Knotted Artwork made of upcycled T-shirts. Overall, the event organised by Colours of Singapore was a fun and educational way to deepen one’s awareness of sustainable fashion. Tingkat Heroes is a local NGO focusing on zero waste, founded by a passional youth, Pamela Low. Its first sustainability camp for youths, was held at the SSA on 13 October 2018. Attended by 47 participants, the workshop dived into a variety of topics including fashion, diet, plastics and e-waste. There was also an interactive dialogue between the youths and CSO Esther An. Esther shared about CDL’s sustainable practices, SSA’s role as a collaborative space to advance the sustainability agenda and how youths can become active contributors to the green cause. In line with the event theme, the campers enjoyed a wholesome vegan lunch made from “ugly vegetables” collected by SG Food Rescue. To sum up their learning, the participants gathered around in World Café style to share their reflections and urged one another to press on even after this event, in their pursuit for sustainability. The Social Sector Milestone Programme is a 12-day programme by the Civil Service College, for officers holding middle management positions under the Public Service Leadership Programme (PSLP) Sectoral Phase, PSLP (Education Service), and equal calibre officers from social sector agencies. SSA hosted about 20 participants in this programme on 8 October 2018. The participants explored how citizens can create value beyond being mere consumers of goods and services. They identified ways to engage citizens in the design and delivery of government programmes and policies, and deepened their understanding on how the government can provide stronger support towards ground-up initiatives. 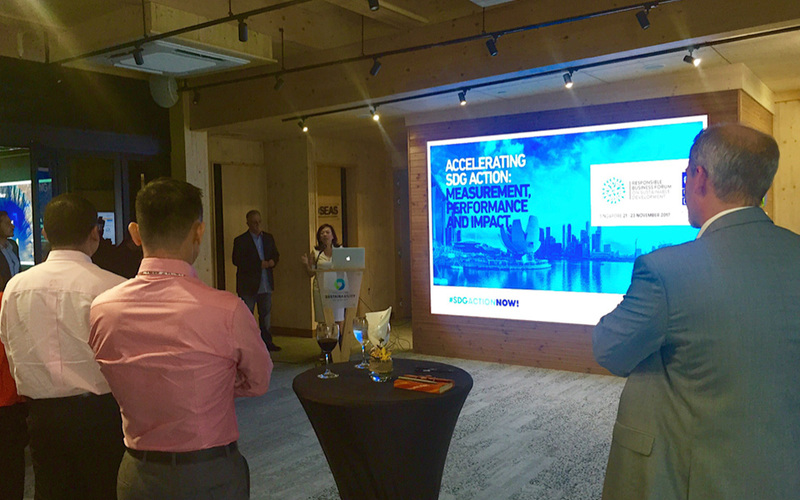 CSO Esther An, was invited to share about the creation of the SSA, a zero-energy sustainability academy that exemplifies successful 3P partnership. Since its opening in June 2017, the SSA has hosted a myriad of sustainability-themed events from zero waste, marine conservation, climate action workshops and thought leadership events. Esther also shared about CDL’s 3P partnership initiatives like #BeatPlasticPollution campaign, EcoBank and Feeding the 5000. Scientists predict that there will be more plastic than fish in the ocean by 2050. Up to 30% of plastic released into oceans each year could be microplastics, entering into the human food chain through seafood consumption.The potential detrimental effects of microplastic pollution require urgent action. 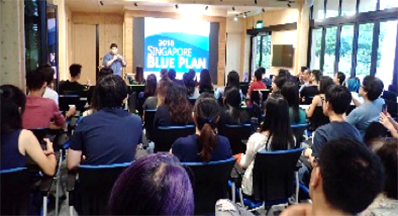 At the talk held on 27 September 2018 titled “The Big Problem of Microplastics”, giant clam researcher, Dr Neo Mei Lin and Singapore’s leading coral reef expert, Professor Chou Loke Ming shared interesting findings about the impact of microplastics on the ocean and marine life to over 100 conservation enthusiasts. With the increasing number of environmental sustainability initiatives facing everyone these days, how do people even begin to respond to buzzwords like ‘sustainability’ and ‘liveability’? How do we start thinking about new possibilities? 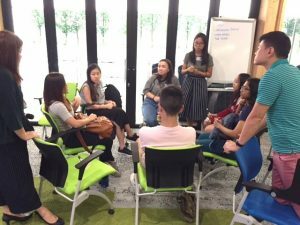 To address these questions, Temasek Foundation Ecosperity organised the ‘Envisioning a Liveable Singapore’ workshop for students from the NUS. 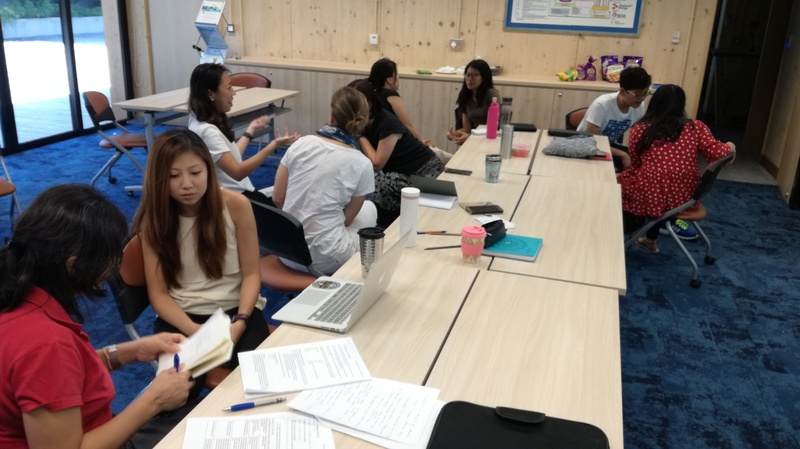 The focus group discussion was facilitated by Young Sustainable Impact Southeast Asia (YSI SEA) and saw the NUS students brainstorming vision statements and new ideas for sustainability in both visual and textual forms. The event provided an avenue for the 30 participants to forge collaborations for sustainability leadership within their volunteer communities. 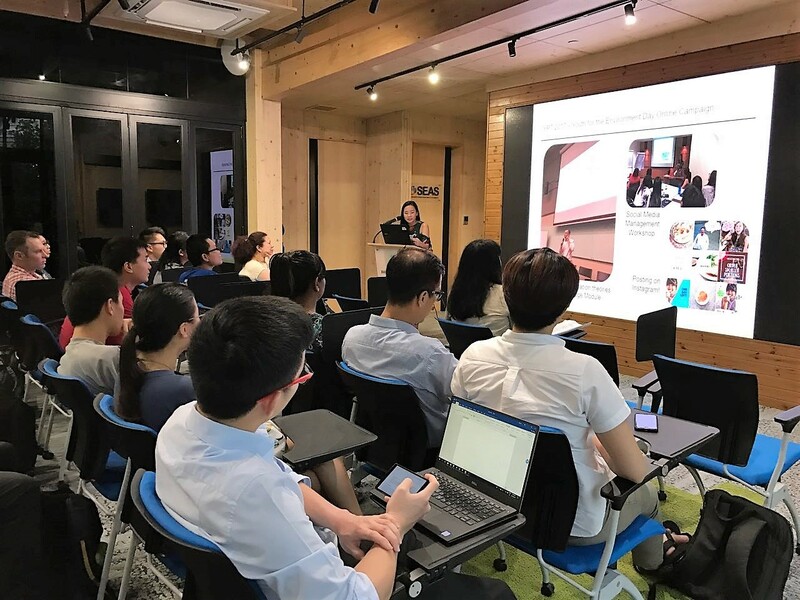 Participants also had the opportunity to hear more about the work of Temasek Foundation Ecosperity and YSI SEA in the sustainability innovation sector, and how they catalysed the development of innovative and transformational solutions. To walk the talk on sustainability, the students even brought along their own reusuable cutlery and containers for the event’s lunch reception. 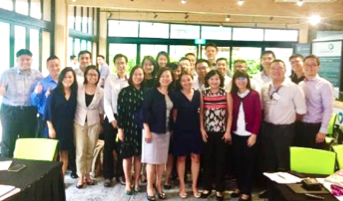 The Asian Finance Practice community gathered in Singapore at the SSA in mid-September 2018 for its regional meeting. 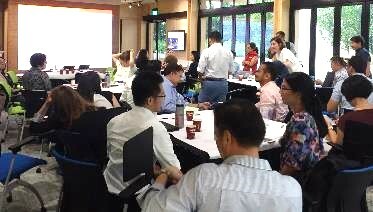 Hosted by WWF Singapore, the meeting was attended by over 50 participants from 11 countries to discuss and share information on implementation of the Finance Practice Strategy and the Areas of Collective Action and Innovation (ACAIs). The meeting also benefited from the active participation of regional experts from UNEP FI, ABN AMRO Bank, Ernst & Young, Moody’s and the Stock Exchange of Singapore on its first two days, as well as other speakers who touched on Climate and Energy, Forests, Food, Governance and Wildlife Practice, Public Sector Partnerships and Communications. The meeting was an excellent opportunity to share the work being done on sustainable finance around the region and to share information with regional focal points on latest happenings in the Finance Practice within ACAI communities. The SSA subsequently hosted another 20 people to delve into WWF’s Sustainable Finance in ASEAN. A workshop was held to discuss upcoming projects for the next three years and the discussions involved strategic planning, deliverables and execution of activities for the different offices under WWF. As an island-country, Singapore is blessed with seagrass lagoons, coral reefs, rocky shores and mudflats which are home to a multitude of marine species. 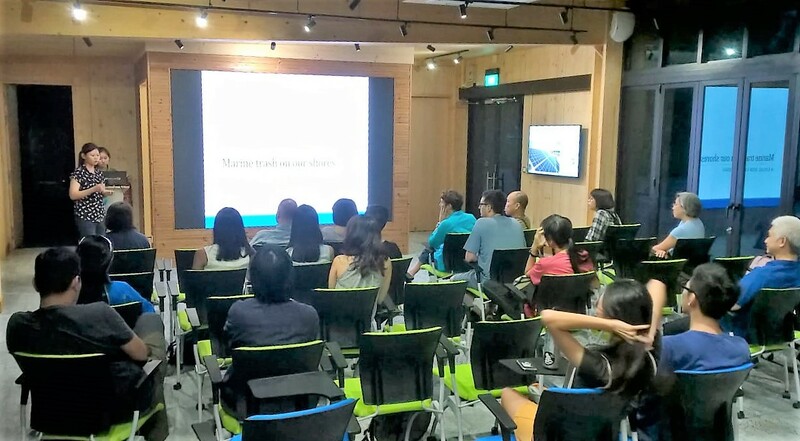 To enhance the public’s knowledge of these marine species, LepakInSG held a workshop at the SSA for 42 participants. Nature enthusiast Ms Ria Tan from WildSingapore also shared expert tips on how to identify tricky-to-spot marine species. 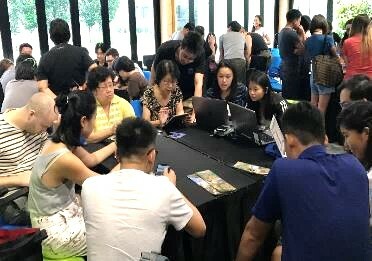 Through the event, these members of the public learnt how to identify marine creatures seen on Singapore’s shores and got acquainted with reliable online marine-identification databases. 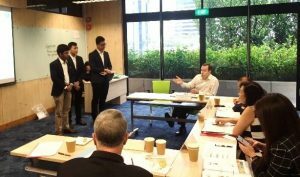 The NTU Asian Business Case Competition (ABCC) is an annual case challenge centred on business and sustainability, organised by the Nanyang Business School. 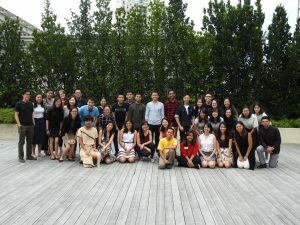 As part of the competition, some 70 international university students visited the SSA for its green building features. They learnt first-hand from CSO about CDL’s sustainability strategy and green building innovation. The knowledge acquired from the visit helped to spark ideation among the participants in developing their case submission for the competition. 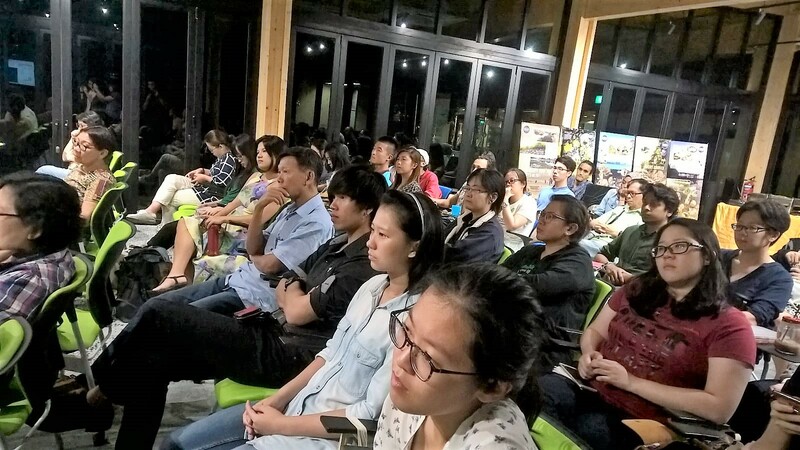 The large community of birders in Singapore showed the strength of their numbers during their talk on 6 September 2018 at the SSA. 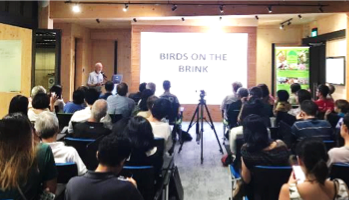 Organised by the Nature Society (Singapore), the 150-strong audience were entralled by the talk led by Dr Yeo Seng Beng, a veteran in birding. He shared about the popularity of birding in Singapore and pointed out how bird sounds and calls are an integral part of the birding experience. The audience were taught how to identify bird species based on their calls. In addition, they learnt about the mechanics (equipment used and basic analysis) of bird sound recording and its use in bird conservation. At the end of the talk, the audience left with a deeper appreciation of avian biodiversity and the role they can play in the conservation of bird life. The BCA-CDL Green Sparks Competition is a nation-wide biennial green building competition and a public-private initiative by the BCA and CDL. Into its fourth edition, the competition received over 30 entries this year. 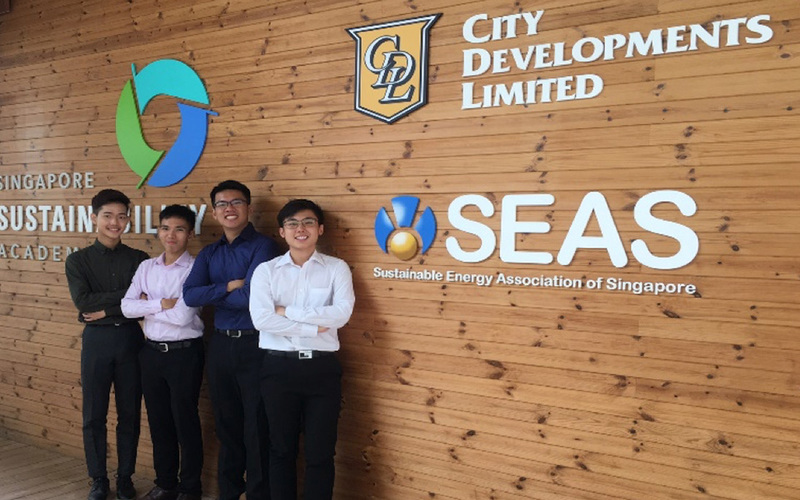 The tertiary students conceptualised innovative green solutions to make Bukit View Secondary School positive energy or zero energy. The finals for the competition was held at the SSA, where each team showcased their proposals to the judges. 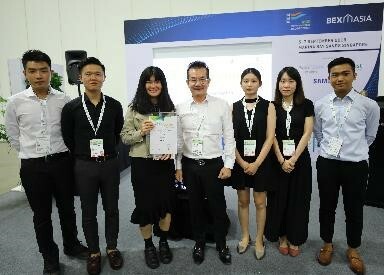 The winning entries of the BCA-CDL Green Sparks Competition 2017/2018 were recognised and subsequently exhibited later in the same month at the BCA Pavilion during BEX Asia 2018. Many people are concerned about climate change but do not feel that they know enough to act. To bridge this gap, Climate Conversations, a non-profit volunteer organisation, held a workshop under its facilitator training series at the SSA, to equip participants with the skills to become change agents for climate change. One of the trainers at Climate Conversations who conducted the facilitator workshop is Ms Kei Franklin. Ms Franklin is an outreach manager and course architect at Skillseed, where she crafts and curates socially-impactful experiential learning journeys for youths. She is also an editor and writer for Brack magazine, a platform for socially engaged artists in Southeast Asia. Ms Franklin shared that facilitation is a powerful way to contribute to social change. Creating space for conversation can be a powerful first step that contributes to the climate movement. To most people in Singapore, the Arctic is perceived as an inhospitable, far-flung location with sweeping tundra, glaciers and ice caps. 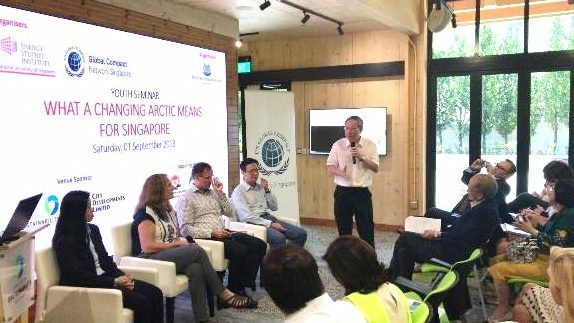 As for the 100 attendees who were at the seminar on “What A Changing Arctic Means For Singapore”, they became aware why Singapore should be more concerned about the effects of climate changes in this region more than 7,000 km away from our country. As the Arctic region opens up and integrates deeper with the global economy, its impact on Singapore will come in many ways. This seminar for youths was organised by Energy Studies Institute, GCNS and supported by the Ministry of Foreign Affairs (MFA). The Guest-of-Honour was Minister of State, Ministry of Foreign Affairs & Ministry of Social and Family Development Mr Sam Tan Chin Siong, who shared about his experiences at the Arctic in his closing remarks. 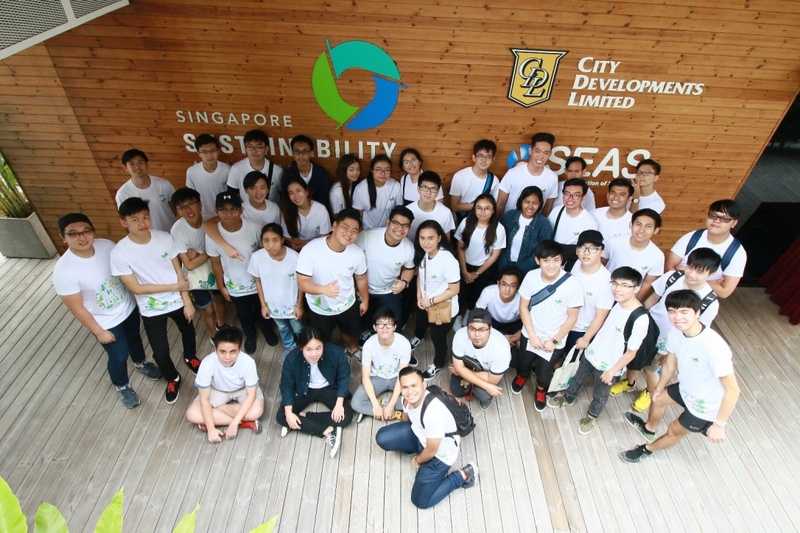 As part of CDL’s commitment to youth development and pioneering sustainable urban solutions, CDL hosted participants of the Sustainable Enterprise Challenge (SEC) 2018 at the SSA. 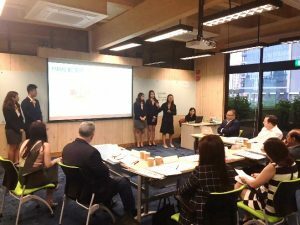 SEC is a local case challenge which aimed to seek solutions and recommendations from the Nanyang Technology University (NTU) student community to enhance the sustainability of the NTU campus. 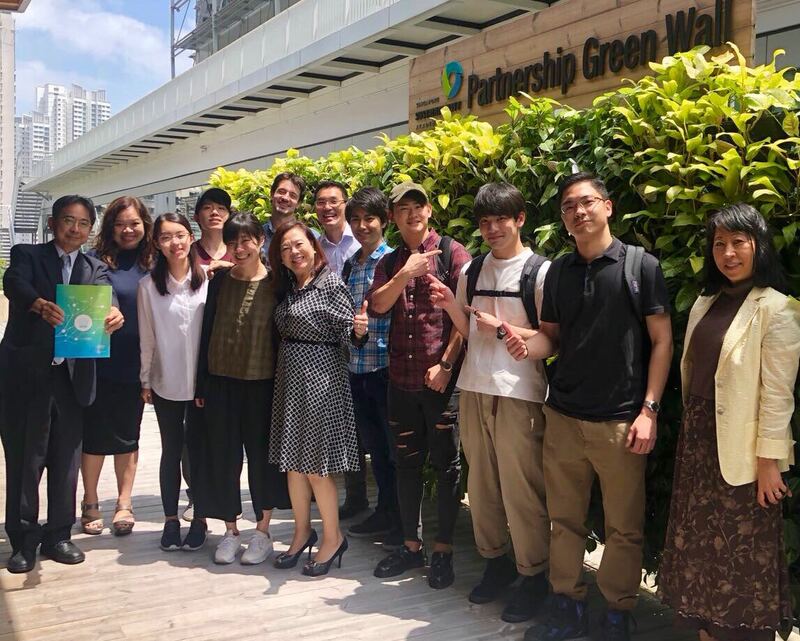 Attended by close to 25 students from diverse faculties, the visit and a sharing by CDL Chief Sustainability Officer (CSO) Esther An enabled students to gain a deeper understanding about CDL’s efforts towards sustainable development in an urban landscape. This played an integral role in sparking ideation in the SEC participants to find sustainable solutions for green campuses and eco-buildings. Jointly organised by CDL and Global Compact Network Singapore (GCNS), the CDL-GCNS Young SDG Leaders Award is an annual case competition that offers youths a platform to champion sustainable development and SDG integration into business for positive change. This year, aligning with the global goals for sustainable development, the Award seeks to educate and empower young leaders with SDG knowledge and skills, while inspiring companies in Singapore to take action on the SDGs. A total of 83 teams from universities, polytechnics, junior colleges and high schools submitted their entries. After an intense round of evaluation, 10 finalist teams were chosen. The final assignment involved analysing their case companies’ sustainability strategy and assessing how they can better align their sustainability strategy with SDGs, which included coming up with innovative and sustainable products or services. At the final judging, the panel of judges were impressed with their professionalism and innovative ideas, reflecting their sound understanding of the SDGs and case companies’ sustainability strategies. Results of the winners will be announced in November 2018. 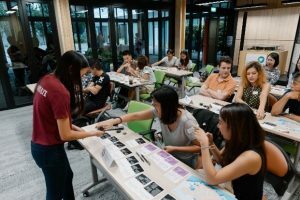 As a means of understanding climate change’s impact on Singapore’s urban planning and redevelopment, 48 participants played a land-use simulation game that was designed to focus on climate change. 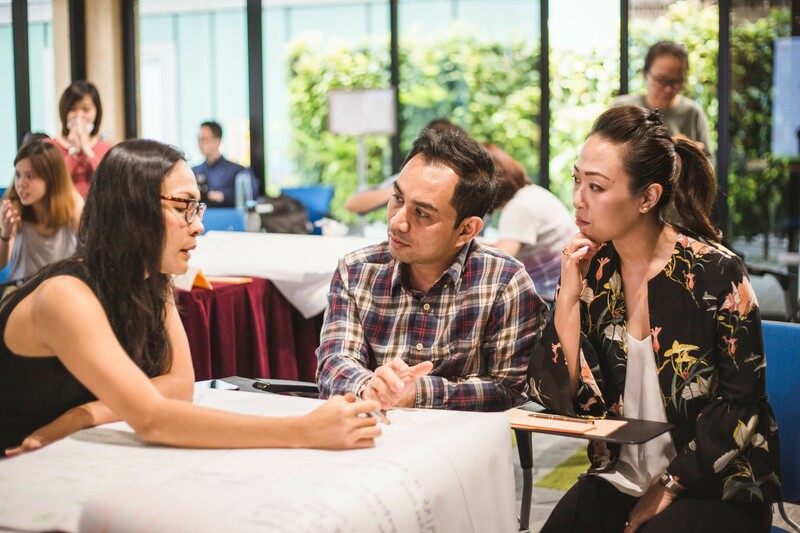 Participants stepped into the shoes of policy-makers and built a Singapore that they envisioned, while considering the land constraints and priorities of the country. Through the process, participants explored the relationship between economic and population growth, climate change and urbanisation. 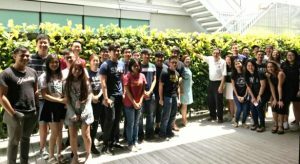 With deeper understanding of climate change’s impact to Singapore and the desire to fight climate change, the participants collectively took the Climate Action Pledge by Ministry of the Environment and Water Resources (MEWR) and commited to be more climate-friendly in their daily lives. Later in the session, 4 speakers from the People, Private, Public sector spoke about actions that could be done to combat climate change. Engagement with stakeholders is critical in understanding the issues that an organisation’s stakeholders care about. Business Council for Sustainable Development (BCSD) Singapore conducted a workshop, which saw its key stakeholders come together to review and discuss some of the foundational elements of the Sustainable Natural Rubber Platform (SNRP) with regards to its ambitions, organisation, principles and progress towards an official launch in the coming months. 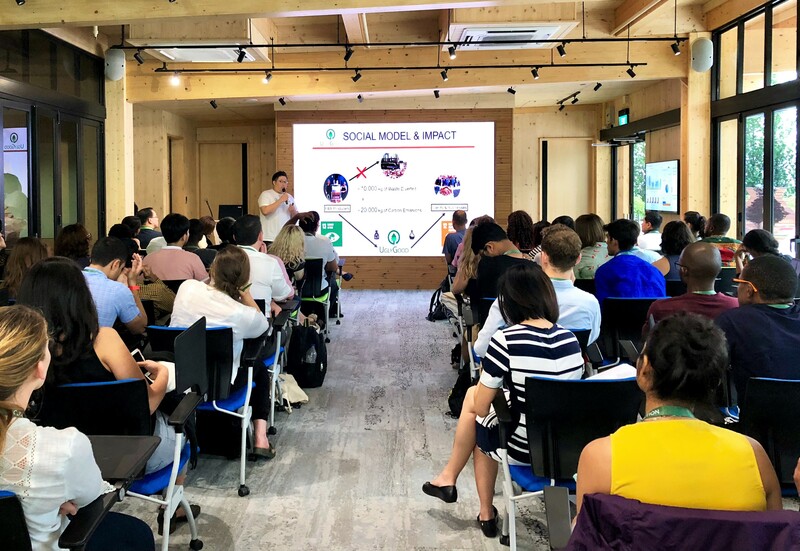 The event started with the Young Sustainable Impact Southeast Asia (YSI SEA) Sustainability Conference, which brought together 55 investors and guests, representing 24 different organisations. During the product pitching session, 6 impact start-ups (formed from 24 regional finalists) with innovative sustainability solutions made their pitch for product uptake and funding to the floor of investors, consisting of venture capitalists, impact investors and other investors. It was truly a moment of euphoria as all 6 teams successfully secured funding or development support from the investors. The event progressed to the Singapore Sustainability Showcase, which was held as a grand culmination of the 14-week Innovation Programme. The opening was graced by Minister Desmond Lee, Minister of Family and Social Development, Second Minister for National Development. The theme “Rethinking Innovation” aimed to shift the limelight from solutions to the real problems that motivate sustainability players. YSI SEA’s presentation prompted the audience to rethink about sustainable innovation and getting to the heart of problems. The audience were also inspired by the presentations by the booth partners, where they shared about how social-sustainable enterprises function and the passion that drives them. 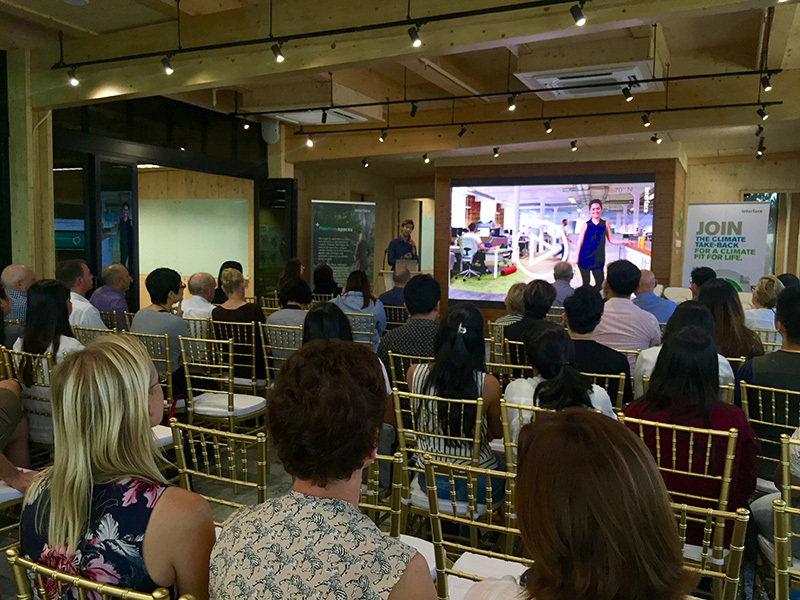 SSA was honoured to have hosted the 500 like-minded individuals investors and guests, who were passionate about driving sustainability solutions to the market. 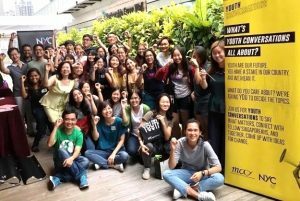 The National Youth Council (NYC)’s Youth Conversations is a platform for youths to voice their opinions, connect with their peers from all walks of life, and come up with ideas for change on a range of environmental and social topics of interest to Singapore. It also gives them the opportunity to propose innovative ideas and experiment with solutions with support from the NYC. This event focusing on Zero Waste aimed to engage youths to discuss and share perspectives on the topic of waste generation and reduction across a range of topics like sustainable fashion, food waste, e-waste and others. They aimed to spur youths to greater individual and collaborative actions, hopefully leading up to more systemic change. Exploring the questions of ‘Where are we?’ ‘Where do we want to go?’ and ‘How can we lead us there?’ around Singapore’s waste issues, some 60 youth participants were able to surface their concerns on various waste-related topics and discuss their ideas for action to realise their zero-waste goals. They also heard from civil society initiatives like Straw-Free Singapore and corporates like CDL about their respective efforts to reduce waste and increase recycling. The Youth Conversation ended with a call for action, where several participants were inspired to share their own plans and ideas to work towards zero waste. 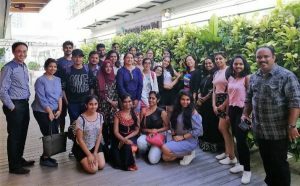 30 students and 3 professors from the Ramaiah Institute of Technology in Bengaluru, India visited the Singapore Sustainability Academy during a study trip to Singapore. Hailing from the private college’s School of Architecture, the 4th year students were studying architectural designs for urban spaces. They were keen to learn about how the Academy, as a sustainability space in an urban setting, was transformed from a bare skypark into a green building through the use of innovative and sustainable building materials. They also visited the Academy to learn about how the space has been used to promote and advance environmental and social initiatives. During the visit, CDL’s Chief Sustainability Officer Esther An gave an overview of the SSA’s programmes and core focus of promoting sustainable development through providing a free space for the community to use. Senior Project Manager Alfred Ng, who led the development and construction of the SSA, then spoke to the students about the architectural design and building process, from the sourcing of the SSA’s sustainable timber as verified to the Nature’s Barcode system, to its creatively designed roof that keeps out the heat while allowing rainwater to be funneled off for collection. The students were inspired by the SSA’s holistic dedication to sustainability. 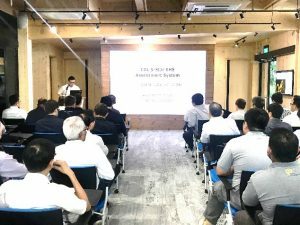 Into its 69th cycle, the CDL 5-Star Environmental, Health & Safety (EHS) seminar provided a valuable platform to promote the importance of EHS among CDL’s building industry partners including architects, engineers, quantity surveyors and contractors. Speakers from the Workplace Safety and Health Council and Ssangyong Engineering & Construction (E&C) were invited to share on topics such as mosquito breeding and work safety at height, to close to 100 participants. 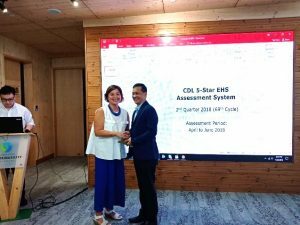 Results of the CDL 5-Star EHS Audit Assessment for ongoing projects in the second quarter of 2018 were also announced during the seminar to recognise exemplary EHS performance displayed by the builders. Small nudges make a difference! 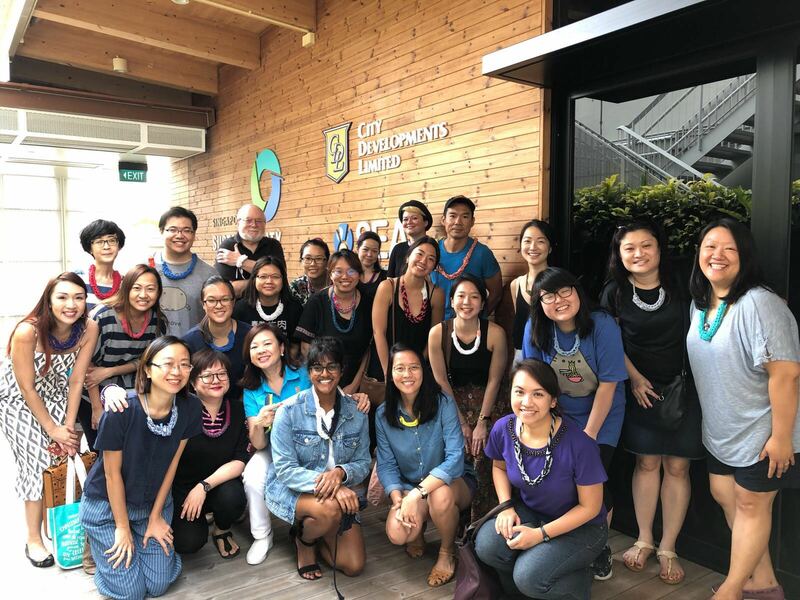 For LepakInSG’s ‘7th Sea Our Shores’ Blue Nudge Workshop, they brought together a small group of 15 marine activists and community players to discuss the mounting marine trash problem in Singapore. The workshop aimed to raise awareness about current efforts taken by the government and civil society groups. The attendees were also informed about how they can stay involved and provide their feedback to the various groups involved. 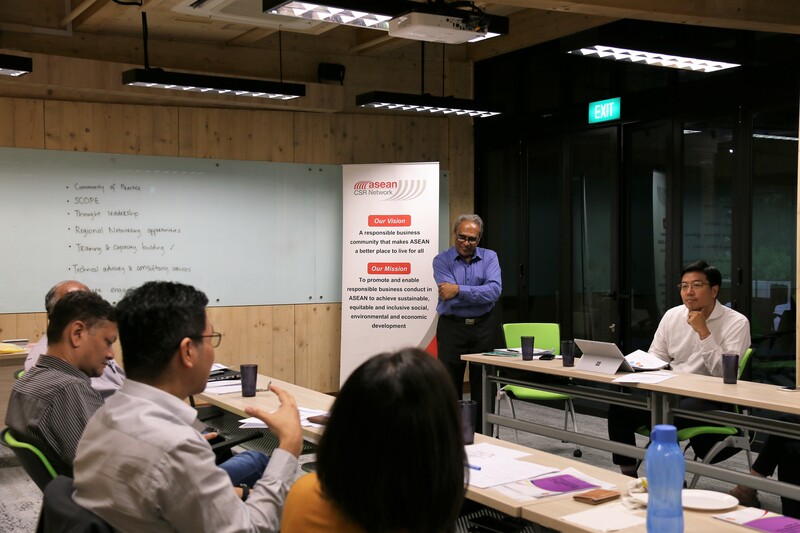 10 environmental community group representatives were invited for a focus group discussion on the Sustainable Singapore Blueprint (SSB), a roadmap for Singapore’s national sustainability plan published by the Ministry of Environment and Water Resources (MEWR) in 2015. The discussion aimed to collate opinions and feedback from the ground about the plans laid out in the SSB, to be sent to the relevant government agencies for the next review of the SSB. The UN Environment (UNE) Southeast Asian Youth Environmental Network (SEAYEN) Regional Meeting is a gathering of selected youth representatives from 10 ASEAN member nations. 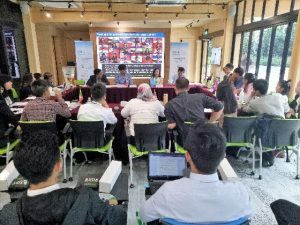 It is held every two years to gather prominent youth environmentalists from ASEAN to report on their countries’ environmental status and the activities done by young people in their home countries. 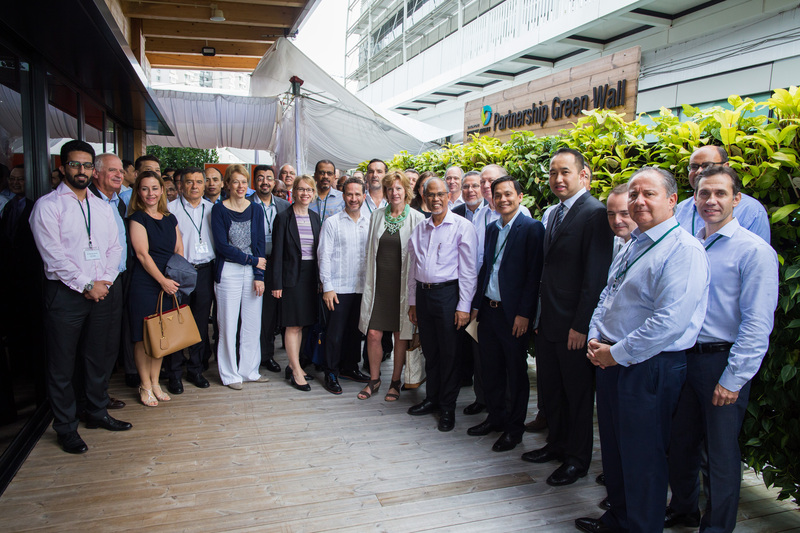 As the ASEAN Chair for 2018, Singapore was privileged to host this year’s Regional Meeting at the aptly-chosen venue, the Singapore Sustainability Academy (SSA). This is also complementary with 2018 set as Singapore’s Year of Climate Action. The event was organised by the National Youth Achievement Award (NYAA) of Singapore in collaboration with UN Environment. 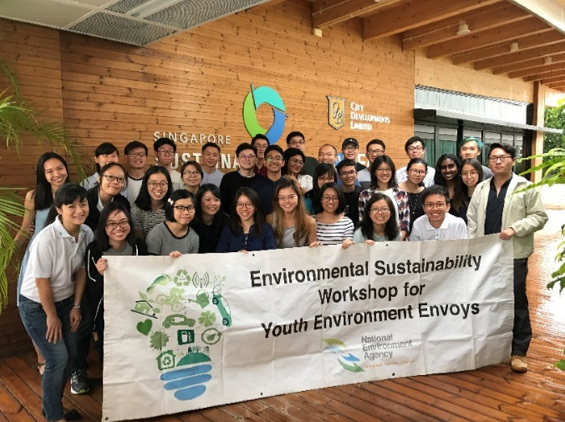 At the Forum held in the SSA over two days, talks from sustainability experts from Singapore and capacity-building sessions were held to equip 30 youth leaders with knowledge and skills to enhance environmental actions back home. They were encouraged to ‘work local, think global’ in order to brainstorm for solutions and new ideas with their peers and glean best practices from other countries. Over 180 youths from the Asia Pacific region visited City Square Mall and SSA as part of the Global Youth Summit (GYS)’s Green Dot Learning Journey. The GYS is organised by Hemisphere Foundation, a local non-profit social enterprise, and it provides a youth-led global platform for youths to connect, discuss and initiate innovation for sustainable solutions to protect children, fresh water and the natural environment from further destruction. 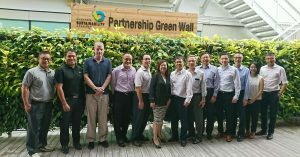 Through this visit, they learnt about CDL’s extensive sustainability efforts and the eco-features of City Square Mall, Singapore’s first eco-mall that is also owned and managed by CDL. As part of Northland Secondary School’s eco-education programme, several passionate teachers organised a learning journey for 120 students to the SSA and City Square Mall to learn about existing efforts to conserve energy, water and resources. The students took away much knowledge about conservation efforts done on a personal, national and international level, and the students and teachers alike were inspired by the SSA’s embodiment of sustainable materials and mission. LepakinSG ‘Sea our Shores’ Clay Modelling Workshop on Fun with Marine Life! Sea Our Shores’ is a yearlong series of workshops held by local environmental interest group LepakinSG, where selected speakers, activists, conservationists and individuals active in the marine conservation arena are invited to conduct talks and hands-on sessions for the public to learn more about Singapore’s shores and reefs. The events support International Year of the Reef 2018. In June, about 20 participants comprising of families with children attended a Sea Our Shores – “Fun with Marine Life!” workshop just for kids. They learnt about the fascinating creatures that we can find on our Singapore Shores and even got to examine some specimens up close. Then, they tried their hands at some clay modelling to make their favourite marine animals. Some 32 pre-school teachers attended two fun-packed sessions of “Learn, innovate, play”, a workshop organised by NEA and Environiche LLP. Teachers were taught on the fundamentals in environmental education, which included topics such as anti-littering, 3Rs, dengue prevention, environmental hygiene and energy efficiency. They also conducted a discussion on how to integrate environmental education into the pre-school curriculum. One of the workshop highlights was the plastic flower making workshop as part of CDL and GI’s #BeatPlasticPollution campaign. Amazed by the sheer number of plastic bottles collected during the short time, many participants made a commitment to reduce their disposables usage in future. Singapore generated more than 800 million kg of plastic waste in 2017, and only six percent of consumer plastic waste was recycled. Most plastics produced are single-use plastics and as consumers, we urgently need to rethink the way we make, use and reuse plastics. 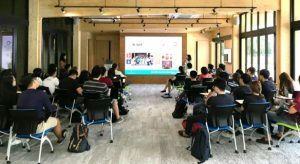 To educate the public and promote innovative methods of reducing plastic waste, Sustainable Living Lab organized a Community Lab event and sharing session to get people to rethink how individuals can close the loop on plastic recycling. 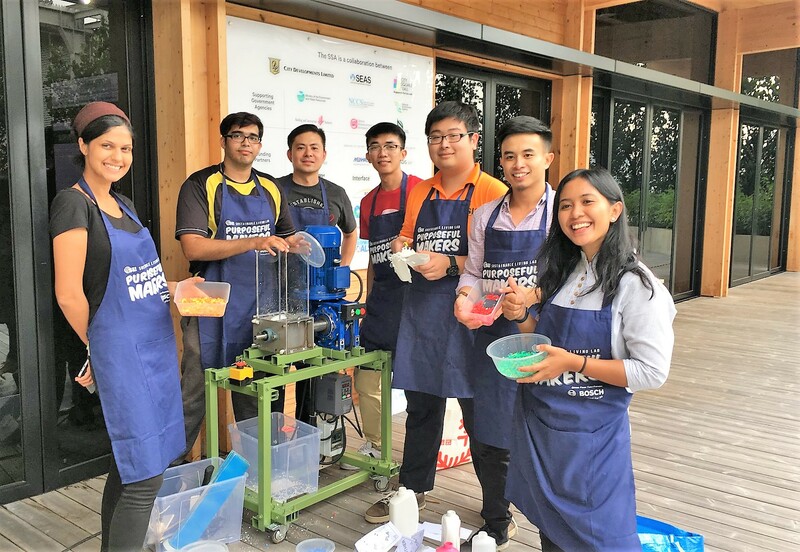 Other than a talk about the fundamentals of the circular economy and how consumers can lead low-carbon and zero-waste lifestyles, the event also gave participants a chance to make their own reusable plastics! Using a machine built by SL2 group PlastiCity, participants who brought along their own HDPE and PP plastics (e.g. bottle caps, detergent, shampoo and milk bottles) were able to repurpose their plastic waste into new items during the hands-on session. 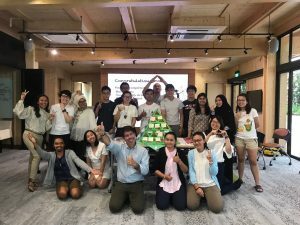 On 5 June 2017, the Singapore Sustainability Academy opened its doors for the first time. 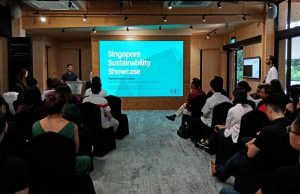 Within just a year, it has hosted over 110 events and training programmes, 4,500 visitors, and established partnerships with 140 like-minded organizations from Singapore and beyond to advance sustainability and climate action. On 8 June 2018, the SSA celebrated its 1-year anniversary with a group of 40 friends and associates, in conjunction with Gone Adventurin’ at a reception that touched on the pressing problem of food waste. 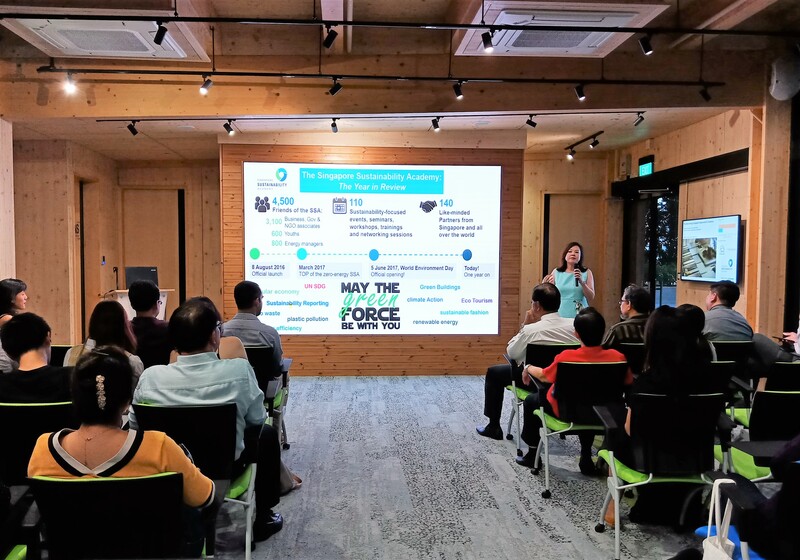 CDL Chief Sustainability Officer Esther An gave an overview of the SSA’s milestones over the past year, as well as upcoming programmes and youth engagement activities such as the recently-launched CDL E-Generation Challenge 2018. Shifting the spotlight to food waste, Gone Adventurin’ then shared their experiences in hosting Asia’s first Feeding the 5000 event at City Square Mall in March. 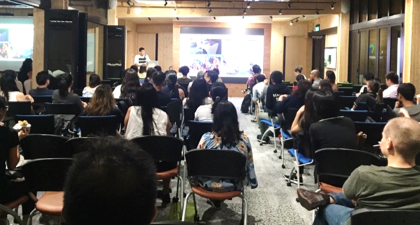 Food waste practitioners and experts, including Daniel Tay from SG Food Rescue, Ng Jia Quan from Insectta Farm, and Jeremy Lee and Clewyn Puah from startup UglyGood, spoke about their own solutions to the food waste problem at different stages of the value chain. UNLEASH is an annual global innovation lab that brings together 1,000 talents from all over the world to generate ideas and solutions for the Sustainable Development Goals. 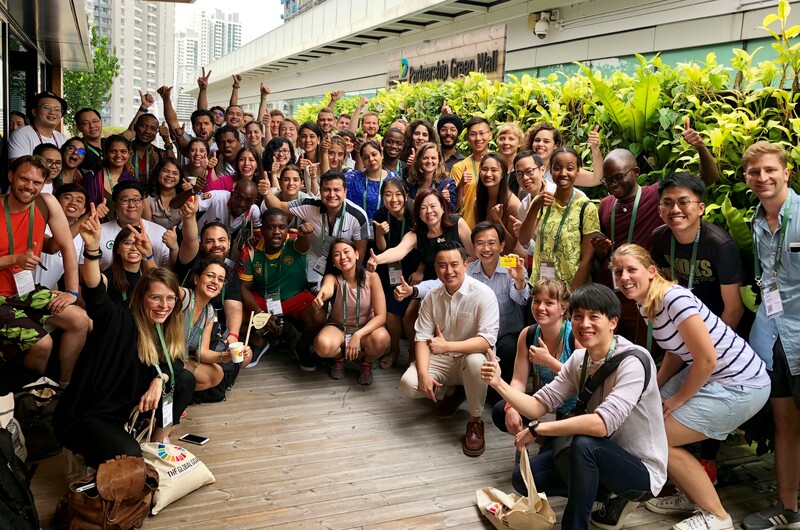 Held for the first time in Singapore, talents from over 100 countries gathered over six days to ideate and form networks to advance sustainable development. 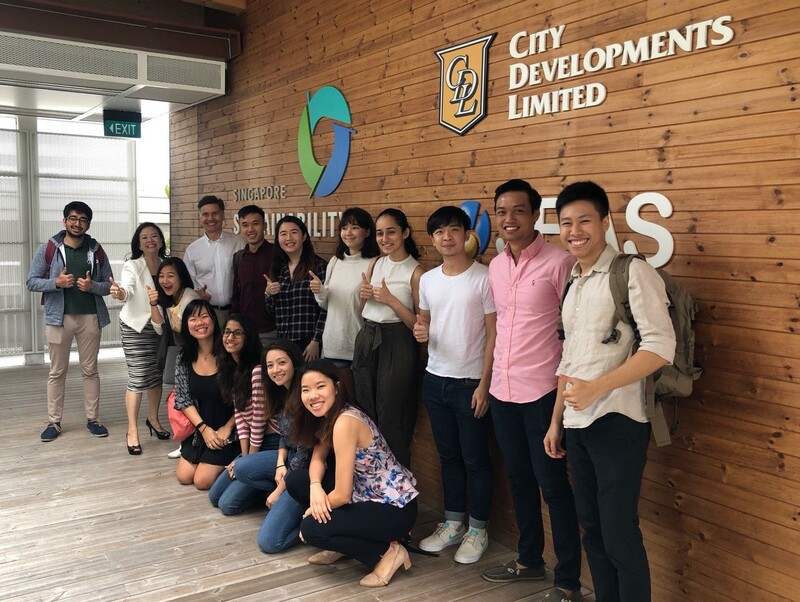 CDL was requested to host a visit for 80 talents from the Climate Action track at the Singapore Sustainability Academy, in order to showcase our sustainability integration and climate action efforts through green buildings, green financing and innovative 3P partnerships, such as the establishment of the SSA. Focusing on the topic “Creating a Sustainable Business and Community”, CDL Chief Sustainability Officer Esther An gave an overview of how CDL has integrated sustainability into our business for over 2 decades, and how we continue to create value from sustainability through our developments and pioneering green bond efforts in Singapore. CDL also invited two relevant social enterprises, UglyGood and GUSH!, to present their novel products that address climate challenges. UglyGood produces closed-loop cleaning solutions from food waste, while GUSH! invented a sustainably-produced interior paint that purifies air for improved mental health and cost savings. 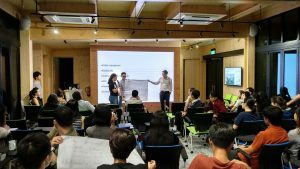 The sharing was dynamic with many questions and propositions from overseas talents to adapt the Singapore green building approach in their countries. 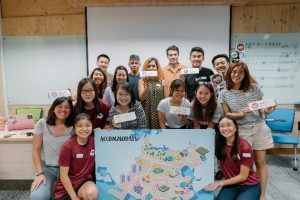 The Adventurous Fellowship, a flagship programme for youths by local social enterprises Skillseed and Geylang Adventures, is a series of three residential camps that aim to explore Singapore’s prevailing social and environmental needs framed under the tri-sector model. The Fellowship aims to provide Fellows with a deeper understanding of the Theory of Change and how it can be used as a tool to guide long-term social change. Over three weekends in May and June, a group of 32 Fellows from The Adventurous Fellowship attended equipping and sharing sessions at SSA. The Fellows consisted tertiary students in environmental studies and social work, fresh graduates, and working professionals from the government and social sector and educators. During these sessions, representatives from the people, public and private sectors shared their perspectives on three main issues, namely the Environment, Inequality and Integration, which were further explored during the camps. Coming from a wide variety of organizations like Zero Waste SG, the National Environment Agency, the Ministry of Social and Family Development and Nanyang Technological University, they gave the Fellows diverse perspectives on the complex environmental and social problems faced in Singapore, and possible interventions and solutions. The SSA was found to be a very appropriate venue for The Adventurous Fellowship as the ethos and values of the Academy and fellowship were very much aligned, as both are cross-sector partnerships striving to address Sustainability. 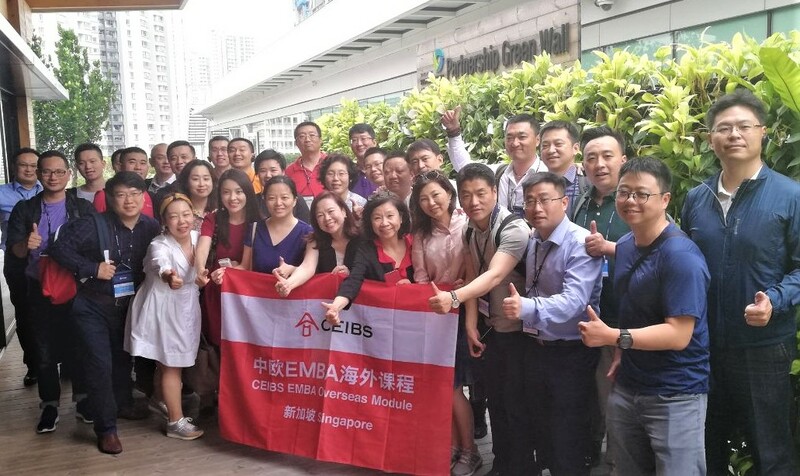 A group of some 40 students in the China Europe International Business School’s Executive MBA Programme visited the SSA as part of a learning journey to Singapore, where they also visited other government and private-sector initiatives which have been transforming Singapore into a leading smart and sustainable city. 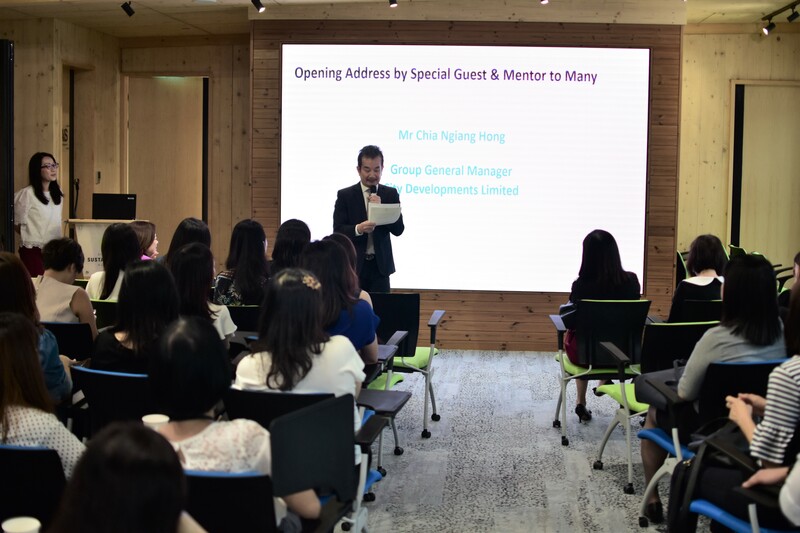 The students consisted high-level professionals from senior management and boards of directors, hailing from a variety of industries in China, including real estate, finance, manufacturing, and a range of others. 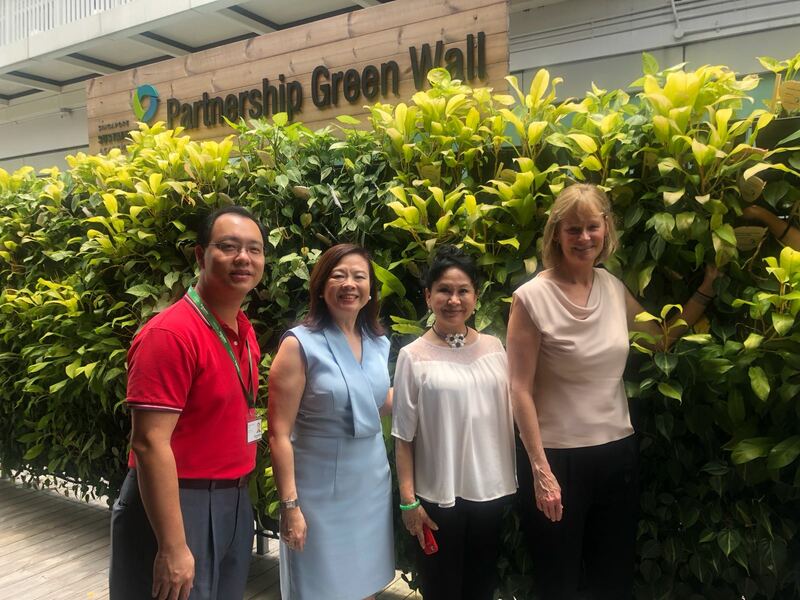 Through the visit and a sharing by CDL Chief Sustainability Officer Esther, the delegation gained a deeper understanding about CDL’s sustainability efforts towards a greener environment and across different geographical regions including China. Afterwards, they visited South Beach to experience CDL’s sustainable design and technologies for themselves, and were highly interested in engaged in asking questions about how to bring the South Beach innovations back home to China with them. 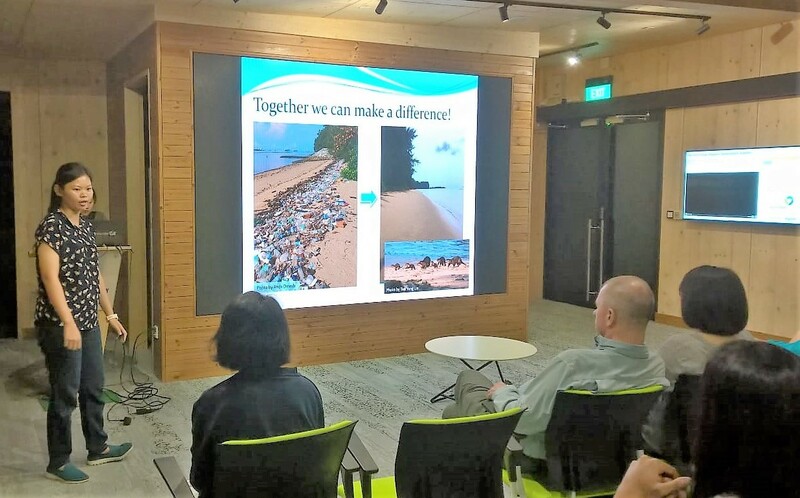 The May edition of the yearlong series of ‘Sea Our Shores’ workshops featured a sharing by International Coastal Cleanup Singapore (ICCS) volunteer, Ms Joleen Chan. She gave her firsthand experience and thoughts about the plastic use and pollution situation in Singapore, and her experience volunteering at coastal clean-up sessions. The talk was followed by a film screening of “Albatross”, directed by Chris Jordan. The movie studies the newly emerging but major issue of ocean plastic pollution through the environmental tragedy taking place on a tiny atoll in the center of the North Pacific Ocean, where many seabirds have died from ingesting plastics. The movie and talks showed attendees how widespread the problem of plastics is, and helped them to gain insights on the local situation. It further aimed to inspire them to action by reducing their own plastics usage, and joining local cleanup efforts. In view of the urgent need for effective communications about the problem and solutions for Climate Change, the NEA organized a training session for youths on may create strategies to address this broad and complex topic for their own communities. The 15 youths were part of the planning team for the upcoming ASEAN Plus Three Youth Environment Forum (AYEF). 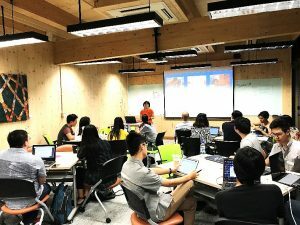 The training, conducted by Assistant Professor Sonny Rosenthal from the Nanyang Technological University (NTU) Wee Kim Wee School of Communication and Information, covered topics such as communication strategies for sustainable behavior, mobilizing the masses, community events and national messaging. It also gave participants a chance to create and refine their own strategies, and showcased examples of successful climate change campaigns such as the recently concluded Feeding the 5000 event by Gone Adventurin’, held at City Square Mall with CDL’s support. 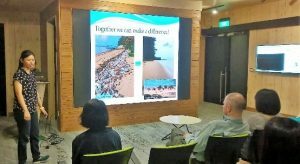 Sea Our Shores, a yearlong series of workshops held by local environmental interest group LepakinSG, invited speakers from diverse backgrounds to reveal the ‘treasures of our shores’ to a 50-strong crowd at their April event. The speakers included Azri Alwi, an artist that helps uncover the intrinsic value of our shores; Ms Liow Shen Yan, a member of the Marine Stewardship Council; Dr Serena Teo, a member of the World Harbors Project team and Mr N. Sivasothi, senior lecturer at the National University of Singapore (NUS) Department of Biological Sciences, nicknamed ‘Otterman’ for his extensive studies of Singapore’s otters. They shared about the role that Singapore’s shores play on the international stage. With a crowd largely made of youths and marine enthusiasts, it was hoped that the panel discussion would bring new insights and perspectives on the benefits of our shores and the value they create for Singapore and its people. The series of LepakinSG events has also served to bring passionate youths together to do their part in protecting Singapore’s shores. The Economist Corporate Network gathered 40 senior business leaders from a range of industries from finance, to retail, to real estate, for a panel discussion and networking session about sustainable business and investing. The panel comprised four experts in sustainable financing and Environmental, Social and Governance (ESG) best practices, including Eya Sicat, Marketing Director for Human Nutrition and Health, Asia Pacific, DSM; Marion O’Donnell, Associate Director, ESG, Fidelity International; Jeanne Stampe, Head Asia Sustainable Finance, Global Finance Practice Leadership Team, WWF Singapore; and Esther An, Chief Sustainability Officer of CDL. The panel was chaired and moderated by Andrew Staples, Global Editorial Director of The Economist Corporate Network. 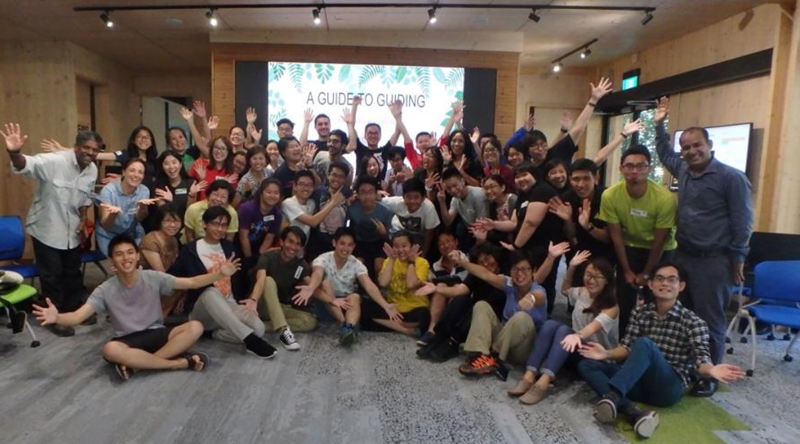 The Jane Goodall Institute of Singapore (JGIS) said a big ‘thank you!’ to their volunteers through a Volunteer Appreciation Event held at the SSA, which gathered 15 from their network who have been contributing regularly to the Institute’s activities and events. The gathering further served to educate members of the damaging effects of plastic use, and showcase those who have been actively cutting plastic use out of their daily lives. 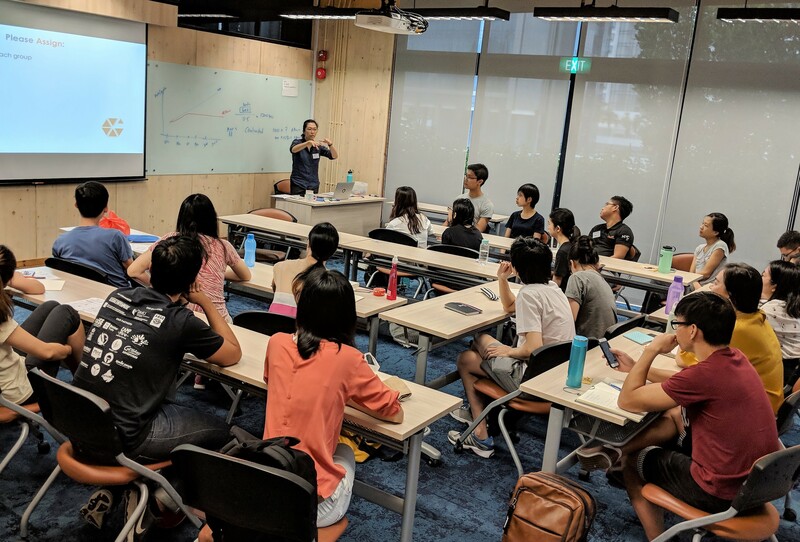 This came in the form of a short talk and game facilitated by local NGO Plastic-Lite Singapore, and sharing session by JGIS members who have attempted a one week “No Plastics Challenge”. Their individual learnings and reflections inspired the other members to greater awareness and action during this short yet impactful session. 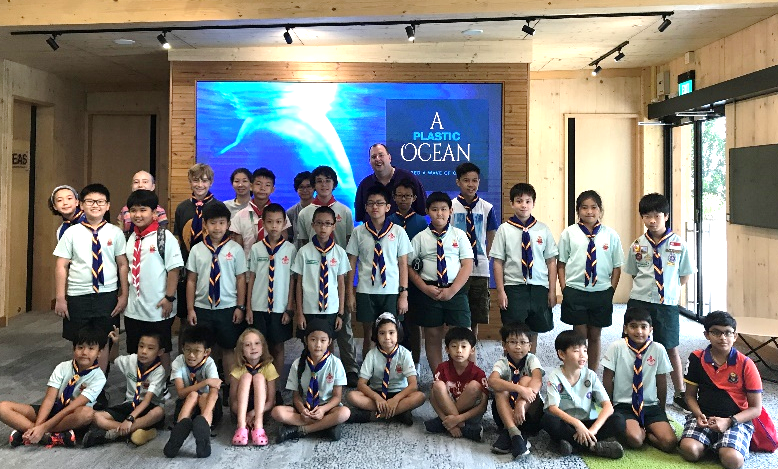 In a bid to present to cub scouts the extent of the plastic pollution problem globally and in Singapore’s waters, the Colugo Scouts in partnership with NParks organized a screening of ‘A Plastic Ocean’ at the SSA for 41 scouts and their parents. The younger generation will be most affected by plastic waste and pollution in the coming years and it is crucial to educate them of the mantra ‘If you can’t reuse it, refuse it!’. 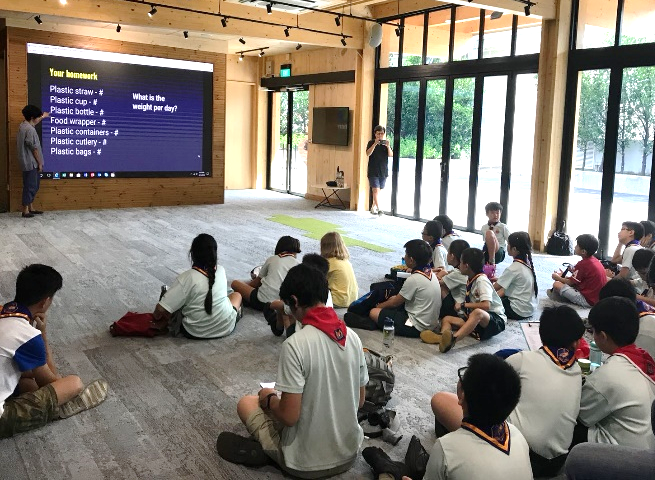 In the week leading up to the event, scouts were also challenged to complete ‘plastics homework’ by tracking their plastic usage and reflecting on it, which culminated in this meaningful movie screening to remind them of the impact their actions have on the environment. 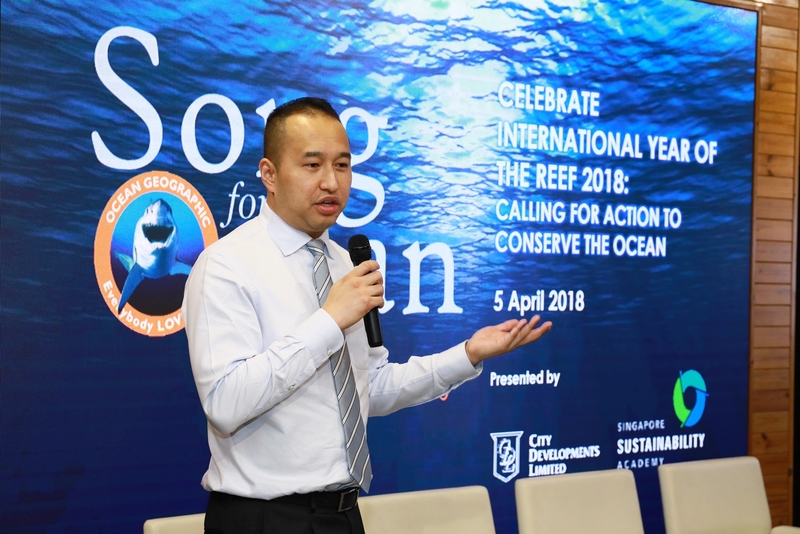 The event further complements the SSA’s recent role as a platform for marine conservationists and enthusiasts to gather and inspire each other about the importance of curbing plastic use for our oceans, as with the recent conclusion of the event commemorating the International Year of the Reef on 5 April 2018. 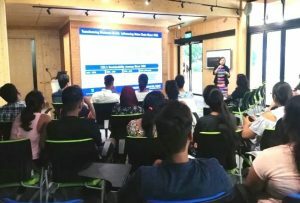 In conjunction with the Asia Dive Expo (ADEX) 2018 and the International Year of the Reef 2018, Ocean Geographic founder and publisher, Michael Aw, gathered key ocean conservationists for an exclusive event at the Singapore Sustainability Academy to increase awareness and share a call for action around marine conservation. 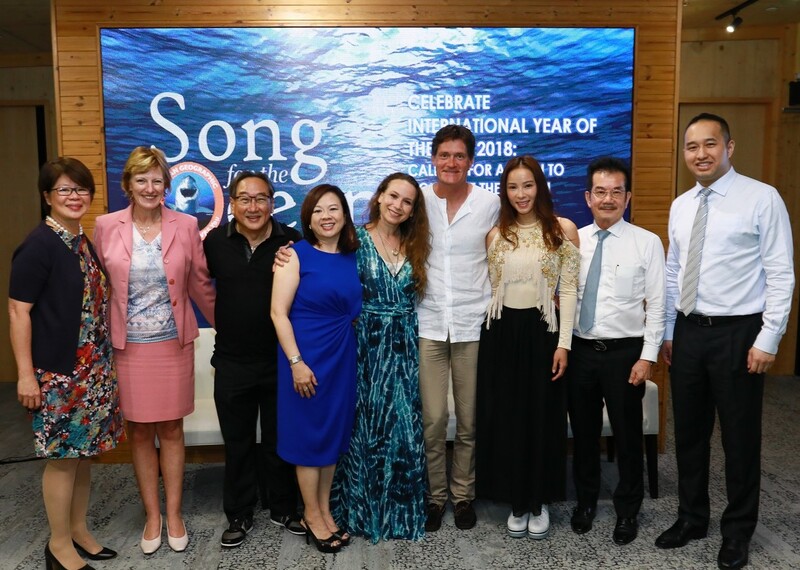 The event saw an attendance of over 60, including Her Excellency, Margriet Vonno, Ambassador of the Kingdom of the Netherlands, Chairman of the Shell Companies in Singapore Ms Goh Swee Chen, CDL Group CEO Mr Sherman Kwek, and director of documentary ‘A Plastic Ocean’ Mr Craig Leeson. 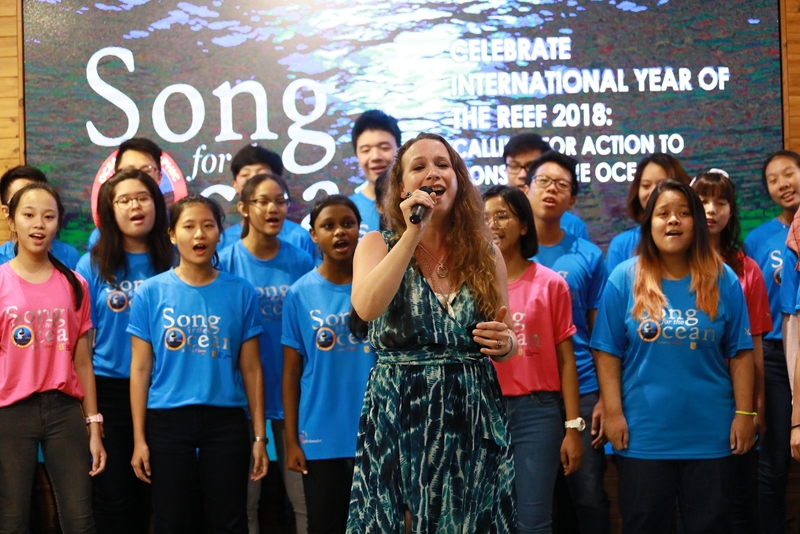 Acclaimed songstress and ocean conservation spokesperson Ms Kristin Hoffmann performed “Song for the Ocean”, backed by a youth choir group put together by CDL. The performance was recorded as part of a music video that will be released internationally to raise awareness to conserve and protect the ocean. Dr Sylvia Earle, acclaimed deep-sea diver, oceanographer, explorer and scientist also recorded a video specially for the event to call for more action for the ocean, which was screened during the event. With Director Craig Leeson in attendance, a 20-minute version of award-winning documentary “A Plastic Ocean” was screened. The groundbreaking documentary was filmed in 20 locations across the world over four years, and explores the fragile state of our oceans while uncovering alarming truths about plastic pollution and devising working solutions that can be put into immediate effect. Inspired by the clip, CDL will also be hosting a screening of the full movie for its staff and subsidiaries as part of an Earth Day staff engagement event. Finally, the audience also had the privilege to view Michael Aw’s short film called “Facing Grace” starring Hong Kong actress Hidy Yu, which showed artfully how sharks and humans can live harmoniously together. 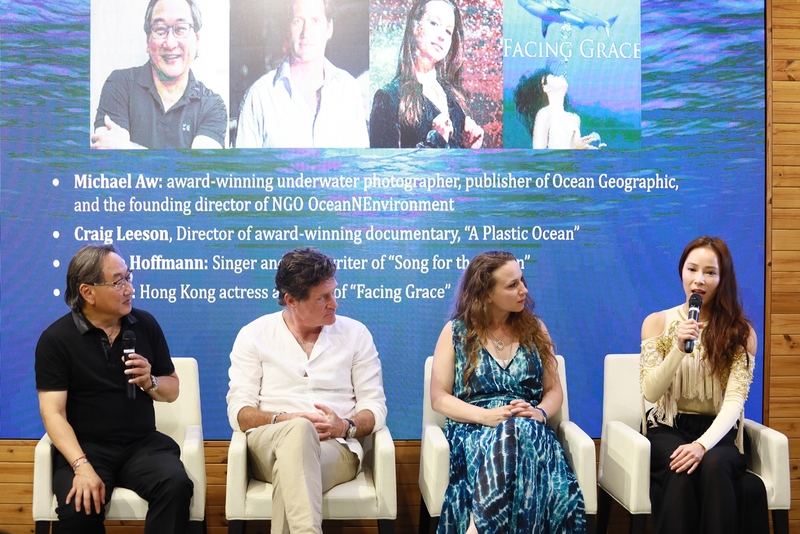 The audience then had a lively and engaging sharing session with the panelists, which includes Michael Aw, Kristin Hofmann, Craig Leeson, and Hidy Yu, the lead actress in “Facing Grace”. CDL Group CEO Sherman Kwek closed the evening by pledging his support and commitment to save the oceans, reiterating the importance of environmental conservation for all. 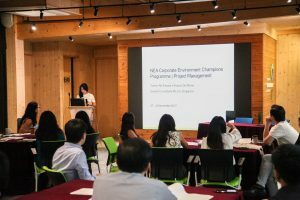 The NEA Corporate Environmental Champions Programme aims to equip representatives of corporate and non-government organisations with skills and knowledge to implement environmental initiatives within and beyond their organisations. The workshop, attended by 36 people, aimed to impart useful project management skills to help participants drive environmental initiatives back in their own workplaces. 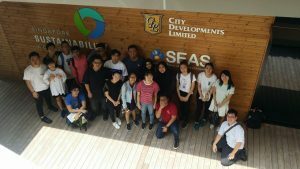 Experienced NEA environmental partners also shared their own insights and experiences, and participants were brought on an educational site visit to Siloso Beach Resort. 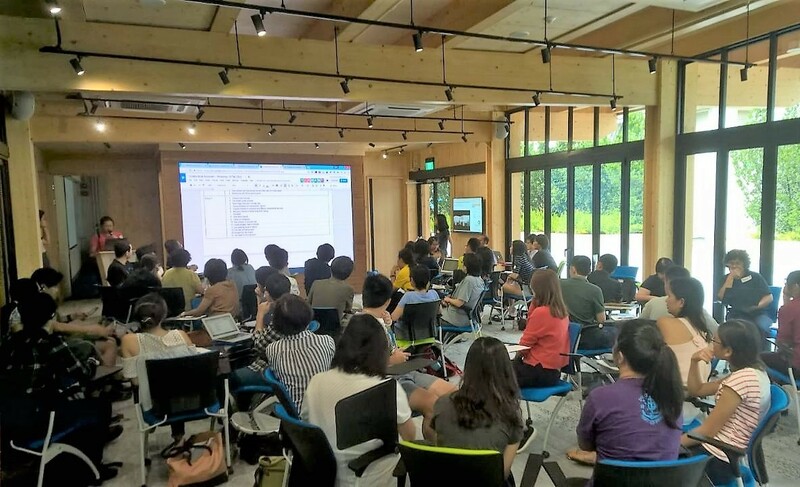 This is the second time the workshop has been held in the Singapore Sustainability Academy. The NEA is one of the Academy’s founding government agencies and a frequent partner in events to spread environmental awareness and increase outreach among the people, private and public sectors. 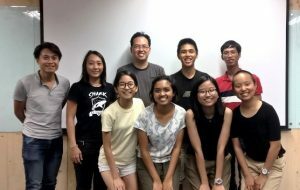 Local non-governmental organization (NGO) Zero Waste Singapore gathered some 20 volunteers to engage and involve them in the NGO’s focus areas and activities in 2018. These include public talks about the Bring Your Own (BYO) campaign, recycling, and food waste, as well as social media outreach and engagement. Plastic and food waste have been major concerns for Singapore over recent years, with the government and civil society ramping up efforts to advocate use of non-disposables and methods to prevent food waste through public education and partnerships. 25 pre-school teachers attended two fun-packed sessions of “Learn, innovate, play”, a workshop organized by the National Environment Agency (NEA) and Environiche LLP. The teachers were taught on the fundamentals in environmental education, which included topics such as anti-littering, 3Rs, dengue prevention, environmental hygiene and energy efficiency. One of the highlights of the workshop was an experiential learning journey collecting recyclables from City Square Mall to create a “games of yesteryears” bazaar! Pre-school teachers had to be resourceful to “shop” for recyclables by requesting them from the mall’s tenants. They crafted these recyclables into games, an exercise that brought out their creative sides and prompted a discussion about how to integrate environmental education into the pre-school curriculum in a fun and educational way. Improving the quality and accessibility of pre-school education was highlighted in Prime Minister Lee Hsien Loong’s National Day rally speech in 2017 as a key strategy to foster social mobility and sustain a fair and just society. A main tenet of this will also be instilling a strong environmental consciousness in Singapore’s youths. 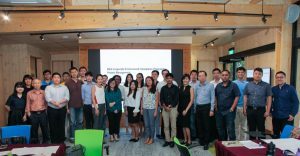 CDL hosted a CDP Workshop at the Singapore Sustainability Academy, conducted by Dr Tony Rooke, CDP’s Director of Technical Reporting on 22 March 2018. CDP (formerly the Carbon Disclosure Project) is a not-for-profit charity organisation that runs the global disclosure system that enables companies, cities, states and regions to disclose their environmental data. 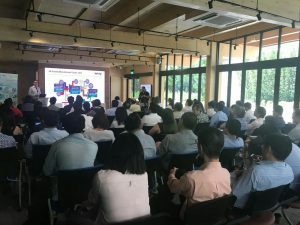 The workshop was attended by over 60 potential first-time and experienced corporate disclosers such as Singtel, Fuji Xerox, Sembcorp, UOB, and other companies. 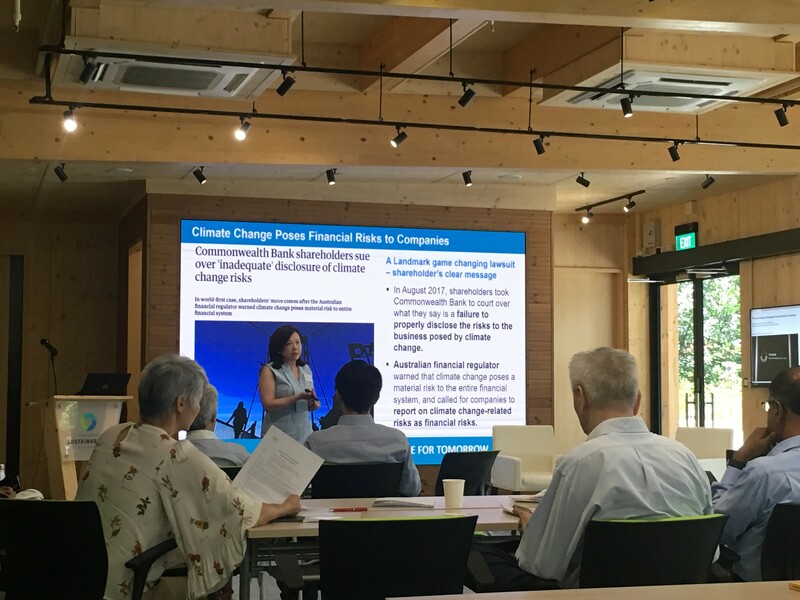 Participants were briefed on the changes in the upcoming carbon, water and forestry disclosures, including alignment with the Recommendations of the Taskforce for Climate-related Financial Disclosures. CDL’s Chief Sustainability Officer, Esther An also gave a short presentation on CDL’s CDP reporting journey. 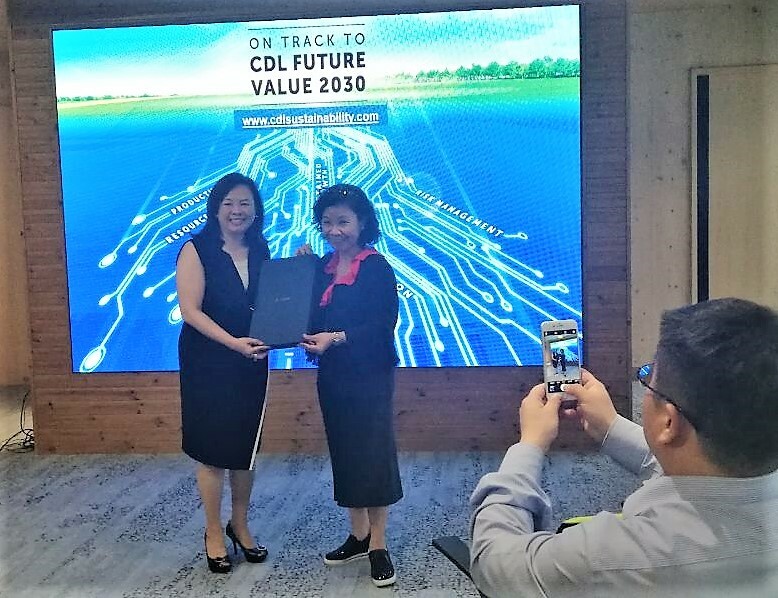 CDL was the first Singaporean company to disclose its carbon emissions with CDP, and attained the Leadership level rating of A- in 2017. 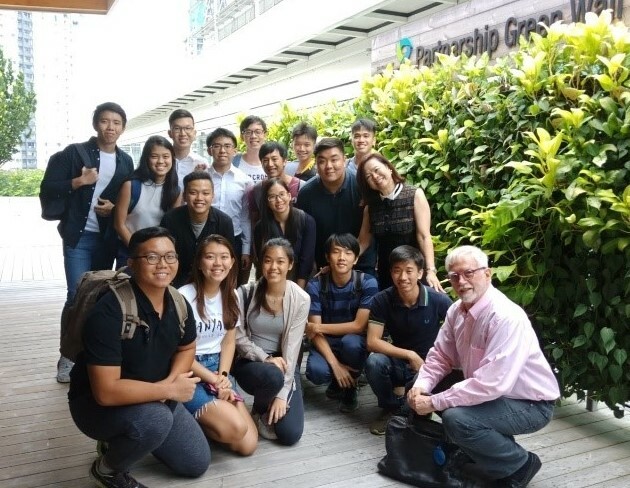 Newly appointed Dean of the Yale School of Forestry and Environmental Studies, Professor Indy Burke visited the SSA as part of a learning trip to Singapore, hosted by the National University of Singapore (NUS) Law school. 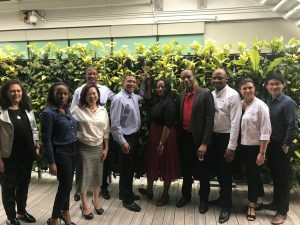 Taking a particular interest in CDL’s efforts at greening the built environment, she was given a tour of the SSA to learn about its green features and community outreach efforts. 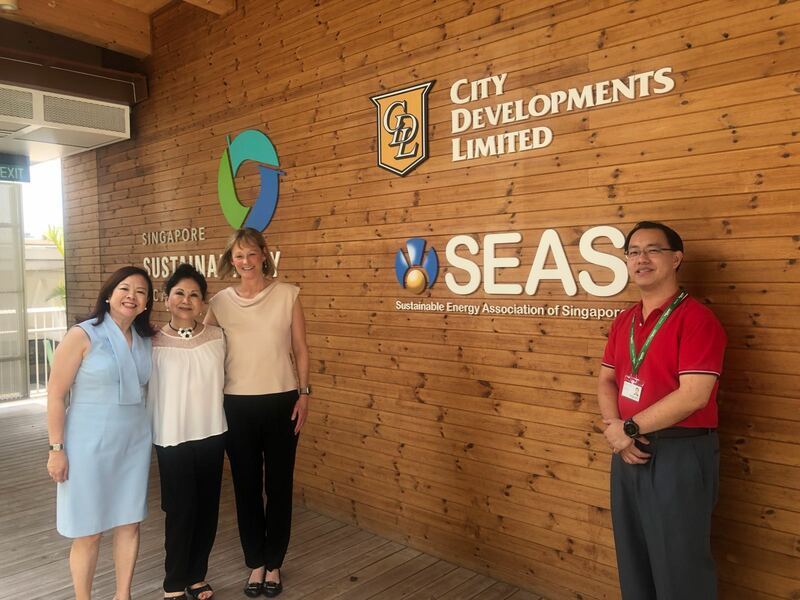 Esther An, Chief Sustainability Officer of CDL, gave an overview of CDL’s green building expertise and the SSA, and Kavita Gandhi, Executive Director of the Sustainable Energy Association of Singapore (SEAS) spoke about SEAS’ work in training energy managers and increasing sustainable energy uptake in the region. The visit was also accompanied by technical experts from CDL and Schneider Electric, who supplemented their professional knowledge on the SSA’s sustainable construction materials, design and real-time energy tracking feature. CDL and the Singapore Green Building Council (SGBC) co-hosted a visit for Mr John Paul Phelan, Minister of State for Local Government and Electoral Reform of The Republic of Ireland (third from left) and His Excellency Mr Geoffrey Keating, Irish Ambassador to Singapore (fourth from left) at the zero-energy Academy. 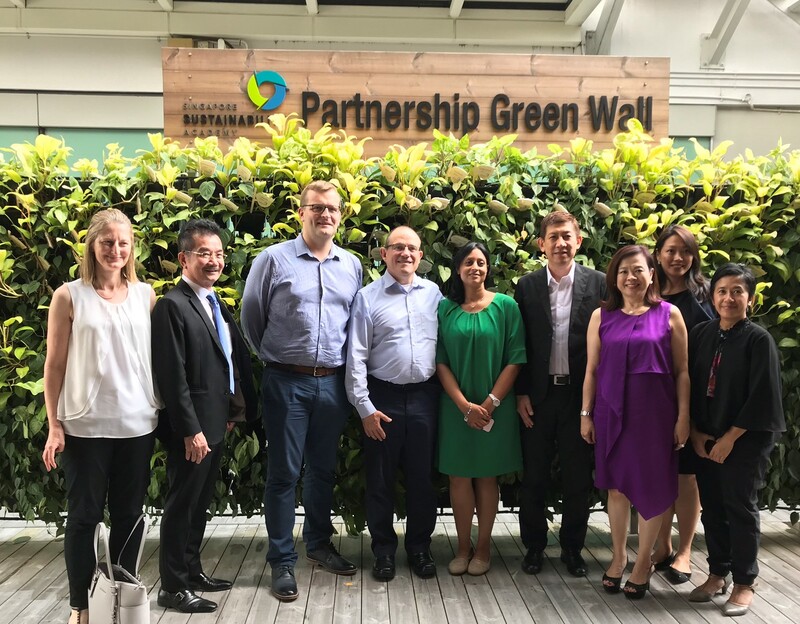 CDL’s Group General Manager Mr Chia Ngiang Hong and Chief Sustainability Officer Esther An, shared CDL’s journey as Singapore’s green building pioneer, while SGBC representatives spoke to the distinguished visitors about green building industry best practices. 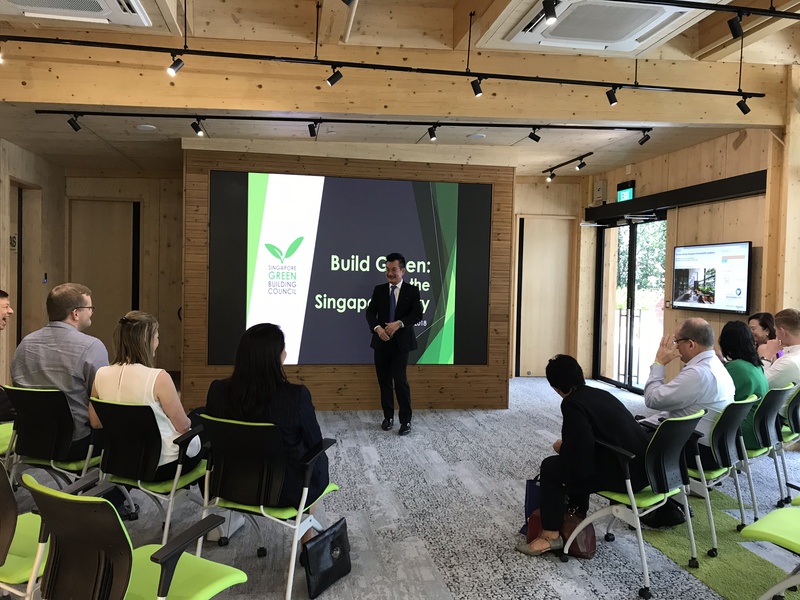 The Minister complimented Singapore’s urban planning and CDL’s unwavering commitment to sustainability, and has committed to taking away some practices to advance Ireland’s green building efforts. 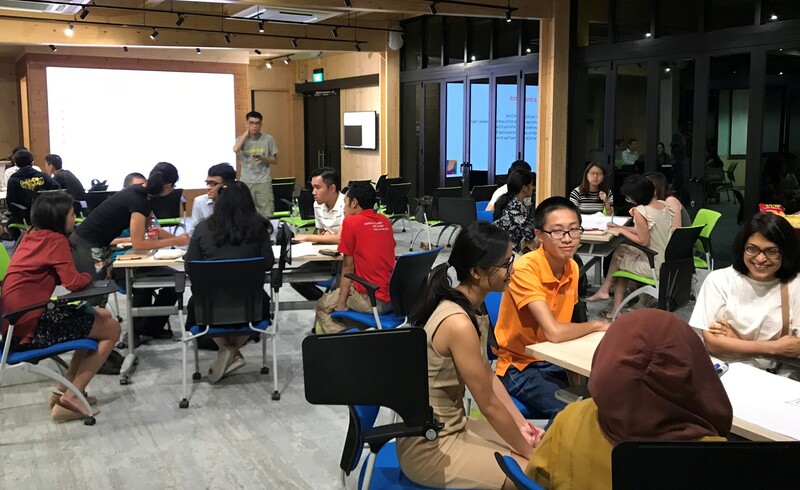 Singapore Youth for Climate Action (SYCA) hosted a Climate Community meetup to discuss the actions that the ASEAN Community can take collectively to meet the region’s energy and climate change challenges. Attracting almost 30 participants from civil society, schools, corporates and the non-profit sector, the group held a sharing about SYCA’s upcoming plans and projects for the year, and broke out into smaller groups to discuss the topics for the day. 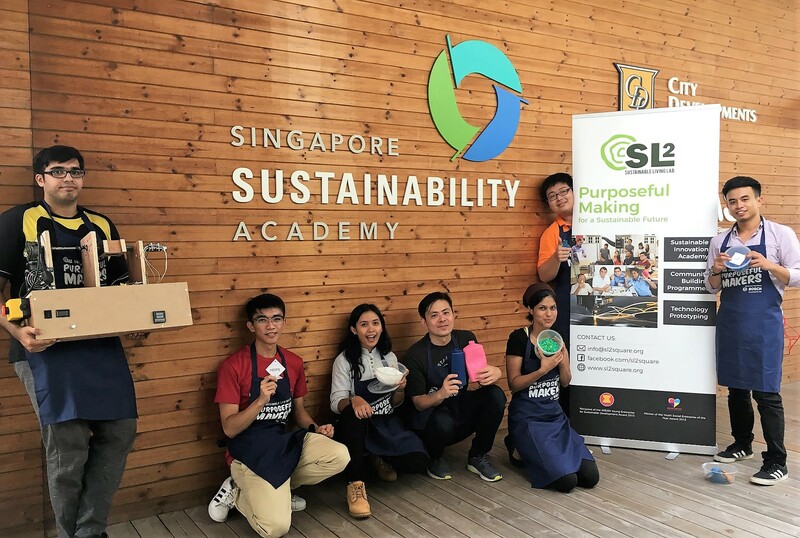 As a non-profit space dedicated to sustainability, the SSA is pleased to support youth groups in advancing their cause and providing a platform for them to part a part in the sustainability movement in Singapore and beyond. 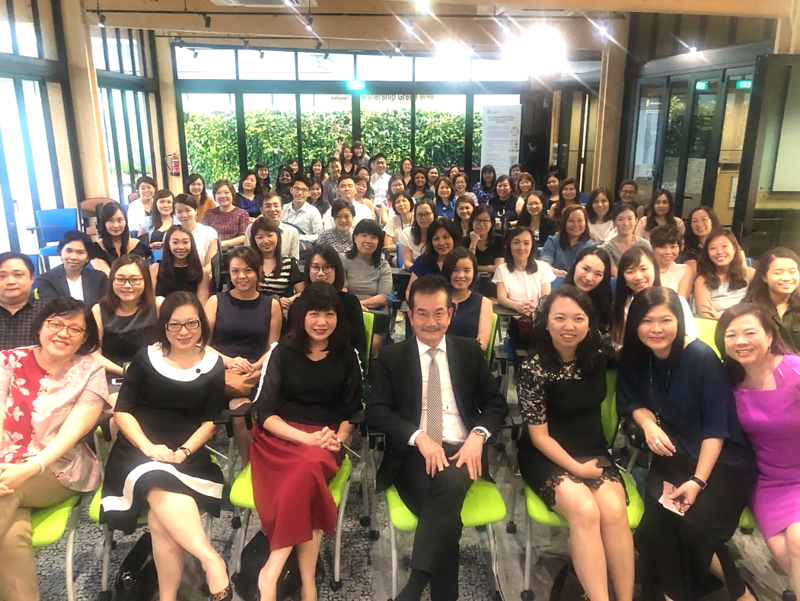 On 8th March, the International Women’s Day, CDL Diversity and Inclusion Task Force organised an inaugural employee engagement event to promote gender diversity and women empowerment at its workplace. It brought together some 80 employees from CDL and its subsidiaries, and the SSA provided a comfortable environment for them to meet, mingle and learn from each other, away from the office. The session was opened by Group General Manager and long-time mentor to many in CDL, Mr Chia Ngiang Hong. He acknowledged CDL’s strong female workforce for their contributions and encouraged the company to keep making efforts in diversity and inclusion. 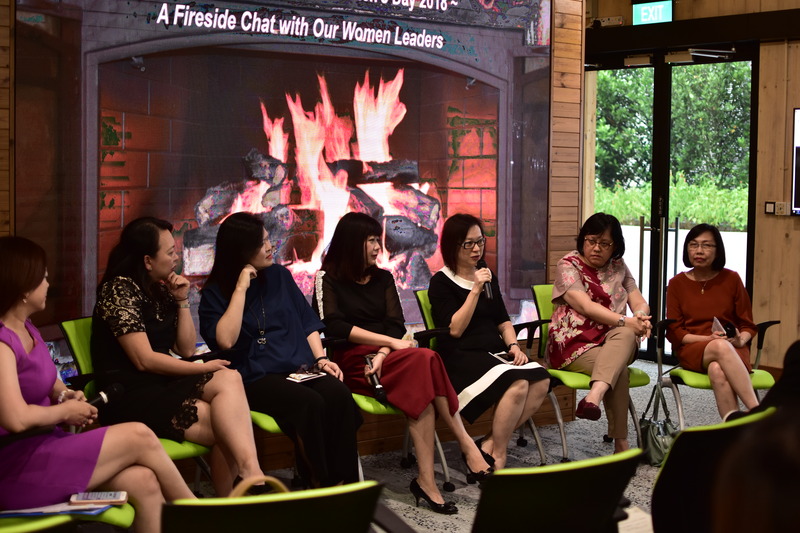 Through a cosy fireside chat with seven of the company’s long-serving women leaders, who have been with the company between one to three decades, employees then picked up useful advice on how to excel professionally while maintaining work-life balance. The Task Force also seeks to promote a supportive workplace ecosystem for working women and inspires young employees through female role models. 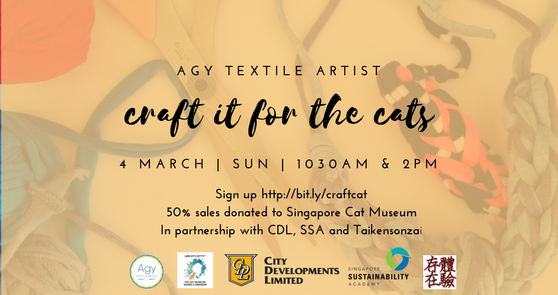 As part of CDL’s annual zero-waste campaign EcoBank and launch of responsible fashion initiative Fashion 3R, organizing partner Connected Threads Asia coordinated with upcycling artist and environmentalist Agatha Lee to conduct an upcycling workshop on 4 March, ‘Craft it for the Cats!’ at the Singapore Sustainability Academy. Close to 30 participants learned how to transform an old T-shirt into a necklace, and half of the proceeds were donated to local volunteer-run cat sanctuary, The Cat Museum. The workshop showed that climate action and opting for sustainable fashion and accessorizing can be fun and accessible, and people can switch up their style while remaining sustainable. 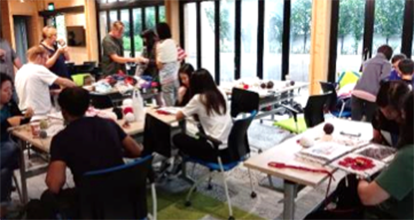 As part of CDL’s national zero-waste campaign EcoBank 2018 and its launch of responsible fashion initiative Fashion 3R, CDL hosted a Swap Party by Swapaholic for the first time at the Singapore Sustainability Academy. 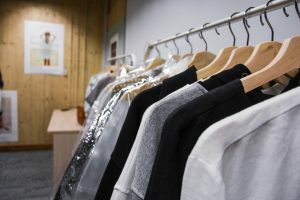 Fashion 3R is a collaboration between CDL, Connected Threads Asia, Raffles Design Institute, and Eco-Business that aims to promote responsible purchasing and disposal practices among consumers and the public. Organised by local responsible-fashion NGO Swapaholic, monthly swap parties aim to promote ‘Swapping as the new Shopping’, providing conscious consumers a stylish retail-type platform to swap great-condition pre-loved clothes instead of buying new ones and contributing to landfill. The SSA was transformed into a retail ‘gallery’, providing a space both inside and at the sky park outside for attendees to swap in a sustainable space. 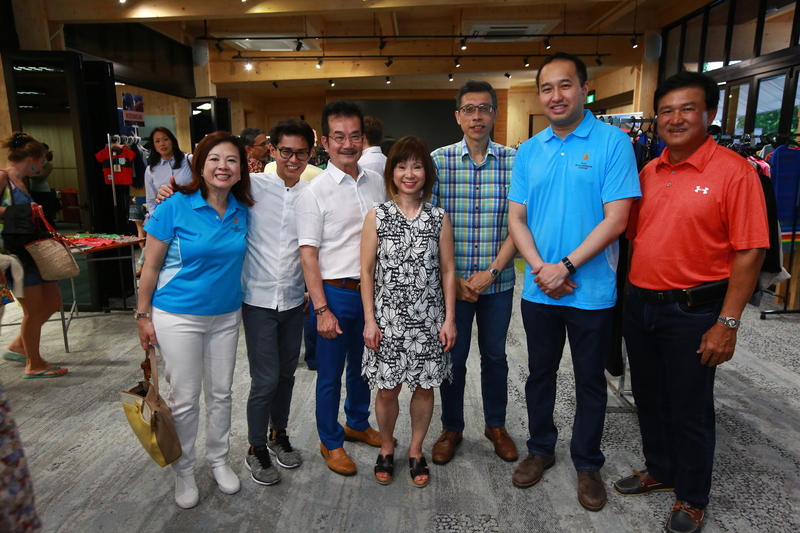 The swap party attended by over 160 and graced by Senior Minister of State for the Environment and Water Resources, Dr Amy Khor, and CDL Group CEO Sherman Kwek, was a fun-filled time of clothes-swapping and camaraderie for all. Over 1,700 pieces of clothing were collected and found new owners during the swap, effectively saving it from contributing to added carbon emissions. It is a great example of taking action for the climate in a fun and accessible way, part of the SSA’s mission to galvanize collaborations and increase engagement over sustainability across all sectors and industries. 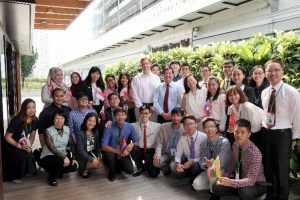 Professor Daniel C. Esty, Hillhouse Professor of Environmental Law and Policy at Yale School of Forestry & Environmental Studies and Visiting Professor at Yale-NUS College, brought a class of 15 Yale-NUS students to visit the Singapore Sustainability Academy and South Beach as a showcase of green-building industry best practices. Teaching a class about ‘Climate Change and the Future of Energy, the visit to the SSA demonstrated to the students how corporates can contribute to climate action and the SDGs through leveraging their own expertise and core business strategy. Professor Esty’s 2006 book on how smart companies use environmental strategies to innovate, ‘Green to Hold’, has long served as an inspiration and source of useful pointers for CDL’s sustainability strategy to ‘Conserve as we Construct’. The 2nd to 4th year students from the Environmental Studies, Urban Studies and Philosophy, Politics and Economics (PPE) majors were remained curious and interested throughout asking many questions about CDL’s history and continuous efforts in pushing sustainability in its business practices and community investment efforts. At this landmark meeting organized by the WWF and Southeast Asian Alliance for Sustainable Palm Oil (SASPO), graced by Mr Masagos Zulkifli, Minister for the Environment and Water Resources (MEWR), the SASPO’s member companies were lauded for their latest commitments to introducing sustainable palm oil to their supply chains. Minister Masagos also announced 10 new companies joining SASPO, namely Bee Cheng Hiang, F&N, Commonwealth Capital, Compass Group, Paradise Group, Tong Seng Produce, Tung Lok, Super, Delfi and Crystal Jade. SASPO, which champions the use of sustainable palm oil in Southeast Asia, now has 15 member companies. Together, these companies account for over 200 food and beverage outlets in Singapore, including PastaMania and The Soup Spoon. 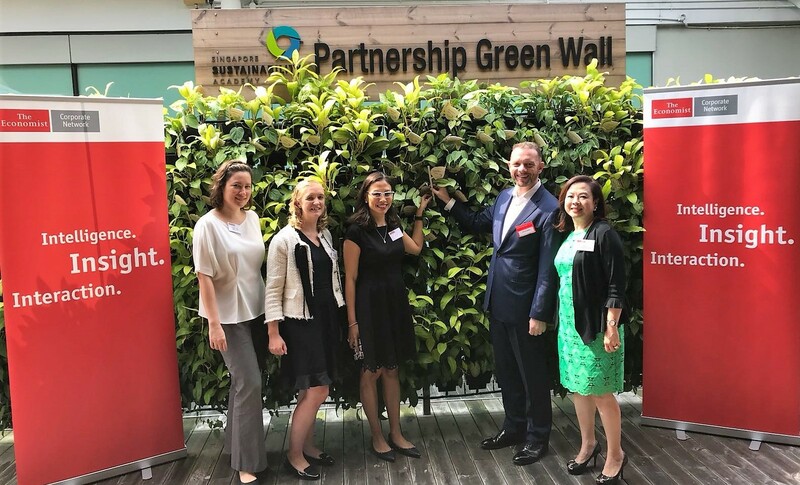 This is a milestone for the industry-led alliance, and sends a clear signal that businesses in Singapore have taken the lead to transition towards using 100% sustainable palm oil. Some 70 industry leaders and alliance representatives attended the event, providing their support towards SASPO. After the announcement, a panel comprising of Hervé Simon, group marketing director of Denis Asia Pacific, Mike Barclay, chief executive of Wildlife Reserves Singapore, Andrew Tjioe, chief executive of Tung Lok group and Andrew Kwan, group managing director of Commonwealth Capital, shared why and how their organisations shifted to using sustainable palm oil at SASPO’s press event. 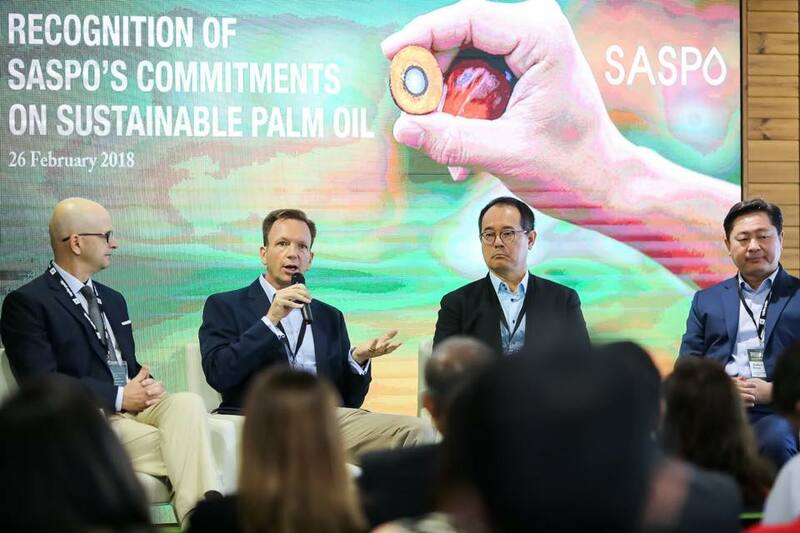 Despite the challenges, these industry leaders regard the membership with SASPO as a privilege to help raise awareness among consumers the importance of using sustainable palm oil. 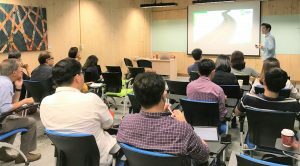 The Singapore Institute of Directors (SID) held its Business Future series on “Sustainability for Directors” at the Singapore Sustainability Academy on 21 February 2018. 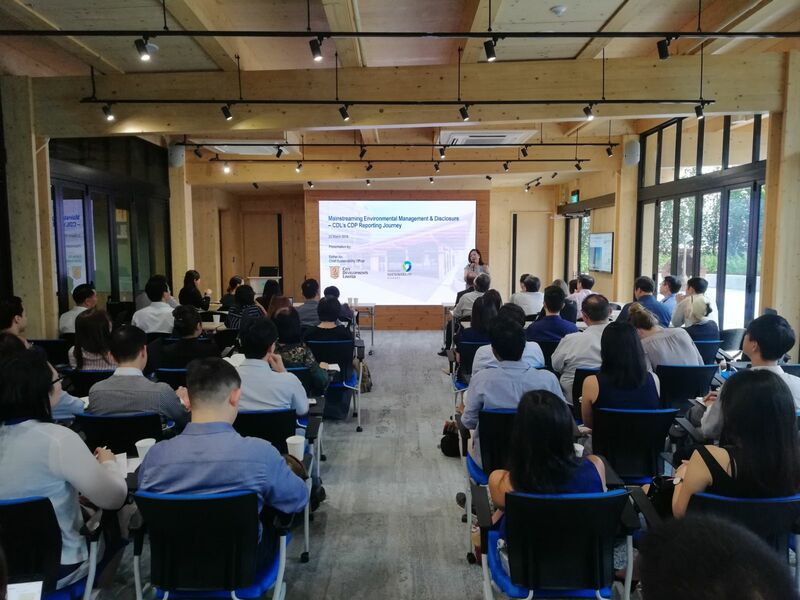 Attended by over 20 company directors, speakers from Ernst & Young (EY) and CDL gave attendees an overview of the ecosystem of sustainability and why it makes a compelling business case. Mr. K. Sadashiv, Managing Director (ASEAN) of EY’s Climate Change and Sustainability Service, gave an engaging presentation on key sustainability milestones and touched on trending sustainability topics such as green bond financing, the role of the board in ensuring sustainability and global and societal expectations of companies in delivering sustainability. Using industry case studies, he explained how sustainability reporting, which is now required of SGX-listed companies, can be done. Esther An, CDL’s Chief Sustainability Officer, effectively highlighted the many opportunities that adoption of sustainable practices can bring, drawing on examples from CDL’s sustainability journey over the past two decades. 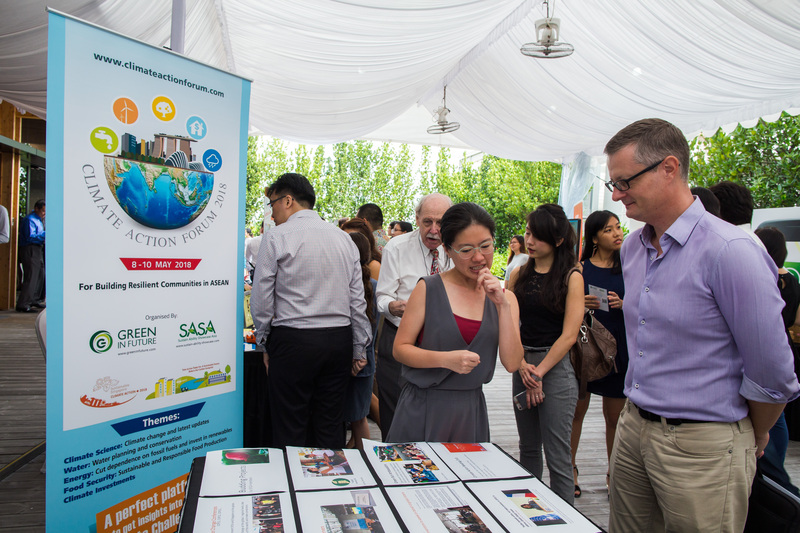 Attendees also saw first-hand how the SSA is an example of a company creating value through stakeholder engagement and outreach, effectively expanding the community of like-minded sustainability professionals in Singapore. 2018 has been declared the 3rd International Year of the Reef (IYOR) by the International Coral Reef Initiative. To commemorate this, LepakinSG has planned a series of activities and events throughout the year, ‘Sea Our Shores’, to educate and engage the public about Singapore’s seas and reefs. About 40 first timers, together with experienced guides were gathered to participate in the third installment of Sea Our Shores: A Guide To Guiding! Participants shared and discuss what makes a good nature guide (it’s not the knowledge!) 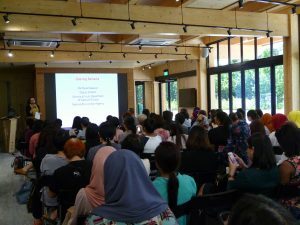 as Ms Ria Tan of www.wildsingapore.com shares tips on guiding effectively and how to connect with the participants. Facilitated by experienced guides from various green groups in Singapore, participants were guided through hands-on activities to brainstorm solutions to their deepest nature guiding worries. Participants were also prepped to guide a walk held the next day to let them showcase their newfound skills. 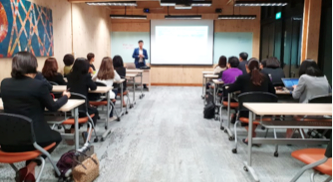 In partnership with the Lien Centre for Social Innovation in SMU, CDL hosted a delegation of six 3rd and 4th-year students and two faculty members from Keio University’s Keidai Faculty of Business and Commerce. This is part of their Global Passport Programme, a selective honors program offered in English to upperclassmen from all Keio faculties. The focus of their visit to the Academy was to learn about sustainability and business, a topic that has been a hallmark of CDL’s strategy and core business over the past two decades and remains a cornerstone of its success in breaching new heights. Through this, the Lien Centre hoped that CDL and SSA will help Singapore’s foreign counterparts to learn how successful business and social value creation are possible in tandem. The ASEAN CSR Network (ACN) is an international non-profit body that facilitates sharing of knowledge and best practices from CSR Networks across five ASEAN countries. Leveraging the SSA as a platform to engage business, community and youths over low-carbon, resource efficiency, and the Sustainable Development Goals (SDGs), ACN convened a closed-door dialogue between almost 20 members of its corporate partner networks and ACN’s staff and management. They explored areas for alignment between companies’ CSR strategies and ACN’s work around promoting responsible business in the region. Through sharing about ACN’s vision for promoting sustainable development in the region, its workplan and pillars of work, they sought to identify ways that ACN could bring value to corporate partners’ CSR strategies. Having integrated its ethos of ‘Conserving as we Construct’ into its business operations since 1995, CDL strongly believes that businesses play an important role in advancing sustainability in the corporate ecosystem. More than 60 youths attended the National Environment Agency (NEA)’s Youth Partners Appreciation and Networking Session held at the SSA. Organised annually to kick start the year, the session gathered prominent and passionate youths in the NEA’s youth circles to share about environmental initiatives and issues, followed by a networking dinner. Besides learning about topics like Energy Efficiency and Conservation, 2017 United Nations Climate Conference, and COP 23, the event highlighted the recent efforts and accomplishments of some Singaporean youths in the climate scene. The event was well-attended by passionate youths from the Tertiary Institutions Council for the Environment, the NEA’s Youth Environment Envoys, staff and students from environmental clubs in Institutes of Higher Learning, and other partners from the youth sector. On top of appreciating and acknowledging youth partners for their inspiring work, the session also gave an outlook for upcoming programmes and initiatives in 2018, an especially exciting year for the environmental movement as Singapore’s Year of Climate Action. Climate Conversations is a new, non-profit organization that engages the public to have meaningful conversations with friends and family about climate change. It provides training for interested individuals to become facilitators, who will hold conversations with their networks to inspire them to care for the environment and their future while mobilizing them to action. It takes a personalized approach to spreading the word about climate change, empowering people to discuss it meaningfully with others as an effective way of getting them to internalize the importance of acting. They held a series of training sessions for new facilitators at the SSA over three weekends, where 15 new facilitators were taught the basics of climate communications and how to host an impactful conversation. Aiming to reach out to those who typically are not concerned about climate change or don’t know much about it, the Climate Conversations model targets to reach over 10,000 people in the next three years. The Academy was an apt venue to hold the training sessions, as a dedicated platform to ramp up public outreach and engagement over sustainability. The Ministry of the Environment and Water Resources officially launched Singapore’s Year of Climate Action on 26th January 2018 at the SSA. 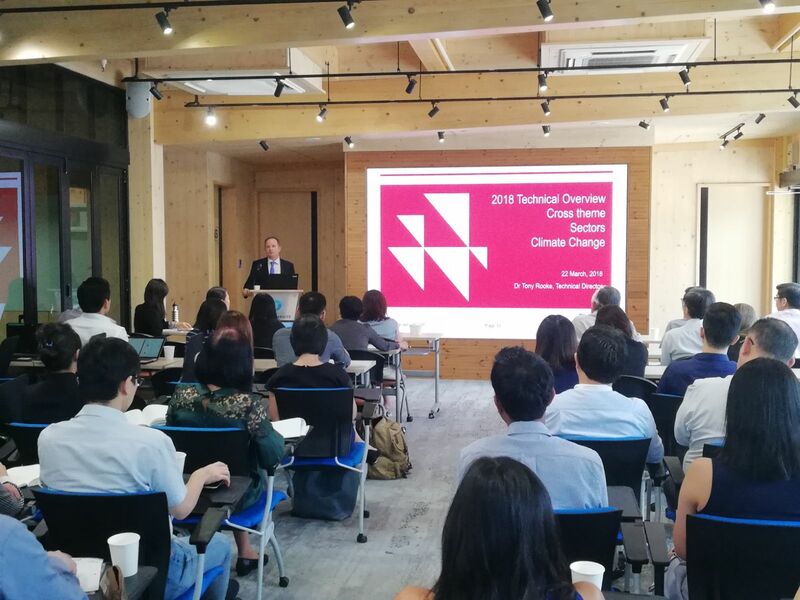 Co-organised with CDL, the event aimed to give prominence to this landmark year for Singapore, and raise national consciousness around the need to take individual and collective action against climate change for a sustainable Singapore. 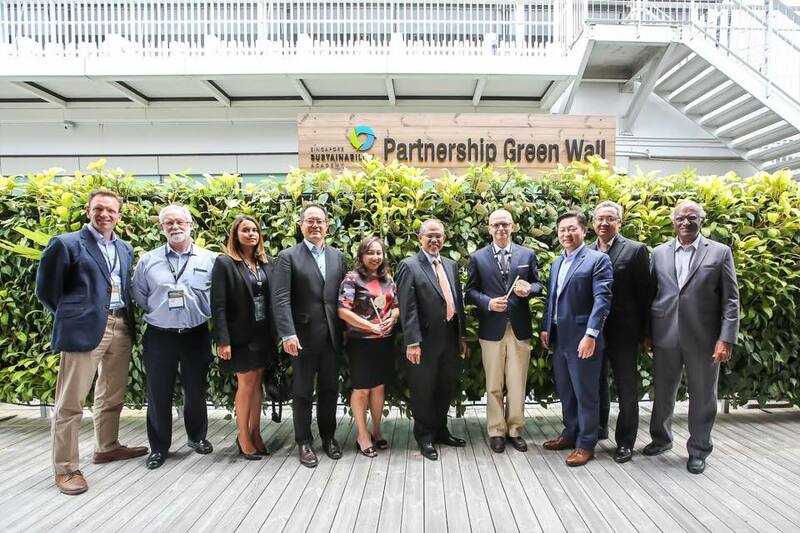 The event was graced by Guest of Honor Mr Masagos Zulkifli, Minister for the Environment and Water Resources, Mr Sherman Kwek, Group CEO of CDL, and over 50 ambassadors and diplomats. It saw a turnout of over 200 representatives from government, corporations and civil society. 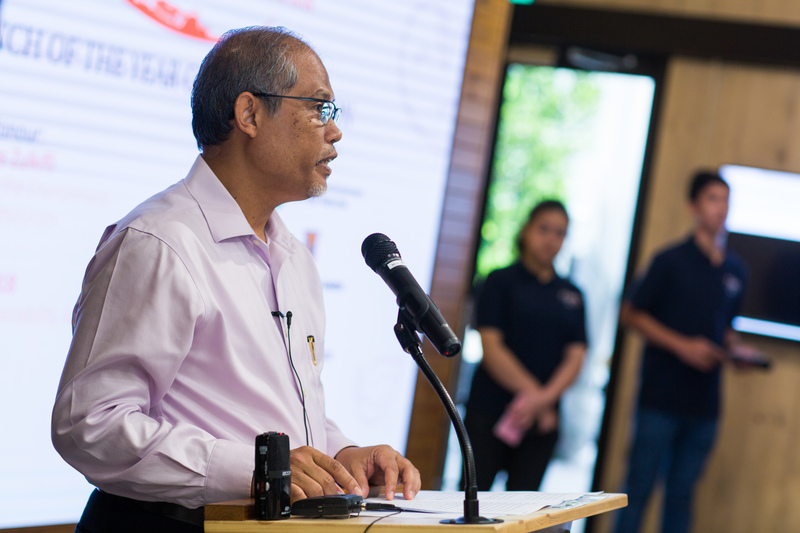 Minister Masagos delivered a rousing opening speech that credited organizations and individuals who had been taking action for the climate prior to 2018, and encouraged others to follow suit. Mr Sherman Kwek addressed the audience on the need for businesses to embark on sustainability integration, citing CDL’s own positive experience in doing so. At the event, CDL launched the second edition of its Little Green Hearts series: Budding Little Green Hearts. 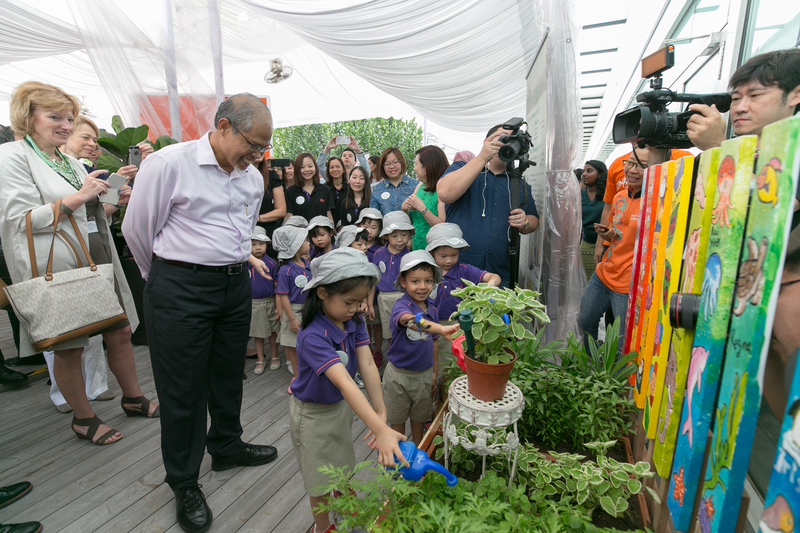 A new community programme to connect kids to nature organised in partnership with local non-profit Ground-Up Initiative, the initiative involved 35 pre-schoolers from LEAP SchoolHouse in the planting and decorating of a herb planter box at SSA. The CDL 6th Sculpture Award Commissioned Artwork – Towards Zero-waste, using residual wood from SSA construction, was also unveiled by Minister Masagos. CDL E-Generation Challenge Distinction Award Winner Inch Chua, a home-grown local singer, specially composed and performed a song on Climate Action to commemorate the momentous occasion. 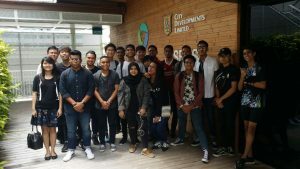 The BCA BiG Club, which promotes greater awareness and understanding of sustainability among passionate youths and future green building professionals, organized a learning journey to the SSA and City Square Mall for 38 club members from local polytechnics. Put together by its youth leaders, the learning journey brought the students on a tour of the Green Mark Platinum-certified City Square Mall to learn about its distinguishing green features, followed by an upcycling workshop in the SSA. The students saw first-hand how the SSA runs on energy produced by the solar panels on its ceiling, as well as how it tracks its energy consumption in real-time during a short tour. The upcycling workshop then gave them the opportunity to learn about how to practice sustainability in their daily lives in a fun way, while building ties between these like-minded youths. Youth development is one of CDL’s main priorities in our community investment programmes. 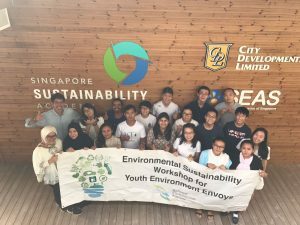 With 2018 having been designated Singapore’s Year of Climate Action by Minister for the Environment and Water Resources Masagos Zulkifli, CDL has ramped up efforts to support youth climate actions through the SSA as a platform for collaboration, capacity-building and training. On 20th December, the SSA hosted a meeting and brainstorming session for local environmental interest groups and non-profits, to discuss upcoming plans and partnerships for the year ahead. The meeting was organized by representatives from #LepakinSG and Singapore Youth for Climate Action. The inaugural session gathered over 50 participants from over 30 local organizations in different fields, representing a range of causes like food waste, plastic pollution, biodiversity, climate communication and awareness, and the arts. Through a series of small group discussions and collective sharing, the group came up with new projects for different sectors in the year 2018 and proposed avenues for further collaboration and actions. In line with the SSA’s mission to contribute to a low carbon society, CDL supports the ‘Climate Take Back’ initiative organized by Interface, one of SSA’s founding partners. It aims to drive a fundamental shift in global responses to climate change by bringing together leaders in different fields to collectively imagine a new climate future. 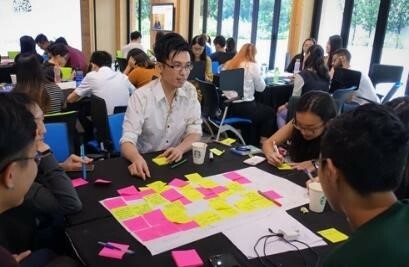 Knowing the potential for youths to contribute to creating a climate fit for life, the workshop brought together 46 young leaders from Singapore in an outcome-oriented ideation workshop on 16 December, to move the ‘Climate Take Back’ dialogue forward. This half-day session gave them the opportunity to learn about tangible examples of what practices have been helping us go beyond a carbon reduction mindset to one of reversal, and to engage with industry practitioners and other young climate leaders to look at new approaches to climate action. 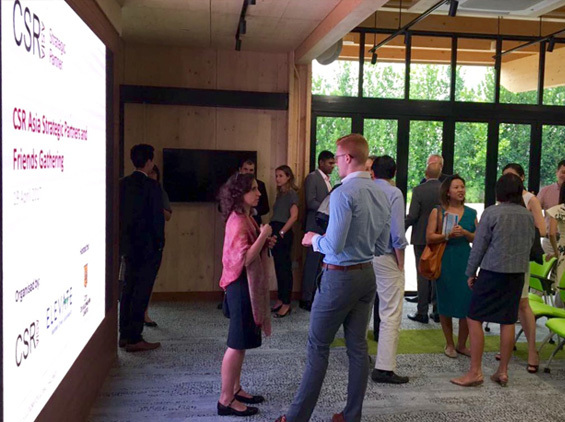 Participants were first introduced to the Zero-Energy Academy as an example of how companies can facilitate collective action and dialogue around climate change. They were then given an overview of the ‘Climate Take Back’ initiative before breaking up into groups to work on one of four ‘Climate Take Back’ pillars: ‘Live Zero’, ‘Love Carbon’, ‘Lead the Industrial Re-Revolution’ and ‘Let Nature Cool’. Participants worked in small groups to come up with ideas and action plans to achieve these four pillars, and presented their solutions to the group who voted on the most innovative and comprehensive solution. As part of CDL’s efforts on knowledge sharing and capacity building, CDL hosted seven delegates from the Buildings Department of the Government of the Hong Kong Administrative Region on the 6th of December. They began their excursion at the SSA with a brief introduction to CDL by Chief Sustainability Officer, Esther An. Four of SSA’s Project Partners, namely REC Solar, Venturer, Schneider Electric and Woh Hup Construction were also present to provide their technical inputs on the SSA’s most unique sustainable features, like the solar panels and real-time energy tracker. 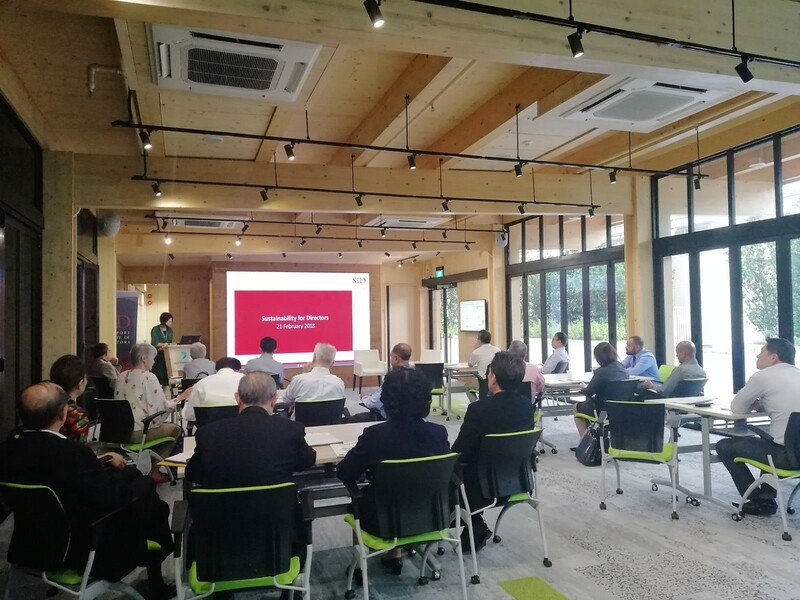 The delegates were particularly keen on learning about the application of Cross Laminated Timber and Glulam which were not only made from renewable sources but due to the prefabricated nature of the structural wood, enabled CDL to complete construction in under six months. Timber specialists Venturer shared their insights and process generously whilst Schneider Electric, who installed the real-time automation control and energy management system edified the group on the inner workings of the system. The delegation then proceeded to South Beach, CDL’s award-winning mixed development located along Beach Road. They were taken for a tour of the area and treated to a view of the photovoltaic modules fitted on the buildings as well as the microclimatic canopy engineered and designed to provide naturally ventilated shelter, encouraging airflow and filtering out radiant heat. The last stop on the tour was at the Brownstone Executive Condominium which is renowned for its extensive and possibly largest application of prefabricated, prefinished, volumetric construction in the world. Teambuild, the contractors, presented on the key features of this development which achieved higher productivity and lower environmental impact through innovation. The delegates engaged CDL’s technical experts throughout the tour and drew parallels to the status of development and productivity in Hong Kong, thus creating opportunities for both parties to learn from each other. The Young Southeast Asian Leaders Initiative (YSEALI) is a programme by the U.S. Government that aims to empower Southeast Asian youth to collaborate on regional and global challenges. 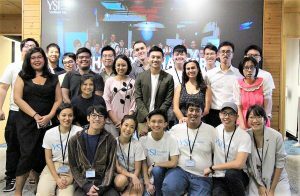 Every year, YSEALI organizes alumni from their Southeast Asian networks to conduct projects and activites to catalyse social and environmental change, under a programme called YOUnified. 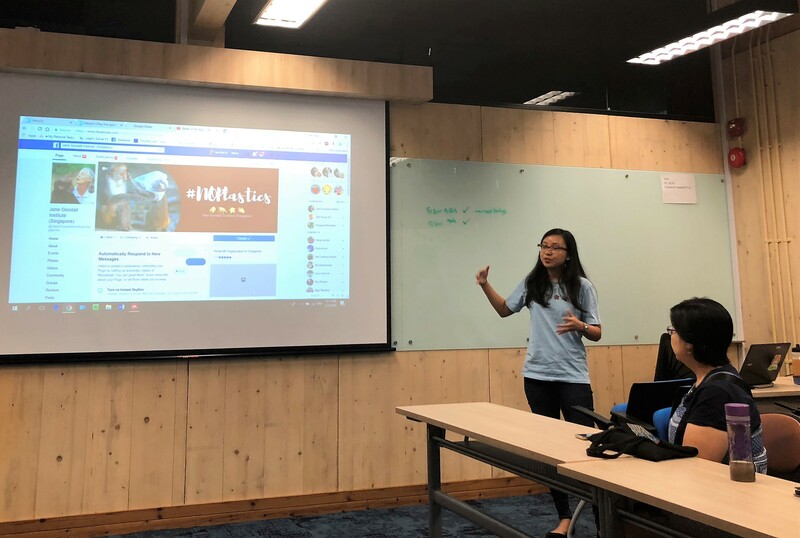 YSEALI YOUnified projects tackle a wide range of pressing issues, from environmental protection, to minority rights and human trafficking, to youth empowerment and entrepreneurship. The audience of young people were similarly inspired and excited to connect with other equally passionate and committed youths, asking questions and planning future initiatives throughout the evening. 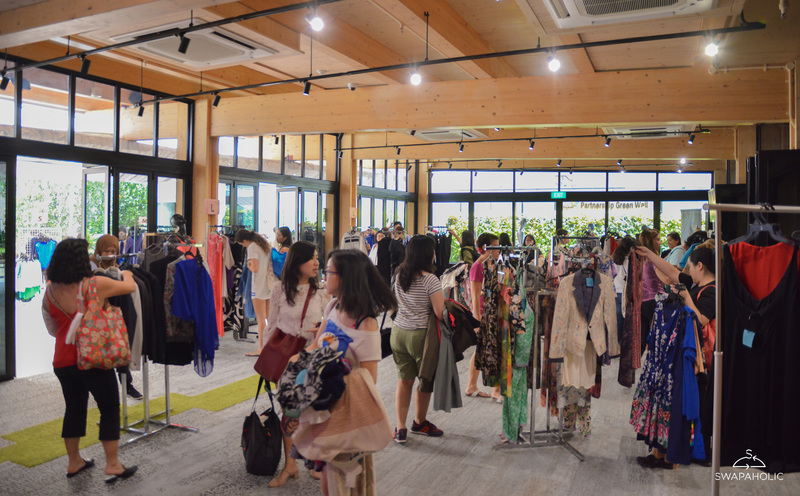 Connected Threads Asia conducted the final session of a series of talks on the topic of Fashion Sustainability. 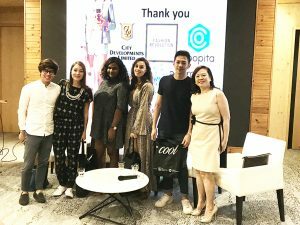 With a focus on “The Business of Sustainable Fashion”, four invited speakers from Green is the New Black, Zerrin, Coopita and Source Collections came together to share about how they maintained sustainable fashion businesses in the highly competitive fashion market in Singapore. 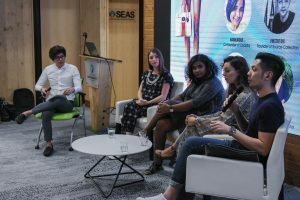 The speakers also discussed the challenges and opportunities of setting up sustainable fashion brands in Singapore, through their own experiences and successes. 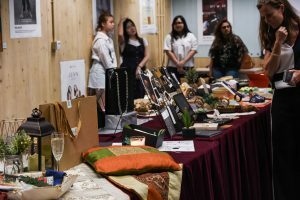 The event was accompanied by an exhibition by students from Raffles Design Institute, who showcased their own works from a project that tasked them to come up with a sustainable fashion line. The audience later voted on their favorite projects from a creative selection featuring clothing, jewelry, accessories and other products made by the students. 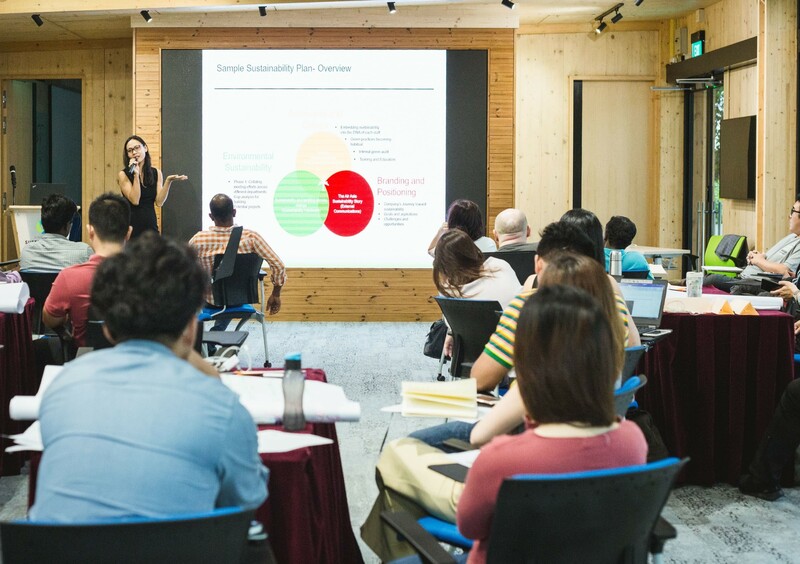 The NEA Corporate Environmental Champions Workshop, held at the Singapore Sustainability Academy on 27-28 November, aimed to equip representatives of corporate and non-government organisations with skills and knowledge to implement environmental initiatives within and beyond their organisations. Seeing increased interest from these sectors around sustainability, the programme was well-attended with over 30 participants from a wide variety of organisations like Khoo Teck Puat Hospital, Nature Society, Ricoh (Singapore) Pte Ltd, Ministry of Health, Interface Asia, LepakinSG and 15 others. The two-day workshop was conducted by Ms Farizan d’Avezac De Moran, Senior Partner of GreenA Consultants, and officials from NEA. Participants acquired both useful project management skills and valuable insights on sustainability through the workshop. This was designed to help them drive environmental initiatives in the office setting after the workshop, while inspiring and equipping them knowledge through sharing sessions by experienced NEA environmental partners. After the workshop at the SSA, participants then went on an educational site visit to Semakau Landfill. With inputs and lively participation from representatives of diverse organizations, the workshop successfully imparted practical and relevant knowledge to help them push their organizations to greater sustainability. Organized in a “speed dating” format, mentors were assigned to one of five roundtables where they interacted with mentees and gave them advice. Mentees later moved around to different roundtables to speak with other mentors. The groups discussed career advancement, management, methods to juggle family and work and numerous other topics relevant to the young, high-potential women at the session. The 4th Annual Sustainability Forum for CDL and the Hong Leong Group was held at the Academy on the 20th of November. Attended by some 90 directors, senior management and sustainability committee members from 11 Group companies, the Forum convened a high-level panel of sustainability experts to explore and discuss about ‘Emerging Trends in Sustainability’. Sustainability is gaining traction globally, especially among businesses looking to tap into new opportunities that also create shared economic, environmental and social value. 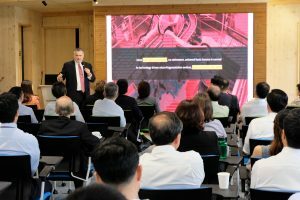 The annual event sought to rouse interest and conversation among directors and top management on how their own companies could leverage on upcoming sustainability trends to create business value. The Forum began with opening remarks by CDL CEO Mr. Sherman Kwek who spoke about how CDL’s early adoption of sustainability since 1995 has strengthened our resilience and ability to adapt to new global challenges. The keynote address by Mr. David Galipeau, Chief Impact Officer of Asia-Pacific, United Nation Development Programme, was highly engaging and insightful. Mr Galipeau shared how businesses can embrace urbanisation and the Sustainable Development Goals (SDGs) for economic opportunities and create positive impact on their stakeholders and communities. Two experts in green financing, Mr. Mikkel Larsen, Managing Director and Co-Chair of Sustainability Council, DBS Bank and Ms. Herry Cho, Head of Sustainable Finance, Asia Pacific, ING Bank, addressed the audience on the opportunities present in green bonds and social impact investment, and how collaborations and innovations can drive financing for sustainable development. Subsequently, Ms. Karen Lee, Sustainability Lead for Asia, Interface, gave a manufacturer’s perspective on how sustainability integration creates business value, as the world’s largest maker of carpet tiles and a pioneer organization in sustainability practices. 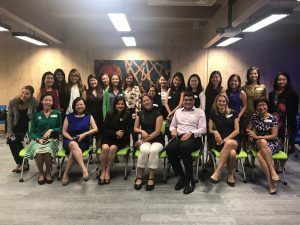 Finally, covering the crucial but often-overlooked topic of gender diversity on boards was Ms. Janet Ang, Member of the Diversity Action Committee Singapore and Vice President of Industry Solutions and Smarter Cities, IBM Asia Pacific. The presentations were followed by a panel discussion moderated by Ms. Esther An, CDL Chief Sustainability Officer, which saw a highly-engaged audience seeking strategic and practical advice from the esteemed panel on how to embrace sustainability best practices such as SDG integration and gender diversity, especially for medium enterprises and first-time adopters. The Academy received 80 students and two lecturers from the Republic Polytechnic Diploma in Green Building Energy Management over four days in November. The students who are 16-17 years old are completing a course on ‘Green Building Technology and Design’. 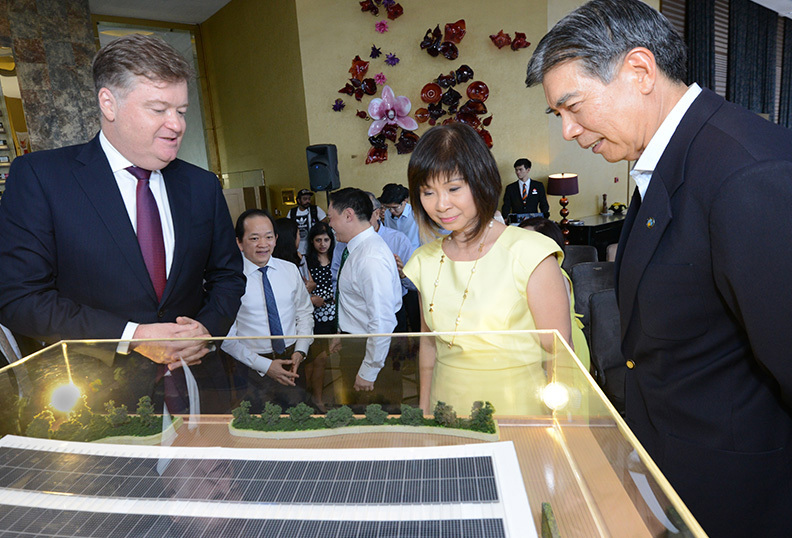 They toured and learnt about the green features and initiatives of City Square Mall, Singapore’s first Eco-Mall opened in 2007. 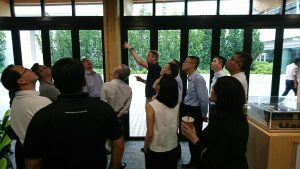 They then proceeded to the Academy on the Mall’s Skypark where they further expanded their knowledge on green building features and solar technologies. The CDL Sustainability team showcased the Academy’s positive energy achievement and real-time energy monitoring system. Students also learnt first-hand about the Nature’s BarcodeTM certified Glued Laminated Timber and Cross Laminated Timber used to construct the SSA. The team also shared about the sustainability-related programmes and events that have been held in the SSA for businesses, the community and youths. The students were inspired by what they learned, and left especially impressed by the Academy’s advanced solar technology and commitment to walking the talk in sustainability. 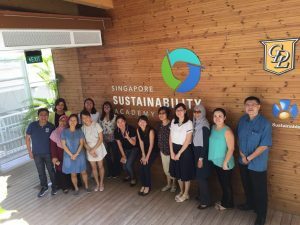 16 graduate students from Universitas Ciputra (Ciputra University) in Surabaya, Indonesia, visited the Academy to learn about best practices in business and sustainability from a Singapore company. The visit was organised by the Singapore Management University’s Business Families Institute, Southeast Asia’s pioneer regional business family-centric institute focused on addressing the needs of business families in the region. The students run their own family businesses in Indonesia across a range of industries. They visited the Academy to observe a key showcase of partnership and collaboration between the People, Public and Private sectors. 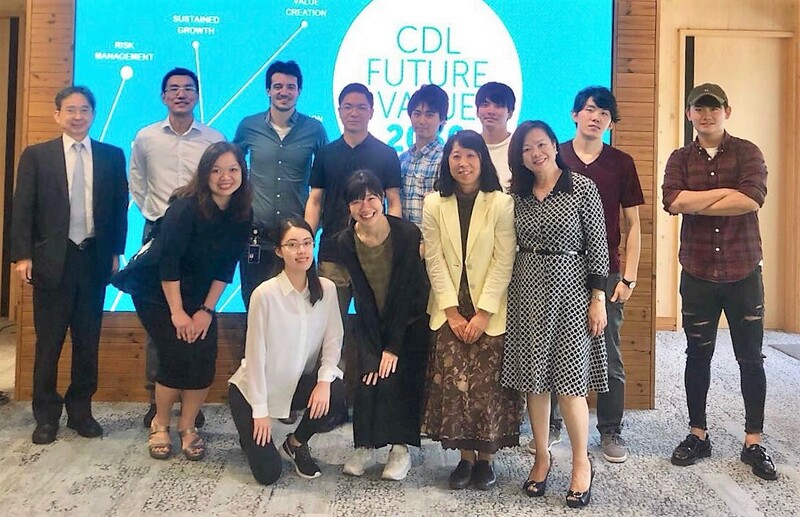 Chief Sustainability Officer, Esther An, shared with the visiting students about how CDL sustainability efforts have evolved beyond a mere corporate social responsibility initiative, to becoming a core business strategy that creates long term value for the company and its stakeholders. 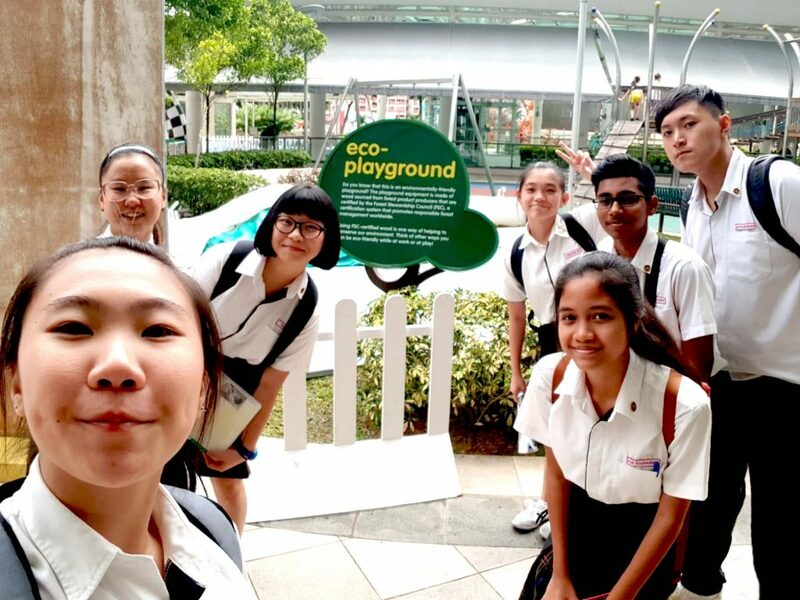 After a tour of the SSA to observe the successful integration of green building features, the students also visited City Square Mall to learn more about its green technologies and initiatives as Singapore’s first eco-mall. 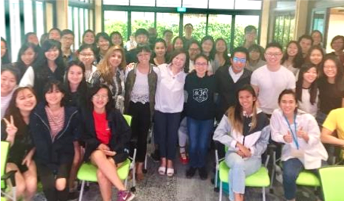 45 local and international students from the Singapore Management University (SMU) visited the Academy as part of a class on ‘Managing Sustainability’ on 20 October. 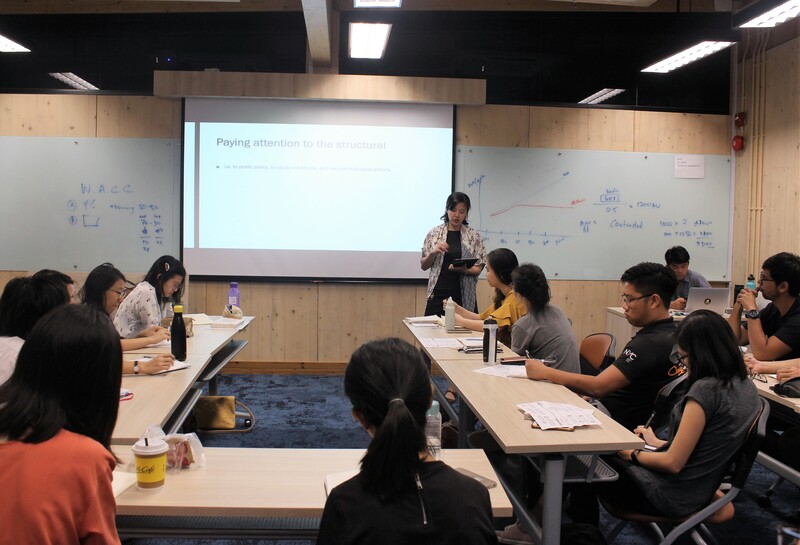 The class, SMU’s first dedicated module on corporate sustainability, is co-designed and taught by CDL Chief Sustainability Officer, Esther An. The students hail from a range of countries, with diverse majors such as Accountancy, Business, Economics, Information Systems and others. The tour of the Academy was accompanied by a presentation by Esther and followed by a visit to CDL’s mixed developments, South Beach. 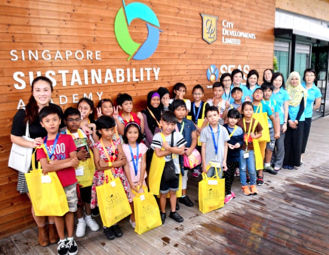 Esther showcased the Singapore Sustainability Academy (SSA) as an example of how businesses can create shared value and goodwill among the business and nonprofit community, and future youth leaders of tomorrow. The positive-energy SSA has generated both tangible and intangible value for CDL and its stakeholders through its annual electricity savings, capacity-building for energy managers, and sustainability advocacy and outreach to hundreds of business partners and youths since its opening. The students were enthused and inspired , continuing to ask questions and observe the Academy’s green design and features after the tour. 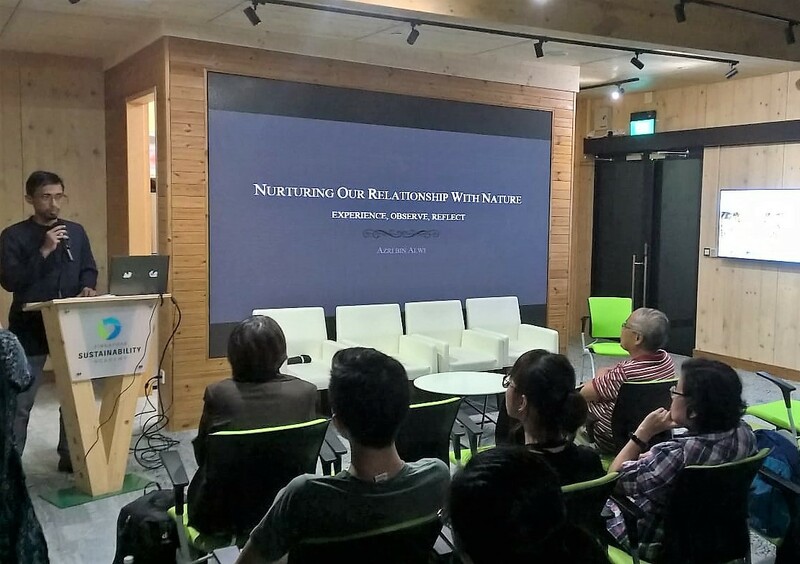 The National Environment Agency (NEA) invited Dr Marcus Gover, Chief Executive Officer of the Waste and Resources Action Programme (WRAP) from England to speak at their Professional Sharing Series that was held in the Singapore Sustainability Academy on 5 October 2017. Some 70 experts from business, government, NGO and academia sectors attended this session. Dr Gover shared insights on the challenges and best practices on resource efficiency and circular economy in UK from WRAP’s research and initiatives with stakeholders; and the challenges and opportunities ahead for industries globally. 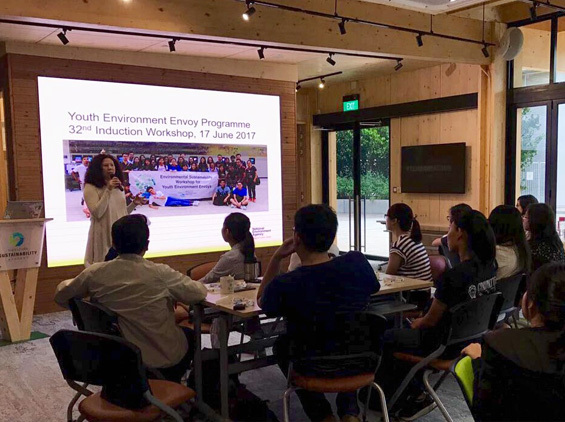 At the workshop, NEA held Environmental Systems Thinking Workshops for their Youth Environment Envoys (YEE), where over 20 future youth leaders received conceptual and practical training on sustainable development. They were groomed to develop teamwork, communication, networking, systems thinking and project management skills by sustainability consultants from Systainability Asia. The workshop also enabled them to design, develop and launch their own environmental projects. 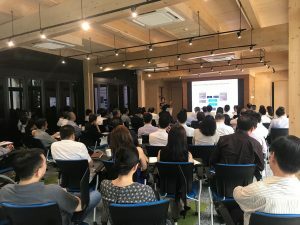 Singapore Exchange Limited (SGX) organized a briefing for 80 directors of listed Catalist companies to learn more about the basics of sustainability reporting, and how a first-time reporter should start. The briefing opened with a welcome by June Sim, Head of Listing Compliance at SGX. Esther An, Chief Sustainability Officer of City Developments Limited, also welcomed participants to the zero-energy Academy and spoke on its vision, mission, and making. Then, Yeo Lian Sim, SGX Special Adviser (Diversity), gave an overview of Sustainability Reporting and the SGX Guide to reporting. Following that, Christopher Chong, Lead ID of Singapore O&G and Chaiman, Emerging Towns & Cities, spoke on Implementing Sustainability Reporting from a Board Director’s Perspective. Finally, Wong Dan Chi, Director of Paia Consulting, gave participants useful pointers from a Sustainability Consultant, on how to begin reporting and the most important things to look out for. This was followed by a panel discussion and Q&A session. The panel comprising Yeo Lian Sim, Esther An, Wong Dan Chi and Michael Tang, Head of Listing Policy & Production Admission, Regulation, SGX, answered questions and alleviated the audience’s concerns about how first-time reporters should start their reporting journey. The directors in attendance benefited from the reporting veterans’ insights and tips. The SSA, a Green Mark Platinum Award development, was featured during the International Green Building Conference (IGBC) as a unique showcase of green building commitment and platform for sustainability advocacy. 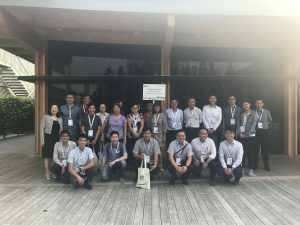 During the conference week, over 60 local and international delegates visited the Academy over 2 days to learn about its green features and practices, as well as the training and networking events in sustainability that it has facilitated. Among them were chief executives of the Green Building Councils of South Africa, South Korea and Malaysia. Chief Sustainability Officer Esther presented on the topic of “Build Green: Be the Change” to all groups of delegates. She shared about how CDL has integrated green building and sustainability into its business for value creation, and the Academy’s role as a showcase of green building commitment and sustainability advocacy. Both tours were supported by technical experts from Schneider and REC, the Academy’s energy monitoring portal and solar panel providers respectively. They elaborated further on the technicalities of the Academy’s green features. In total, the Academy received 60 visitors from Singapore and overseas, who continued to ask questions and explore the Academy after the tour. 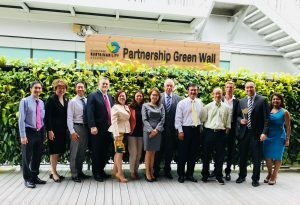 The Royal Danish Embassy of Singapore held a dialogue between high-level leaders in government and the private sector from Singapore and Denmark at the Singapore Sustainability Academy, with a focus on sharing lessons and best practices between two small yet ambitious cities in the fight against climate change. Titled ‘Cities & Citizens Confronting Climate Change’, the event featured presentations by distinguished political and industry leaders, moderated by Ms Jessica Cheam, Managing Editor of Eco-Business. The event opened with a welcome by the moderator, before Her Excellency Dorte Bech Vizard, Ambassador of Denmark to Singapore and Brunei, took the floor to welcome guests from both countries and kick off the dialogue with the thought-provoking message that climate change is the ‘black elephant’ in the room. This was followed by an address by the Guest of Honor, Mr Khoo Teng Chye, Executive Director of the Centre for Liveable Cities, Ministry for National Development, on “Towards a sustainable future”. Mr Khoo touched on how Denmark and Singapore are small in size, but can be hugely influential in stirring others to become more sustainable. Then, Mr Morten Kabell, Mayor of Technical & Environmental Affairs, City of Copenhagen, spoke on “How cities can and should act”. Mr Kabell emphasized the need for mutual learning and collaboration between Singapore and Copenhagen, giving examples of climate-friendly practices from both cities. Following that, Ms Esther An, Chief Sustainability Officer, City Developments Limited (CDL), shared on “How to grow a ‘green force’ in cities”, citing how CDL has engaged its key stakeholders on the need to be sustainable through education and empowerment. Finally, Mr Andreas Maaløe Jespersen, Associate Researcher at iNudgeyou, spoke about his experience in “Getting citizens to go green” through behavioral economics principles. The presentations were followed by a lively panel discussion and audience dialogue. The panel comprising Mr Morten Kabell, Ms Esther An and Mr Andreas Maaløe Jespersen took questions from the moderator and audience on the challenges and opportunities arising from cities’ fight against climate change, with inputs from Mr Khoo Teng Chye. The event, attended by representatives from government agencies, academia, research and industry, ended on a high note with the audience continuing to interact with panelists and exchange insights over lunch. 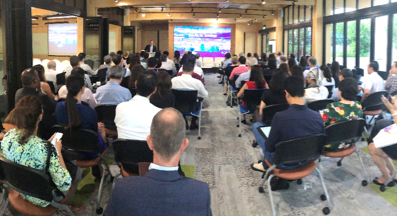 CDL hosted over 70 local and international participants of NTU’s annual Asian Business Case Competition (ABCC) at the Singapore Sustainability Academy on the 4th of September. 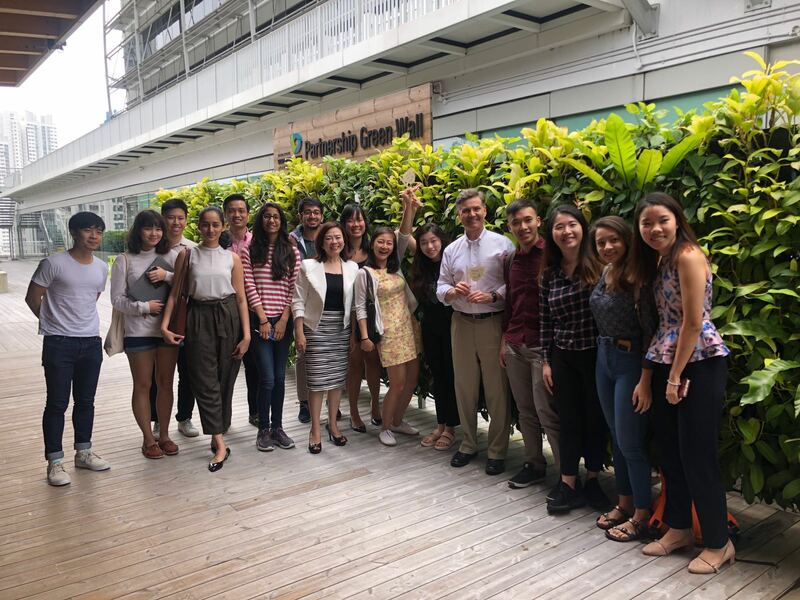 The students from countries like Hong Kong, Thailand, Japan, Australia, New Zealand and Canada were in Singapore to participate in the 6-day case competition, targeted at encouraging NTU students to delve further into the topic of sustainability. As a Platinum Sponsor, CDL worked closely with the organizers to develop the competition’s main case study, which exhibited leadership in sustainability for their Sustainable Enterprise Challenge (SEC). 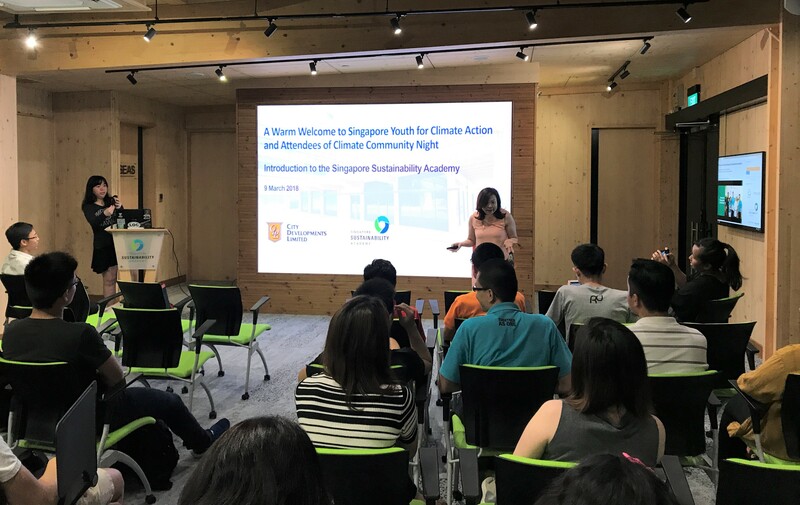 At the zero-energy Academy, Esther An, CDL Chief Sustainability Officer,, shared with participants about CDL’s sustainability journey and the vision and mission of the Academy. 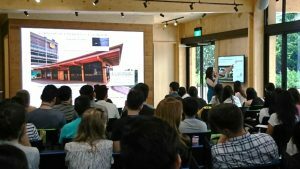 The students were also given a tour of the zero-energy Academy, which highlighted some of the key green features of the space such as its use of sustainable, Nature’s Barcode™ verified wood, solar panels, and real-time energy consumption tracker. 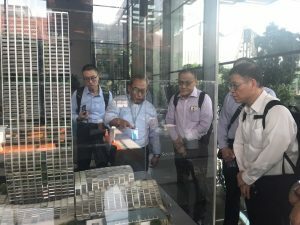 The participants were enthused and asked many questions about the sustainable features of the building and how CDL fits into the bigger picture in terms of sustainability in Singapore. The National Environment Agency (NEA) held their annual pre-school Environmental Education Advisor (EEA) Networking Session at the Academy. The session provided a platform for pre-school EEAs to network and learn more about the initiatives that NEA and its partners are rolling out. Over 80 pre-school teachers and advisers attended the interactive and lively session on 4th September 2017, where they learned about best practices in environmental education through booths and sharing sessions from guest spears and experienced pre-school EEAs. To introduce NEA’s new Uniformed Group (UG) Badge Programme which adopts a Values In Action approach, NEA held a dedicated session for teachers working with scouts on 19 August 2017, at the Academy. Through a half-day workshop with interactive activities and games, the teachers effectively learned about the two badges, “Keep Singapore Clean” and “Resource Conservation”, which are aligned to NEA’s Guiding Principles, “Let’s Be Considerate” and “Let’s Not Be Wasteful”. 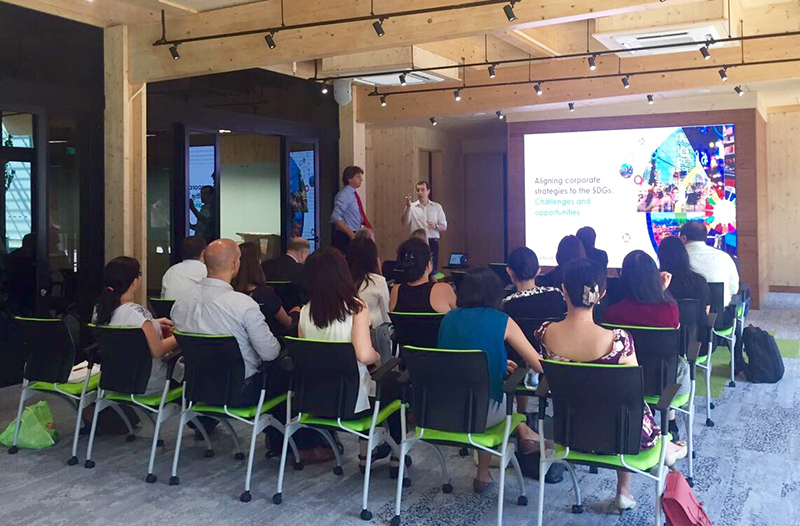 CDL, in collaboration with Interface, held its first Sustainability Thought-Leadership Forum on Building a Circular Economy at the Academy. 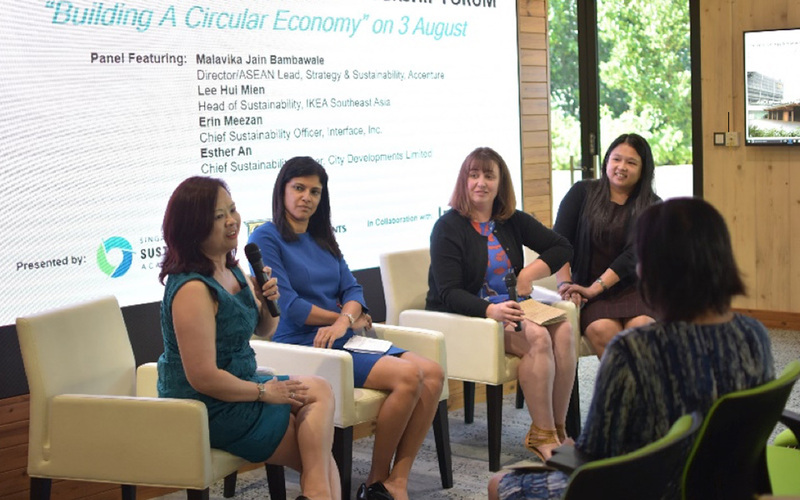 At the session, Malavika Jain Bambawale, Director/ASEAN Lead, Strategy and Sustainability, Accenture, shared about the five circular economy business models, showing examples of businesses that have successfully adopted them. The presentation was followed by an engaging panel discussion featuring Erin Meezan, Chief Sustainability Officer, Interface; Lee Hui Mien, Head of Sustainability, IKEA Southeast Asia and Malavika Jain Bambawale, and moderated by Esther An, Chief Sustainability Officer, City Developments Limited. They discussed how businesses can create business value by shifting away from the linear model, while making the circular economy attractive to consumers and investors. The Academy was packed with over 100 guests from the People, Public and Private sectors. The panellists took questions from a highly-engaged audience, which was followed by a networking session where guests continued to exchange insights. 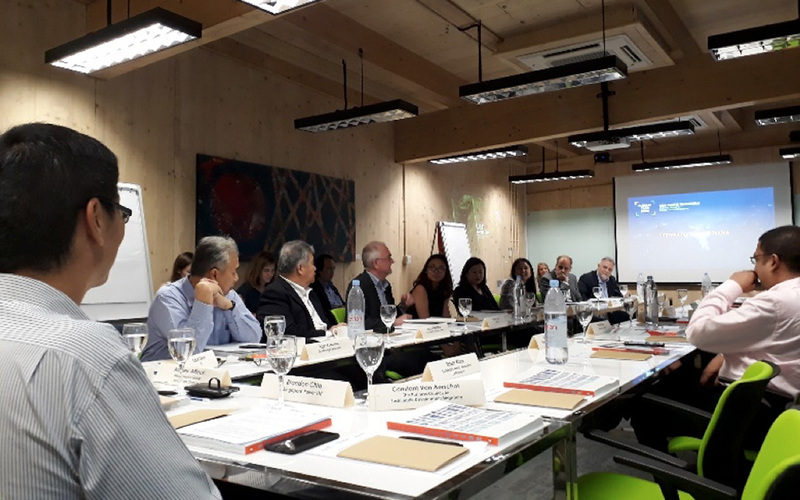 Global Initiatives, in partnership with Interface, held a roundtable with 21 regional sustainability experts from the business, government, NGO and academia sectors to share insights and perspectives on cross-sectoral collaboration to address climate change. Ms Erin Meezan, Chief Sustainability Officer of Interface, first addressed the group on Interface’s Climate Take Back initiative. Senior representatives from the building, energy, consumer goods and agricultural sectors then had a fruitful discussion on how industries can move towards a low-carbon economy, moderated by Mr Tony Gourlay, CEO of Global Initiatives. 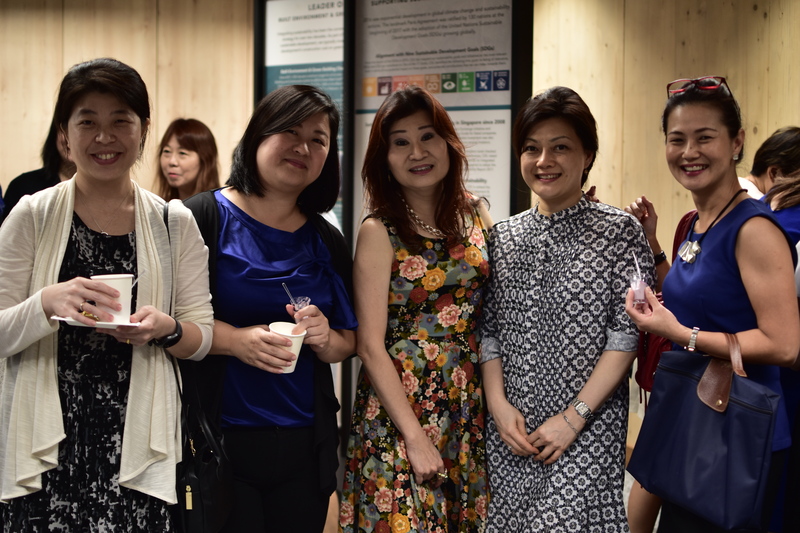 After the Roundtable, Global Initiatives hosted a cocktail networking session to mark the launch of the Responsible Business Forum Singapore 2017 and their #SDGActionNow campaign, co-organised with the United Nations Development Programme. They also unveiled the campaign video featuring CDL as an example of best practice for UN SDG 11: Sustainable Cities and Communities. In its 7th edition, the CDL-GCNS Young CSR Leaders Award was launched in 2011 as a cross-sectoral programme to cultivate a new generation of young leaders to champion a sustainable future for Singapore and beyond. 10 finalist teams from various universities, polytechnics and junior colleges/high schools were selected from a competitive pool of over 130 student teams – a record number of sign-ups for the competition. 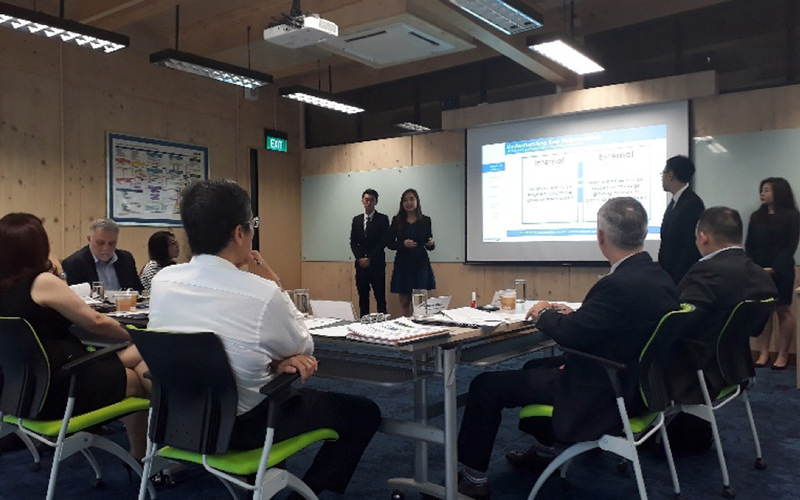 The teams gave impressive presentations before an esteemed judging panel on their proposed sustainability strategy and initiatives for 10 company cases, namely AkzoNobel, APRIL, Cargill, DSM, EY, Hong Leong Asia, Informatics, Singtel, Suntory and Veolia. The judging panel comprised of Ms Esther An, Chief Sustainability Officer, City Developments Limited; Mr Lee Kheng Seng, Director of Communications and 3P Partnerships, Ministry of Environment and Water Resources; Mr Tony Gourlay, CEO, Global Initiatives; Mr Steven Okun, Governor, American Chamber of Commerce and Ms Christina Lee, Founder and CEO, Global Green Economic Forum. The winners will be announced and awarded at the GCNS Summit on 29 August. A partner of the Academy, Interface held an Ideation workshop with Forum for the Future, along with a networking event, to gain insights from industry peers about the future of learning, as well as discuss solutions to create spaces that will positively address our changing needs. 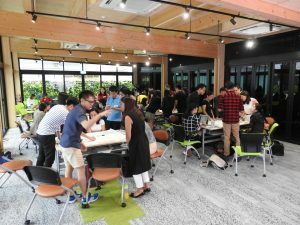 The workshop, titled The Future of Learning Spaces in Asia Pacific, was a highly interactive ideation exercise involving a group of architects, designers, educators and entrepreneurs. Besides gaining industry insights, the workshop helped participants co-create potential innovative responses to emerging change. The networking session, titled Creating Positive Spaces of Tomorrow, Today, involved professionals in the built environment. A panel of consisting of Tan Shao Yen, Chief Executive Officer, CPG Consultants and President, Board of Architects, Singapore; Jayne Harrison, Founder & Principal, JDH Architects; Robin Hales, VP Product APAC, Interface; and Anna Simpson, Senior Associate, Forum for the Future and Author of The Innovation-Friendly Organisation, discussed design solutions proven to impact factors like occupants’ productivity and creativity while creating a positive impact on our planet. 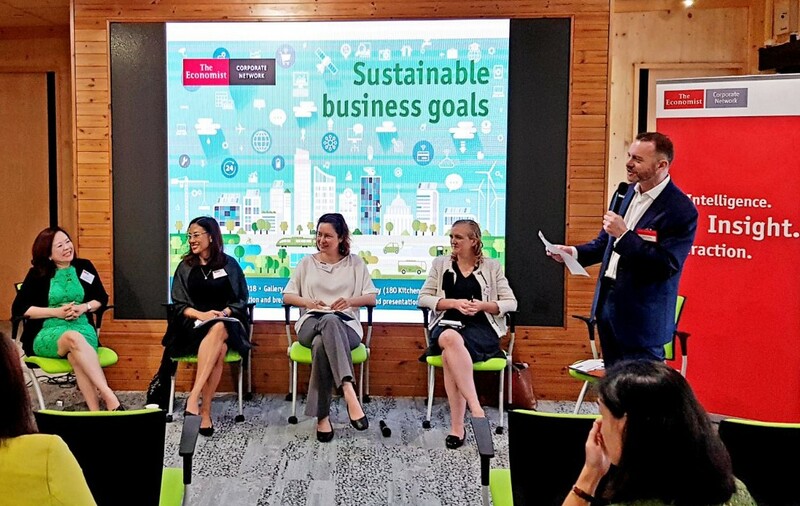 In conjunction with its Annual General Meeting and Management Committee Meeting, Global Compact Network Singapore held a thought leadership event titled The Future of Sustainability and Reporting for Corporate Sustainability. 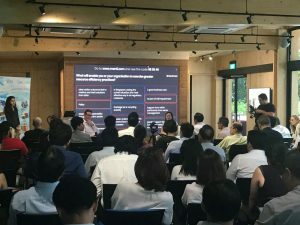 Attended by nearly 100 members, including companies such as Shell, Singapore Business Federation, Singapore Pools and NTUC, the event addressed frequently asked questions about integrating the Sustainable Development Goals (SDGs), and how to report on a company’s efforts to achieve them. 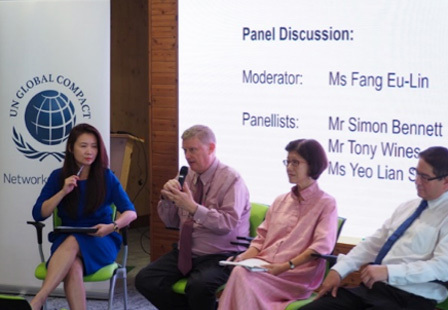 Speakers on the panel were Ms. Esther An, Chief Sustainability Officer, City Developments Limited; Mr. Simon Bennet, General Manager (Sustainable Development), Swire Pacific Offshore Operations; Mr. Tony Wines, CEO, Turnkey Group; and Ms. Yeo Lian Sim, Special Adviser, Singapore Exchange. They shared how opportunities could be found by embracing the SDGs, as well as the use of corporate reporting as a strategic tool in business. The event concluded with a panel discussion with the speakers, moderated by Ms. Fang Eu-Lin, Partner, Pricewaterhouse Coopers LLP. About 40 students, mostly from universities and polytechnics, attended the National Environment Agency Youth Environment Envoy workshop. Held on 17 to 18 June 2017 at the Singapore Sustainability Academy, its aims to groom a network of youth to become leaders and change agents. 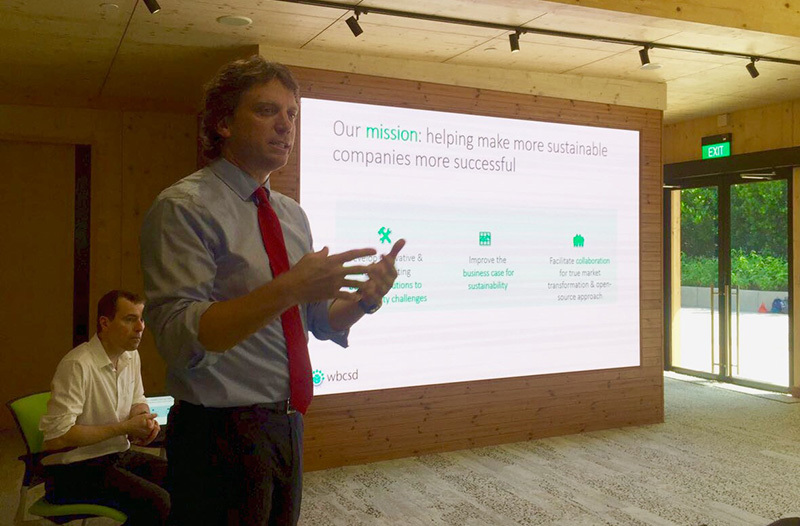 CDL shared the importance of embracing sustainability for businesses and corporates, and facilitated discussion alongside presenters from MEWR and Earth Fest. In conjunction with World Environment Day, the Singapore Sustainability Academy was officially opened by Mr. Teo Chee Hean, Deputy Prime Minister and Coordinating Minister for National Security, together with Mr. Masagos Zulkifli, Minister for the Environment and Water Resources. Jointly created by City Developments Limited and the Sustainability Energy Association of Singapore, the Academy is the first major People, Public and Private (3P) ground-up initiative in support of global and national goals to tackle climate change. The opening also introduced many of the Academy’s initiatives, such as the Women4Green Network, and the Sustainability Studio. Over 160 invited guests attended the opening, including notable names such as the Canadian High Commissioner Lynn McDonald; Mayor Teo Ho Pin, North West CDC; Mr. Choi Shing Kwok, Permanent Secretary, Ministry of the Environment and Water Resources; amongst many others. For more information, please refer to the press release here. 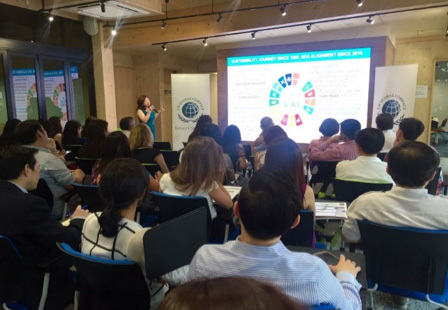 CSR Asia hosted Global Reporting Initiative (GRI) for a session on the value and challenges of corporate sustainability reporting in an evolving landscape. The event provided a unique opportunity for an open conversation with GRI about the concerns and needs around transparency. Mr Timothy Mohin, Chief Executive, GRI shared about the organisation’s reporting standards and the future of corporate sustainability reporting, fielding many questions from the floor about the opportunities and challenges of reporting a company’s sustainability efforts. 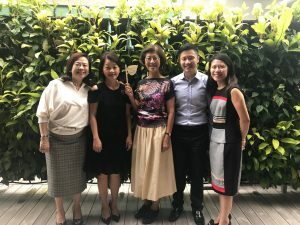 CDL also shared on its sustainability reporting experience and how GRI’s reporting standards have complemented CDL’s corporate sustainability journey, enabling it to effectively connected the company’s ESG disclosures with financial impact to communicate tangible value creation for its investors and stakeholders. The Business Council for Sustainable Development (BCSD) held a roundtable session on “Aligning corporate strategies to the United Nations Sustainable Development Goals (SGDs): Challenges and opportunities”. The session also introduced World BCSD’s CEO Guide to the Sustainable Development Goals. Presented by Mr Filippo Veglio, Managing Director, Social Capital, World BCSD, the session explored the crucial role that business should play in achieving the SDGs as well as positioning clear actions that business leaders can take to align their organizations with the SDGs and unlock the value they represent. The audience was provided with a comprehensive overview of the key implications for business across the spectrum of risk, opportunity, governance & transparency, and the need for collaborative action. 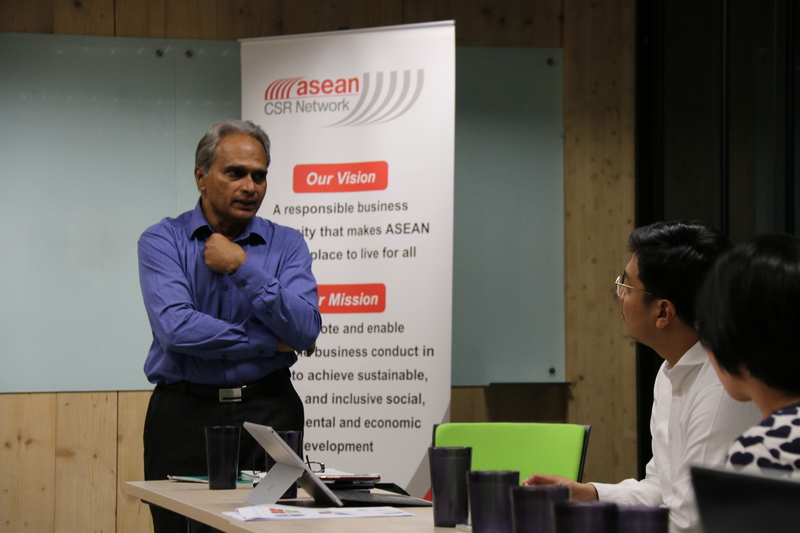 The CSR Asia Strategic Partners Gathering was held at the Academy 19 April. 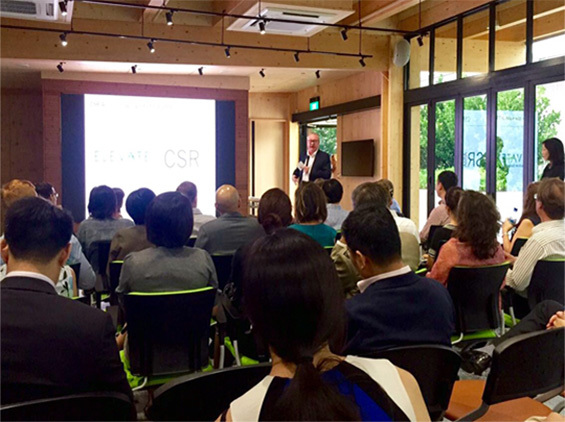 During the session, Richard Welford, one of the founders and the chairman of CSR Asia shared on the merger between CSR Asia and ELEVATE, a leading professional services firm delivering improved social, environmental and business performance in the global supply chain. 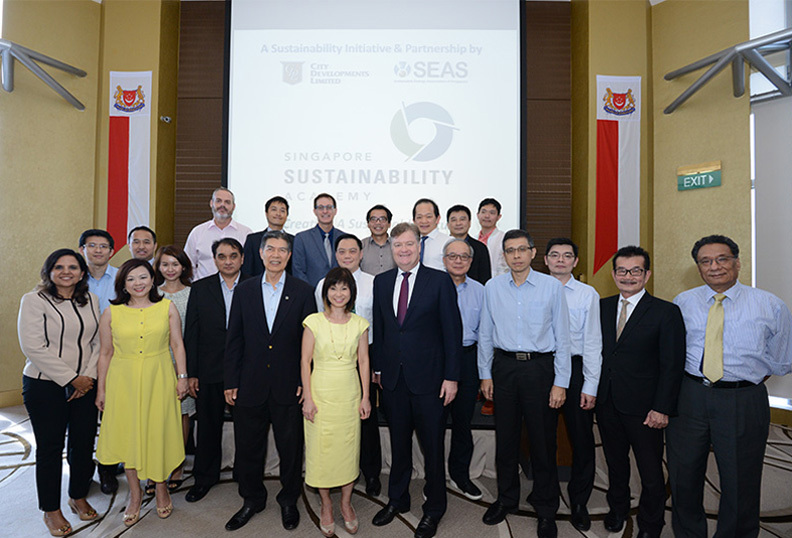 CDL and the Sustainable Energy Association of Singapore (SEAS) announced the launch of the Singapore Sustainability Academy on 5 August as the first major People, Public and Private (3P) ground-up initiative in support of the national goals to tackle climate change. This is also the first time that a local private property developer and a Non-Profit Organisation have teamed up to create a major training and networking facility on sustainability. The launch was graced by Dr Amy Khor, Senior Minister of State, Ministry of the Environment and Water Resources. The zero-energy academy is set to promote a low-carbon economy, resource efficiency, and sustainable practices among businesses and the community, in particular, youths. Jointly designed by CDL and ONG&ONG Pte Limited, and built by Woh Hup (Private) Limited, the SSA will be the first in Singapore to have its construction materials, Cross Laminated Timber and Glued Laminated Timber verified by the Nature’s BarcodeTM system as coming from responsible sources.